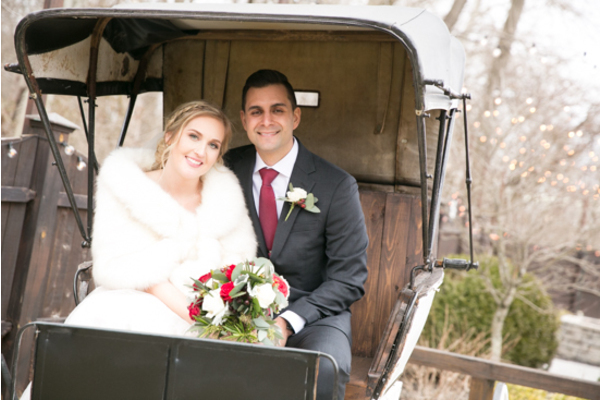 Congratulations to Lexi and Nick on their marriage! 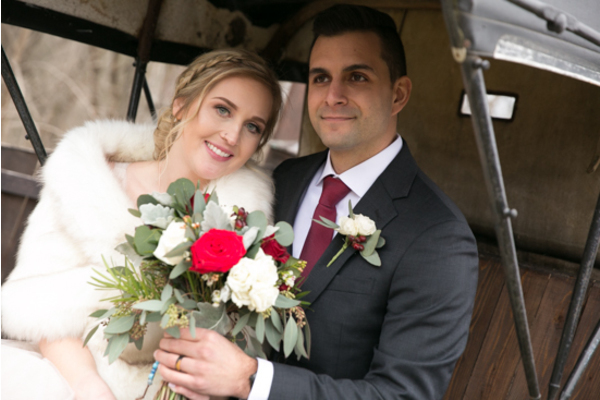 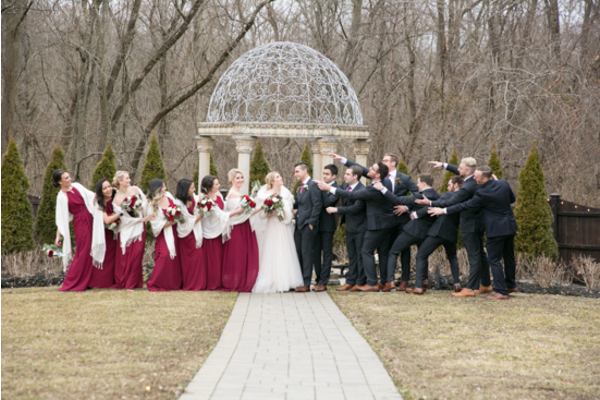 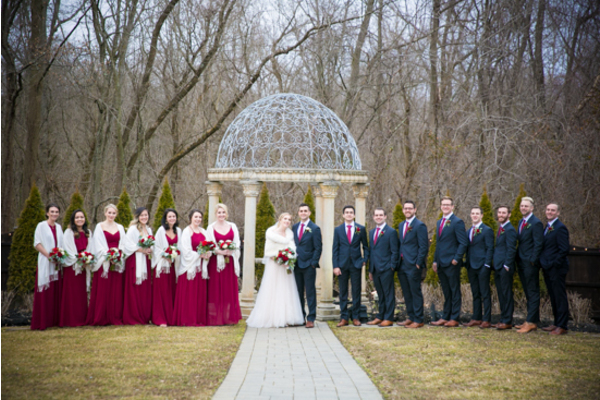 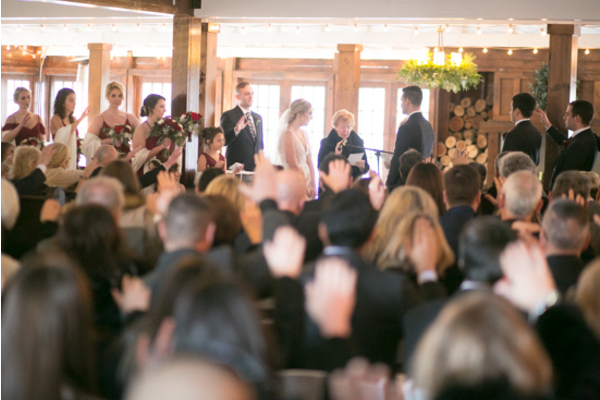 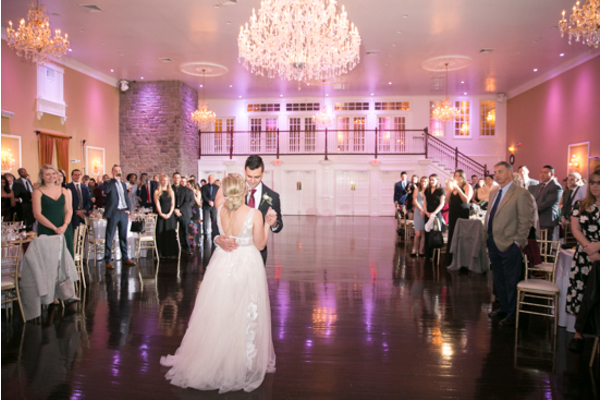 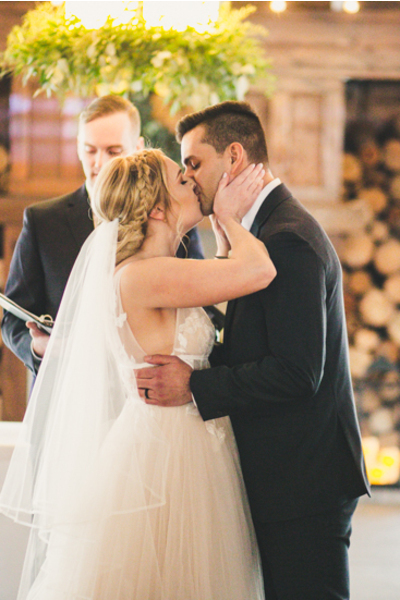 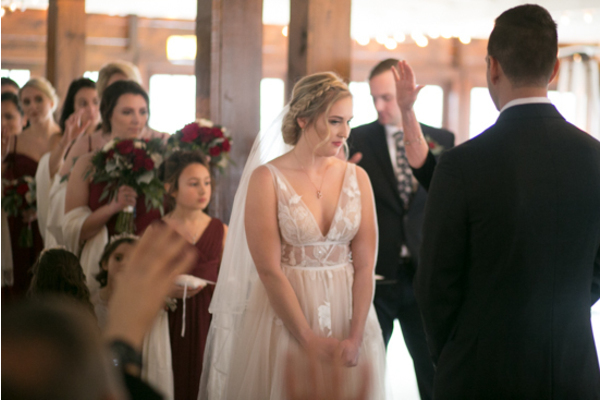 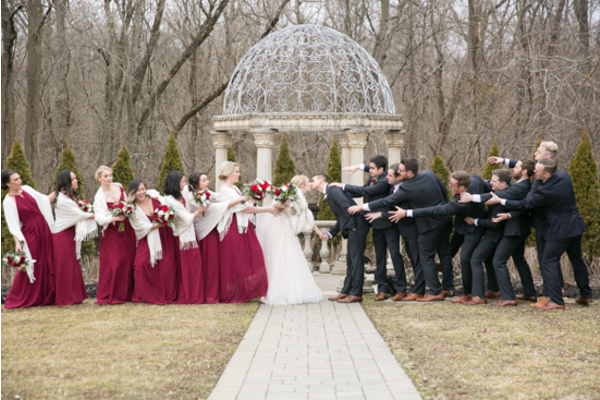 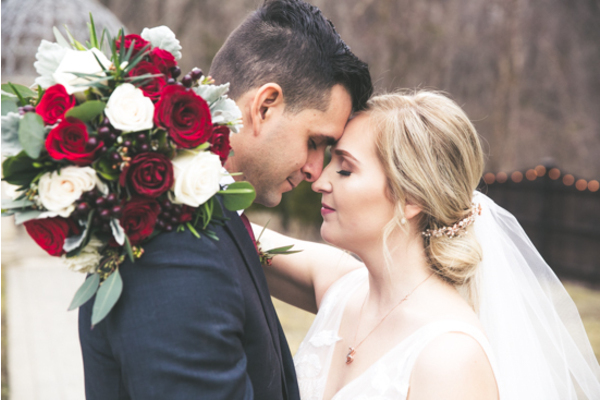 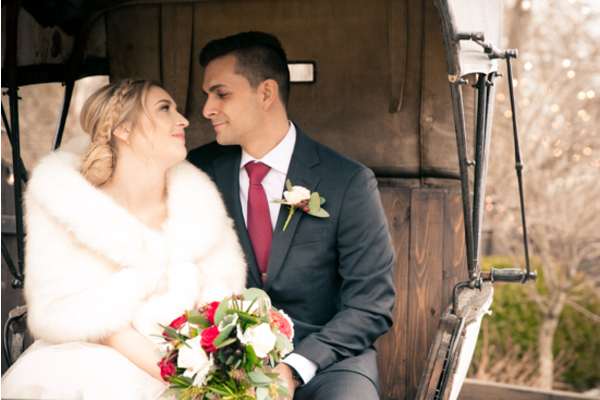 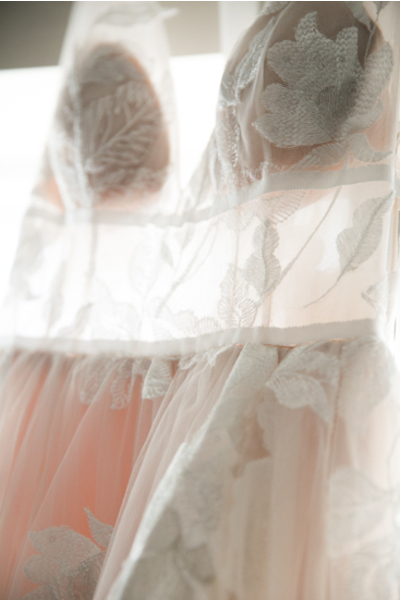 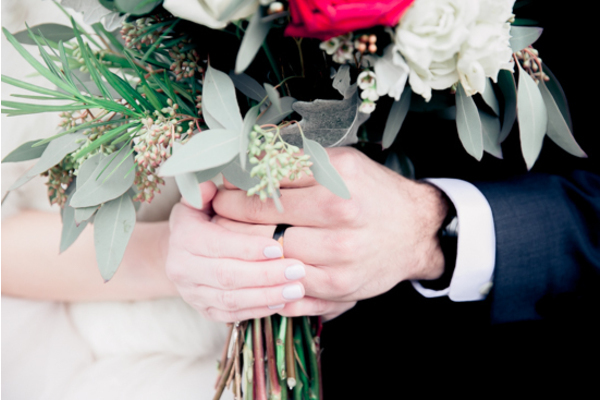 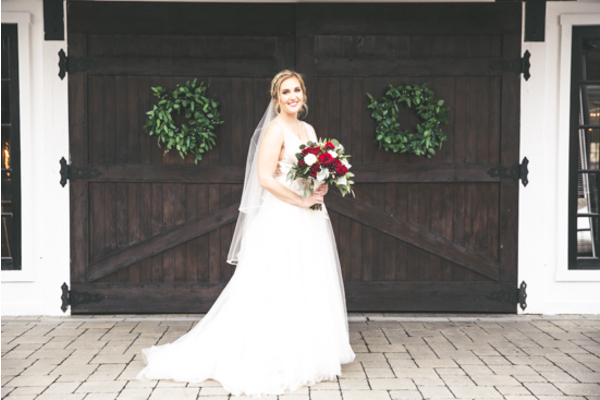 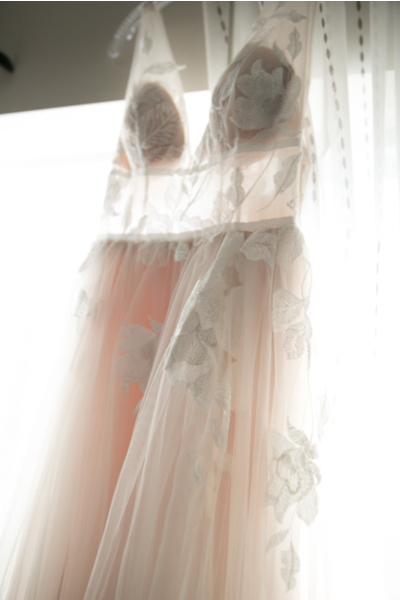 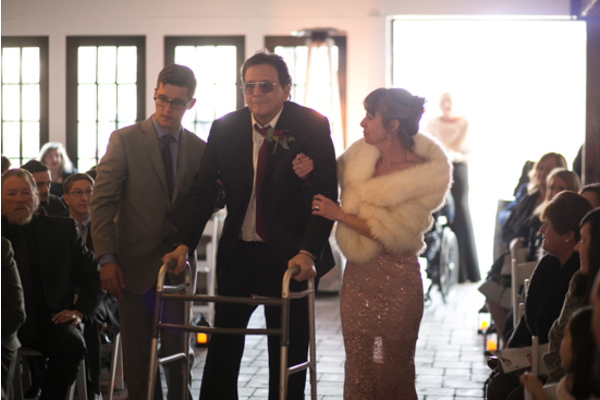 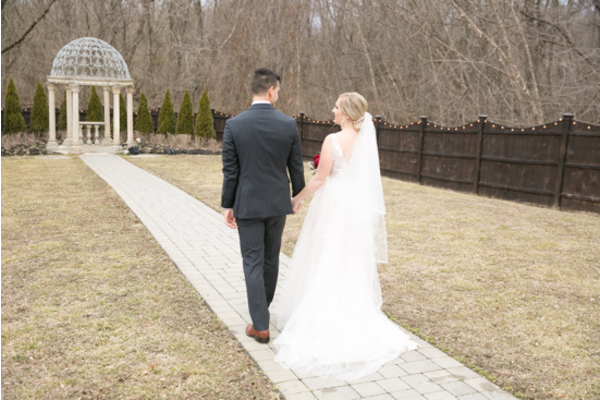 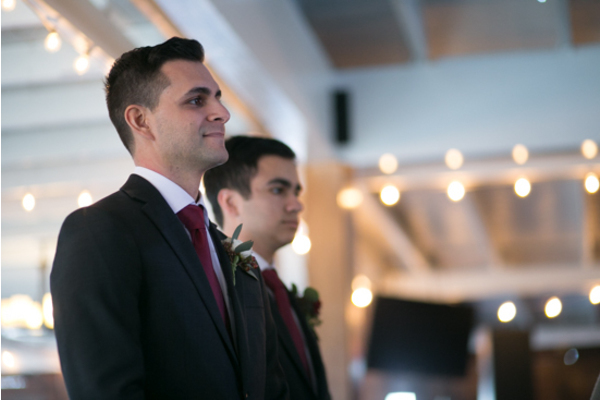 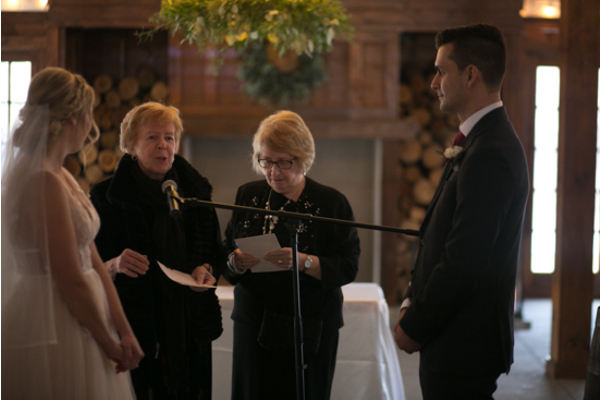 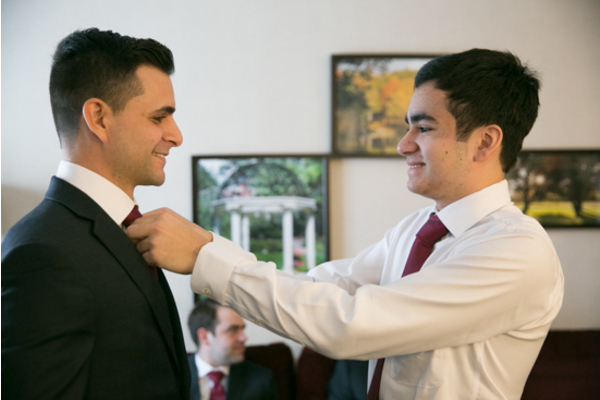 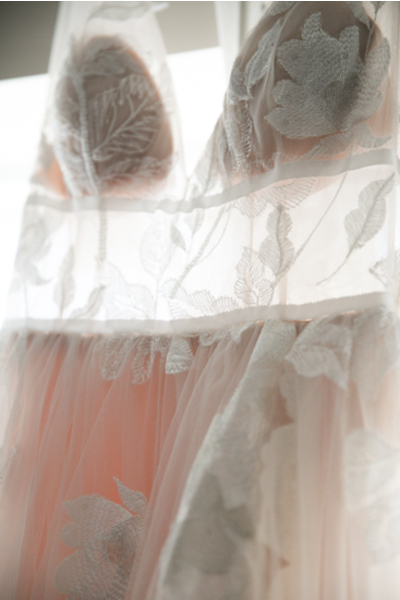 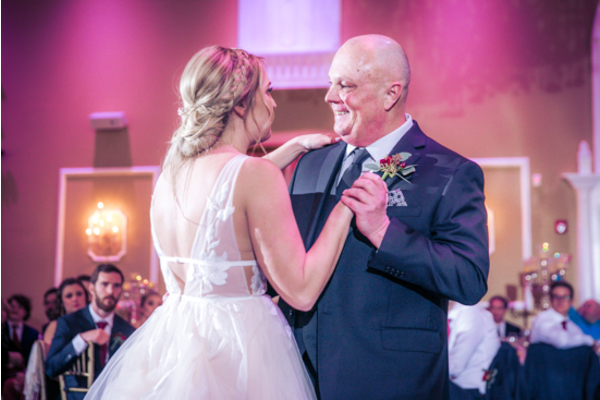 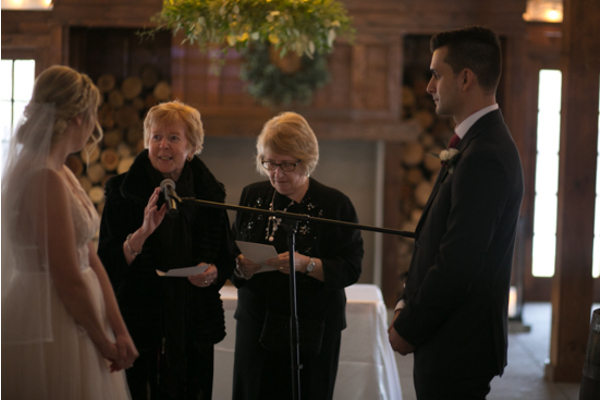 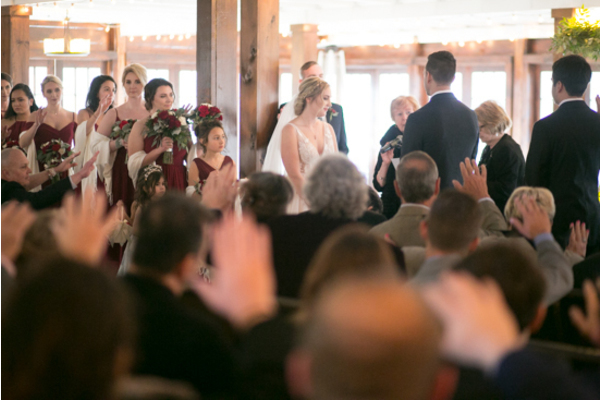 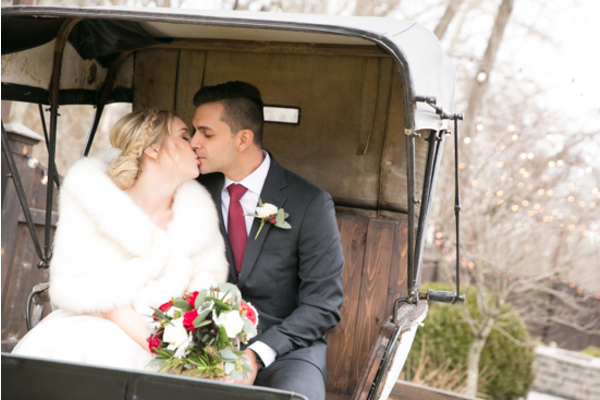 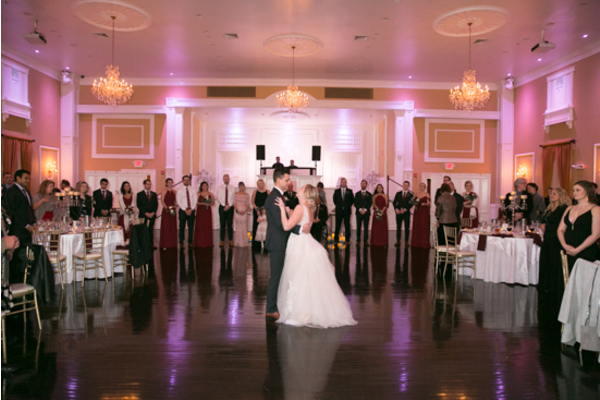 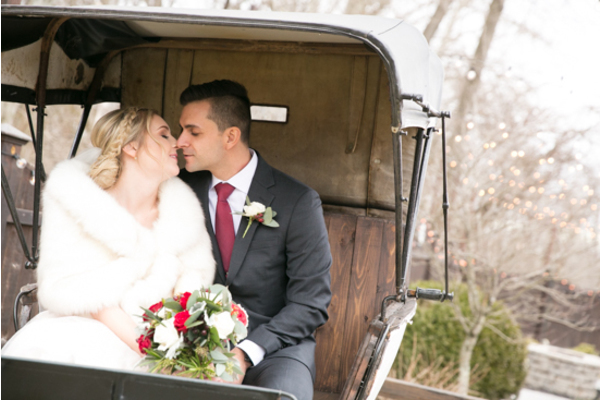 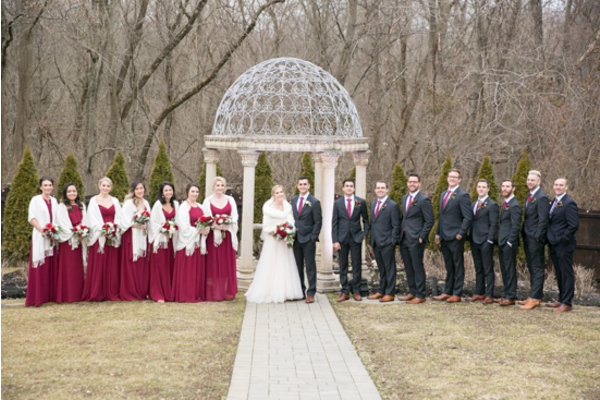 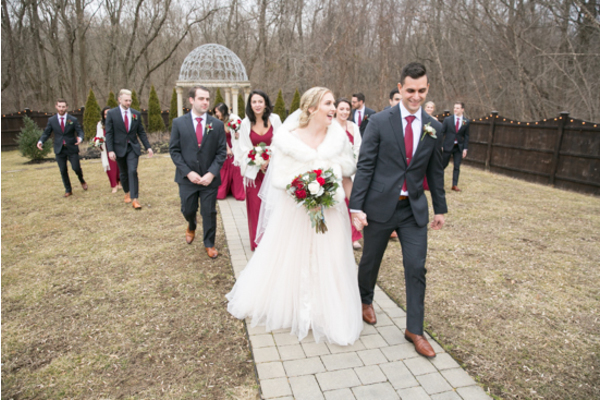 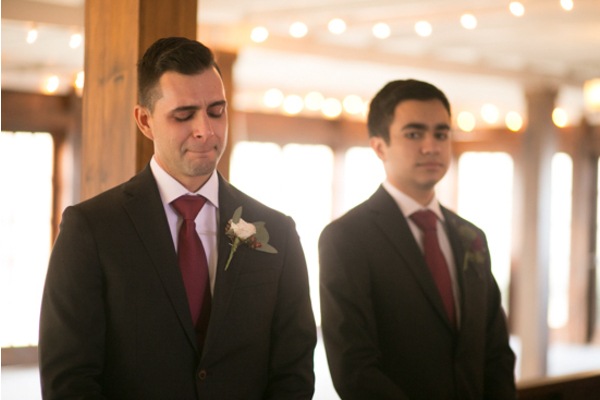 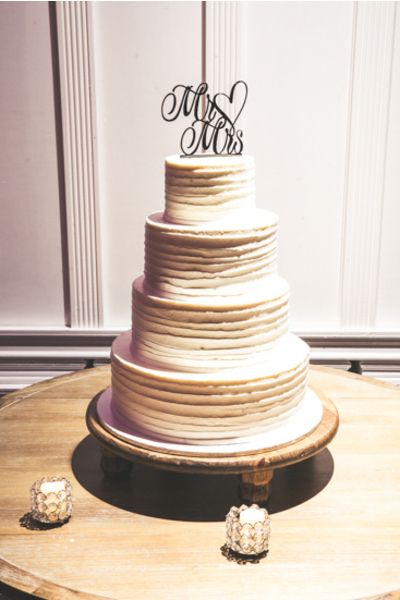 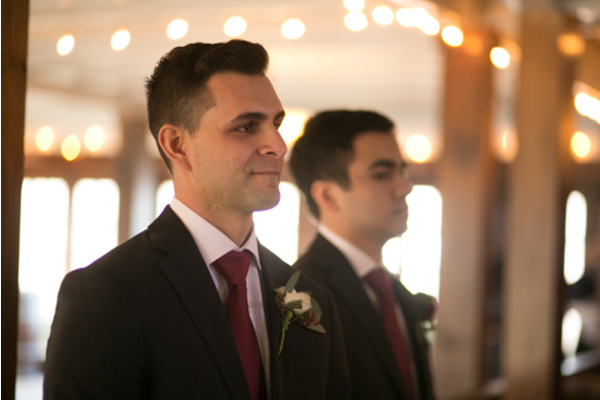 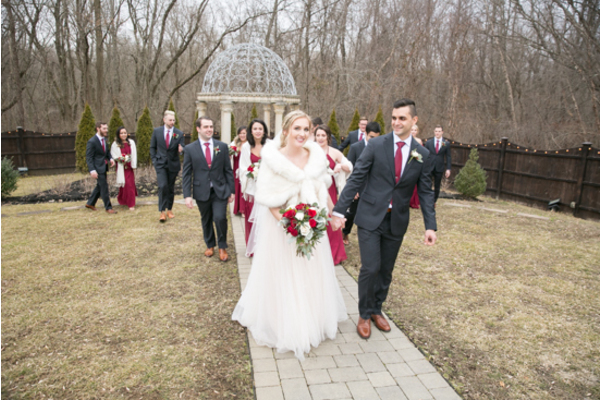 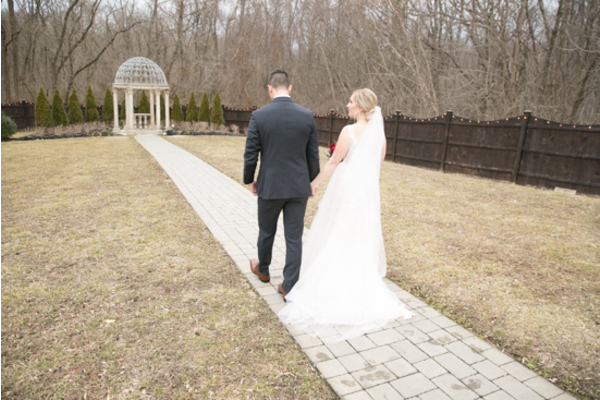 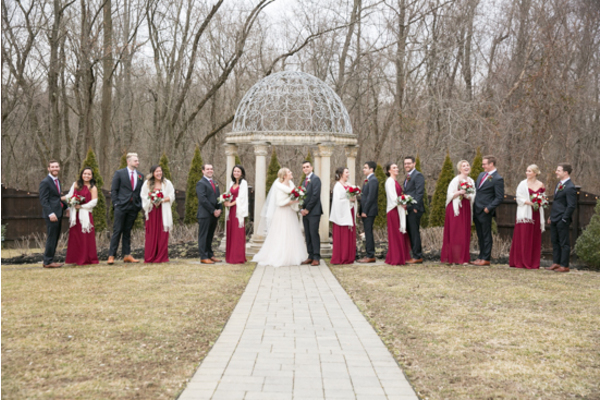 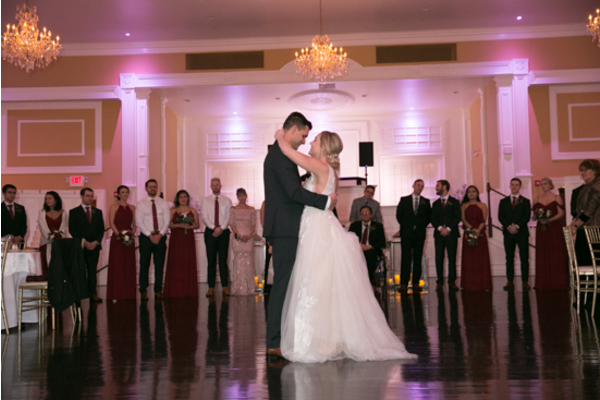 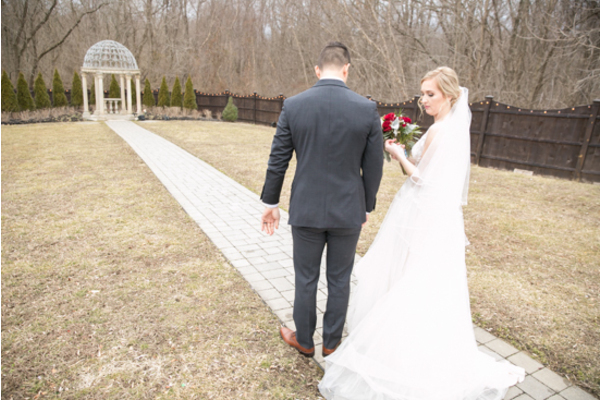 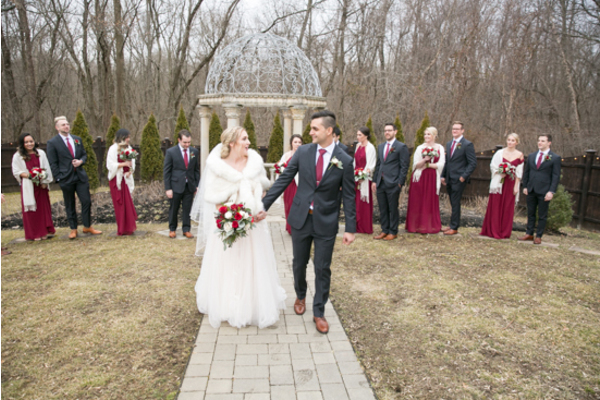 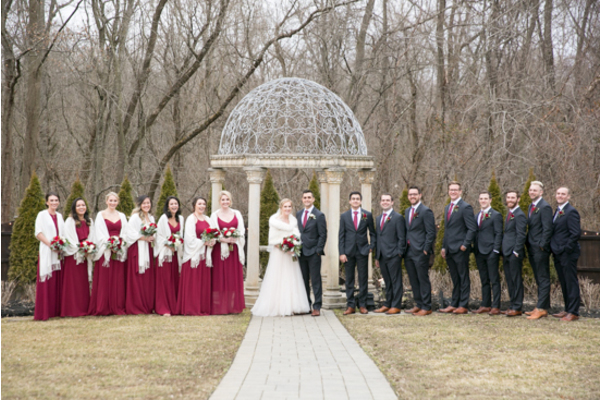 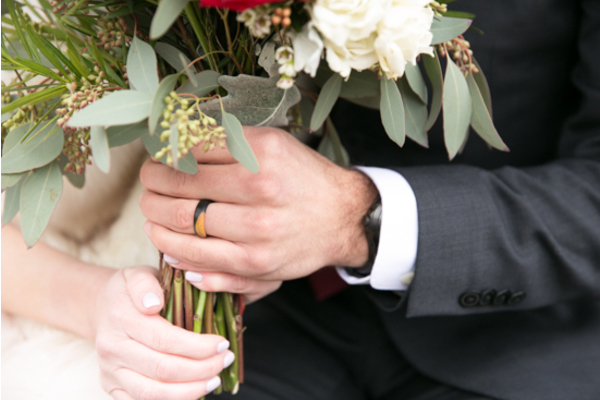 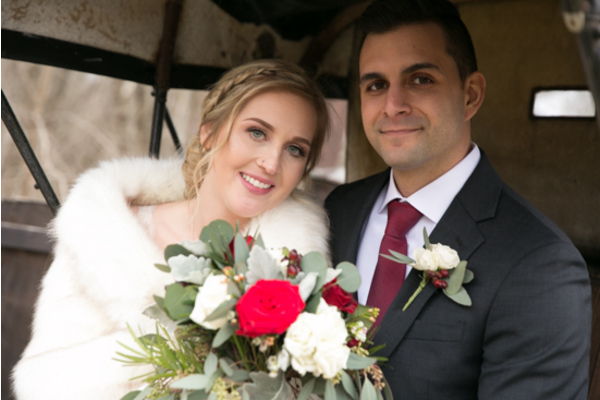 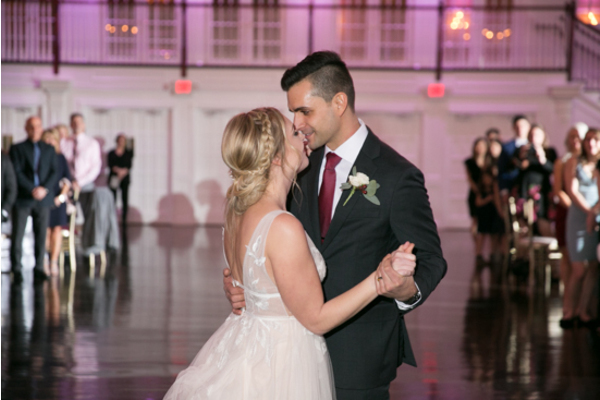 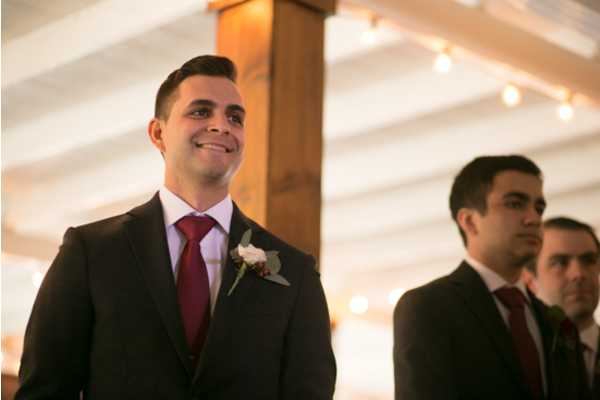 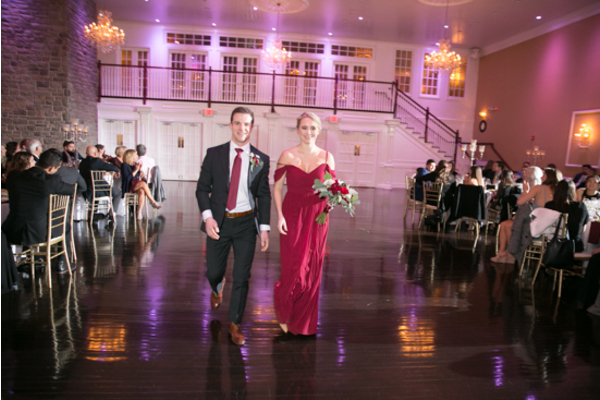 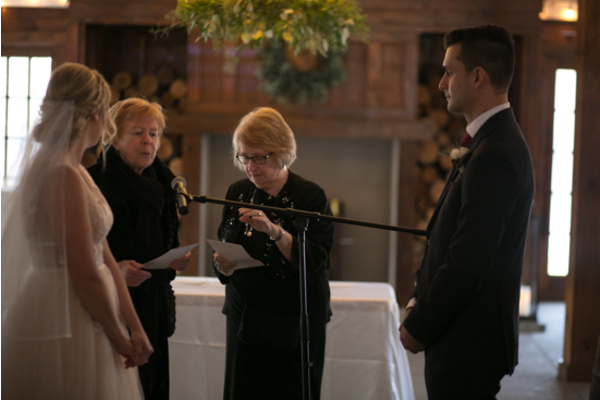 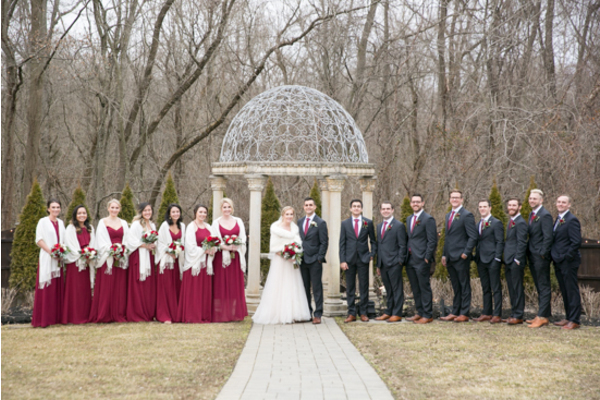 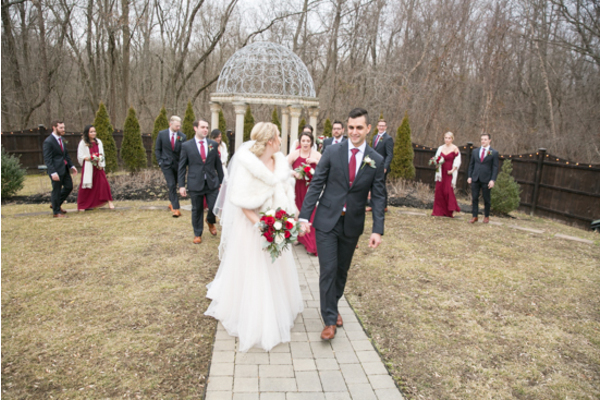 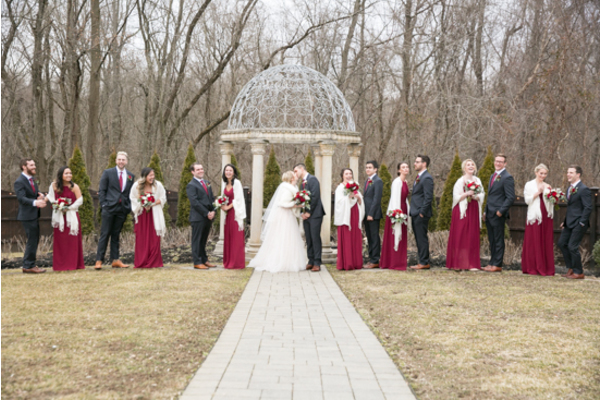 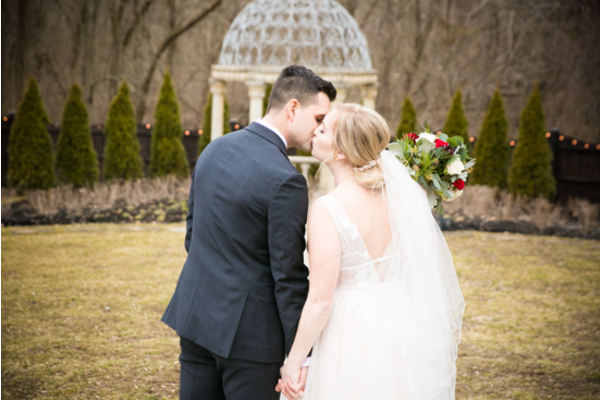 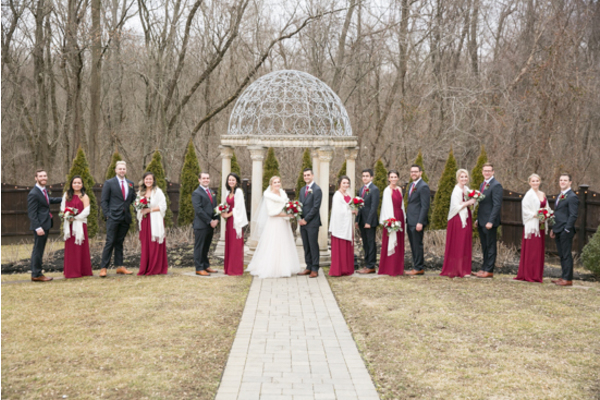 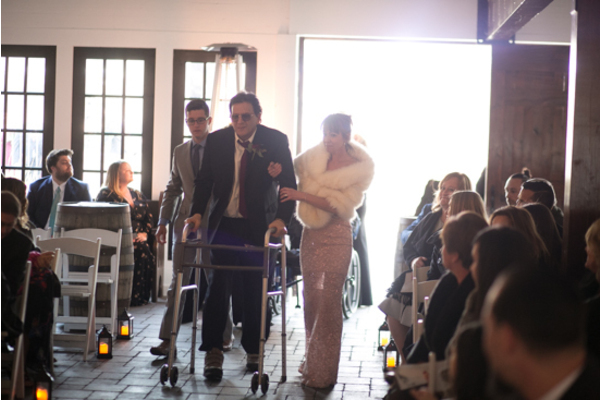 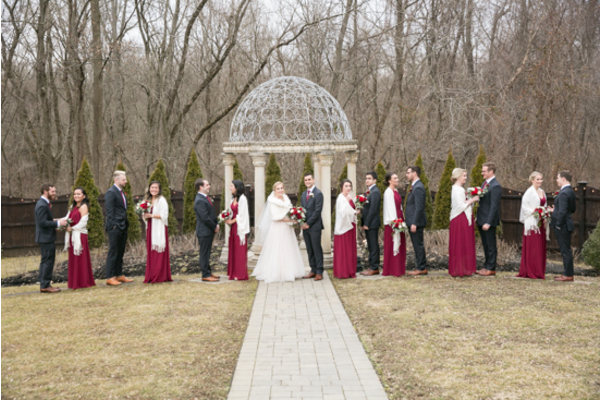 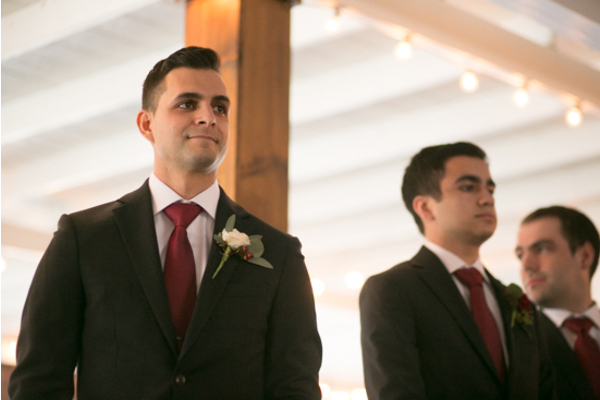 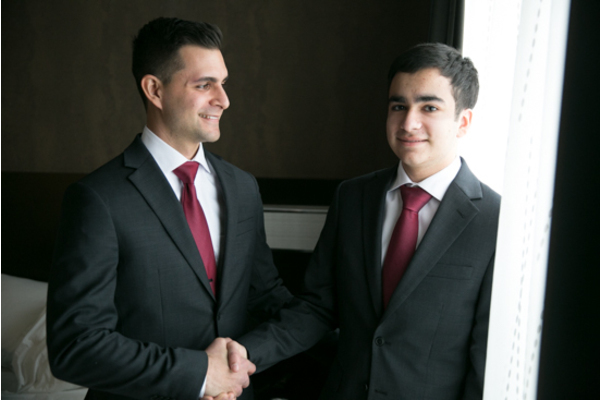 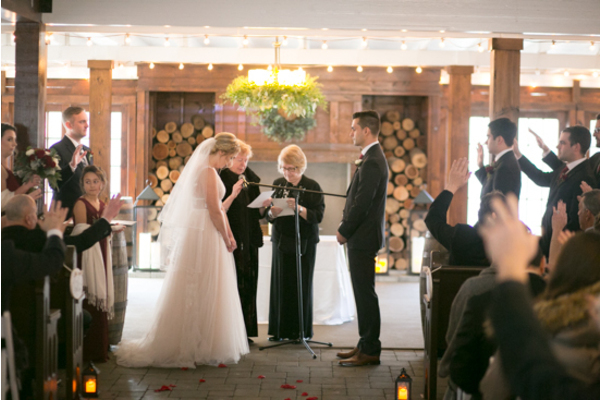 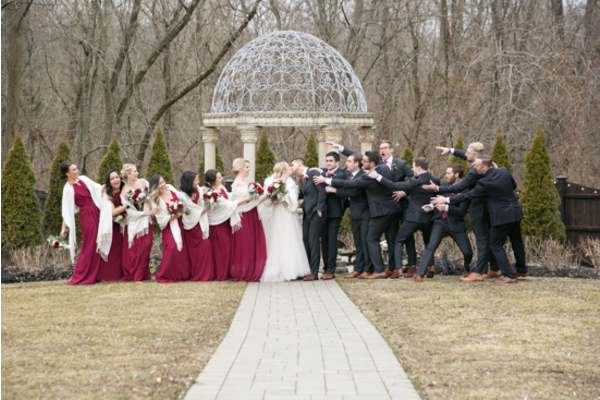 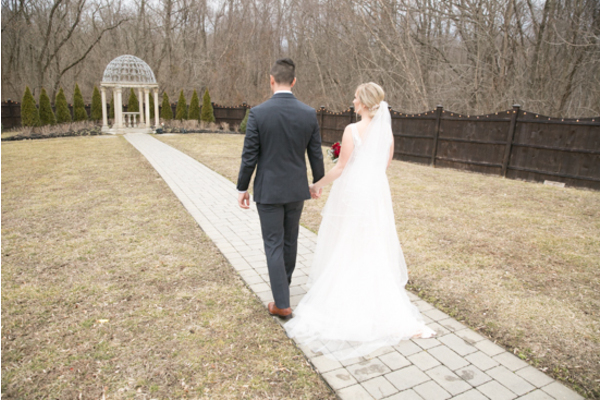 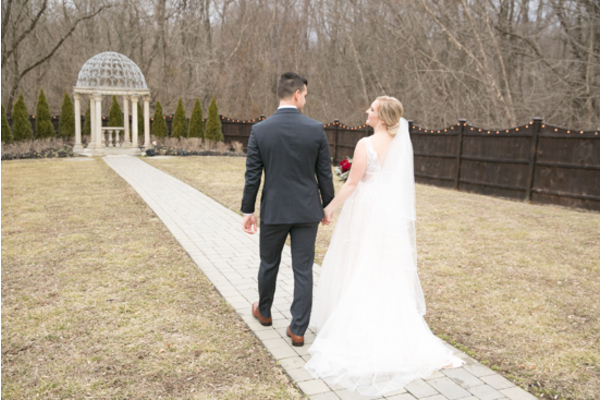 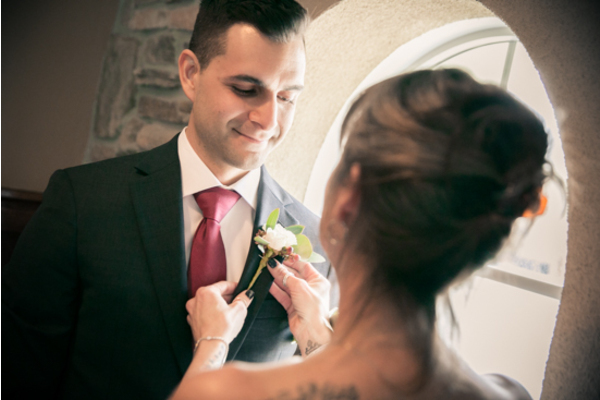 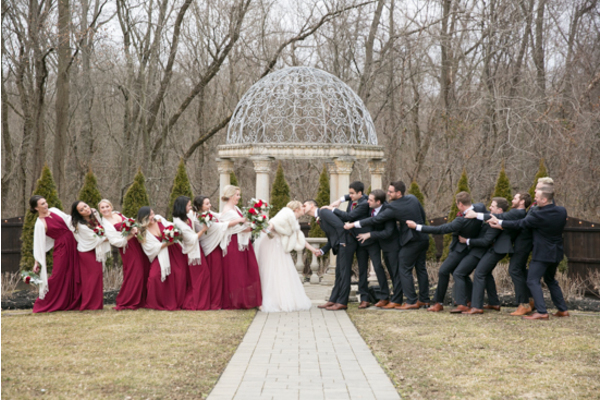 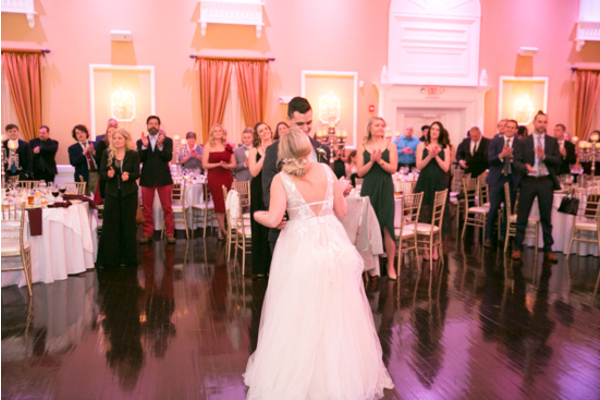 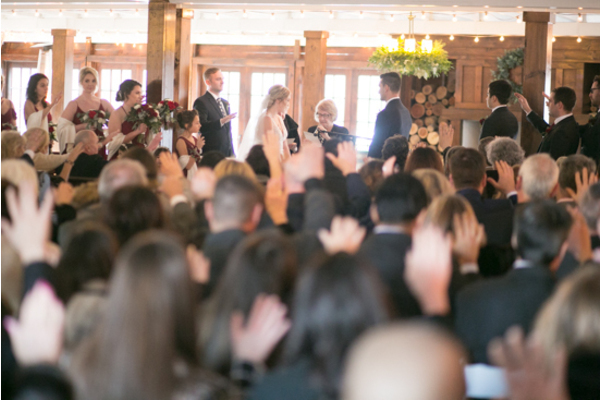 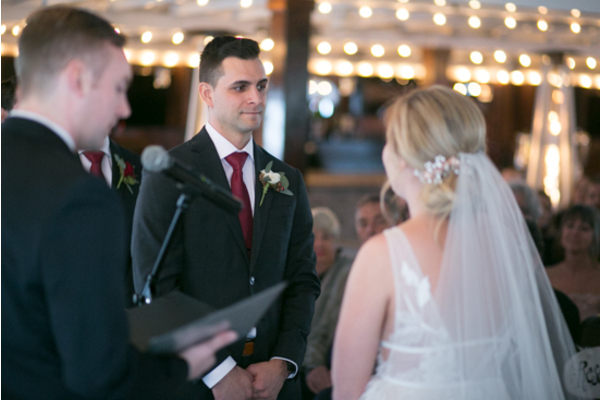 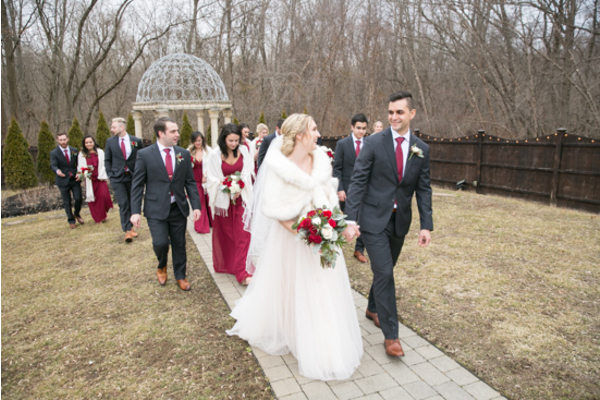 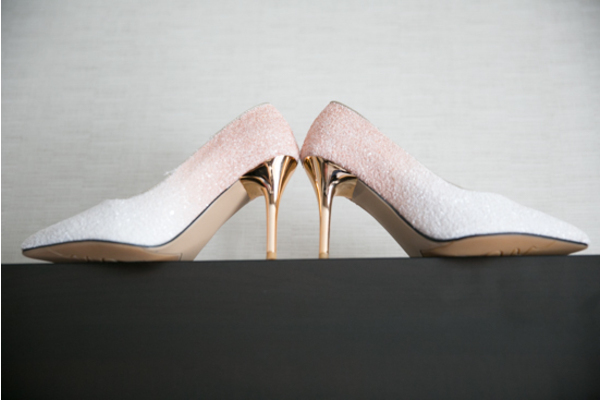 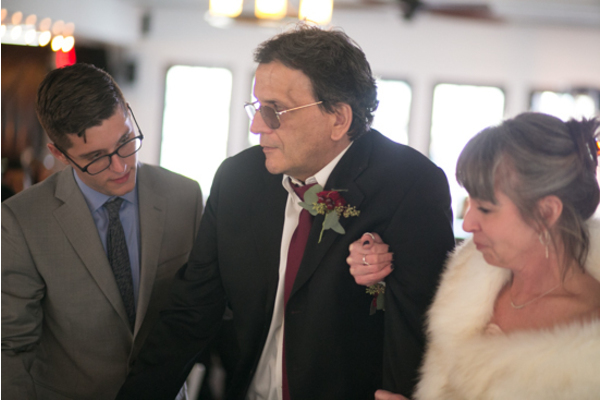 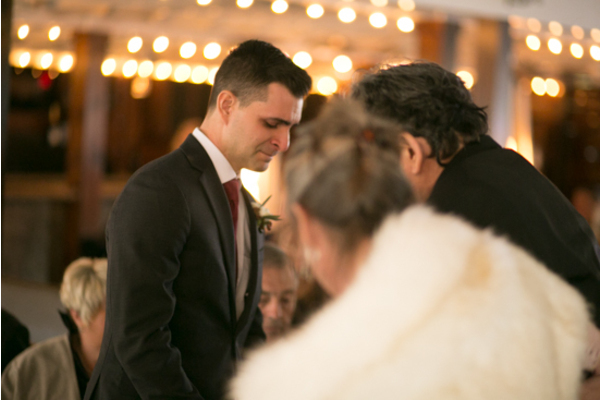 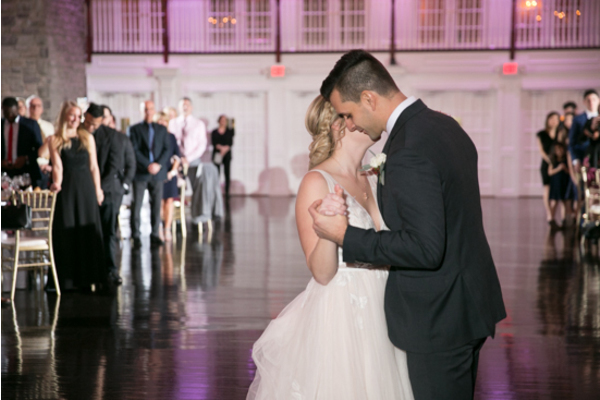 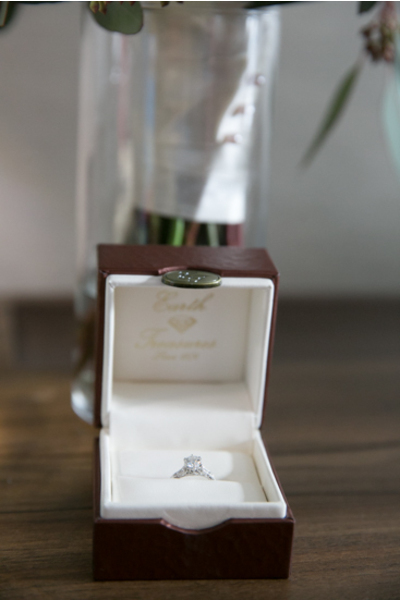 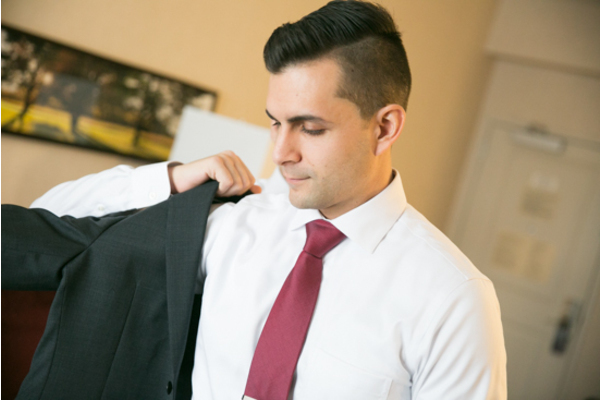 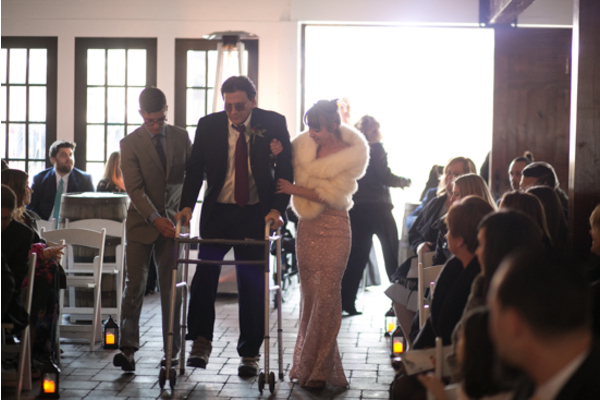 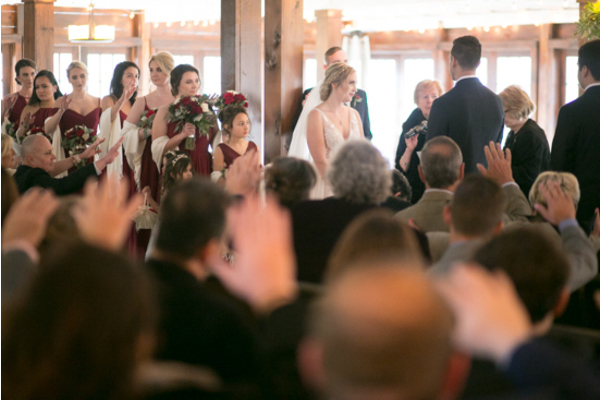 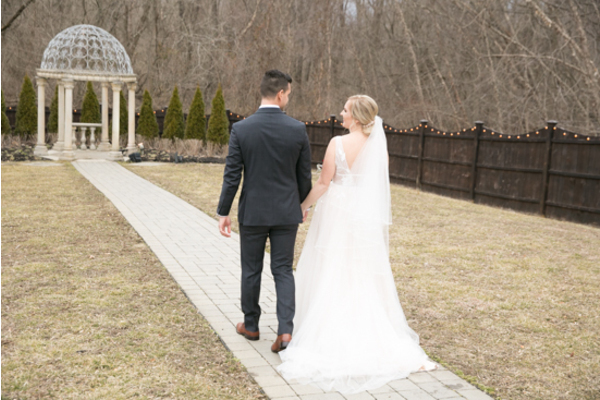 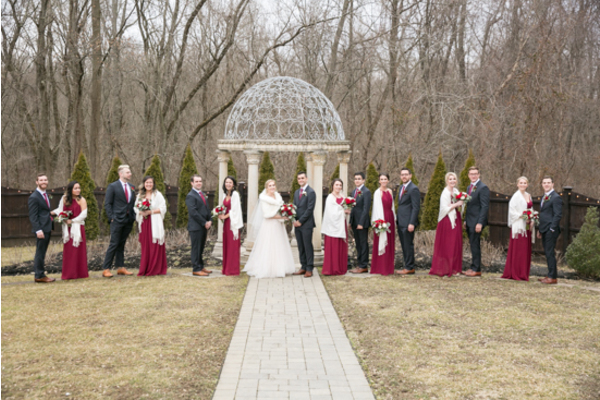 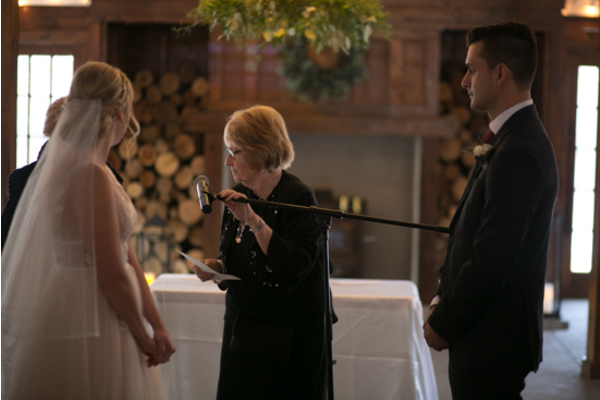 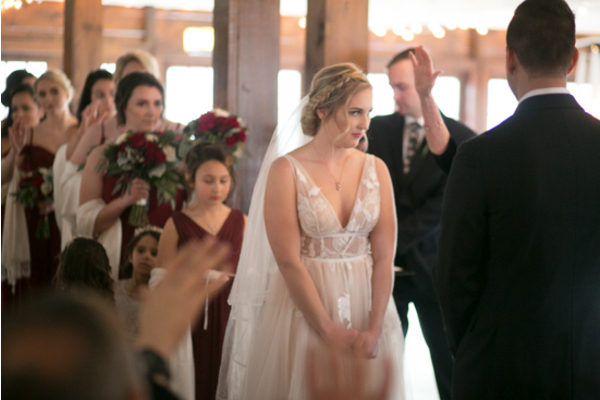 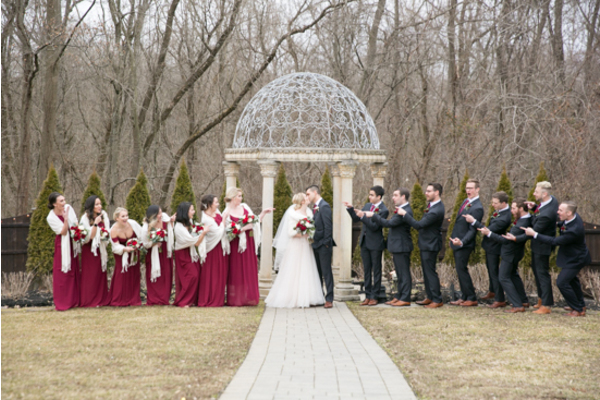 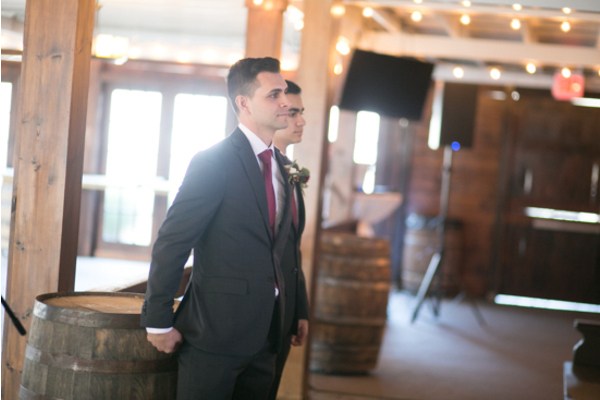 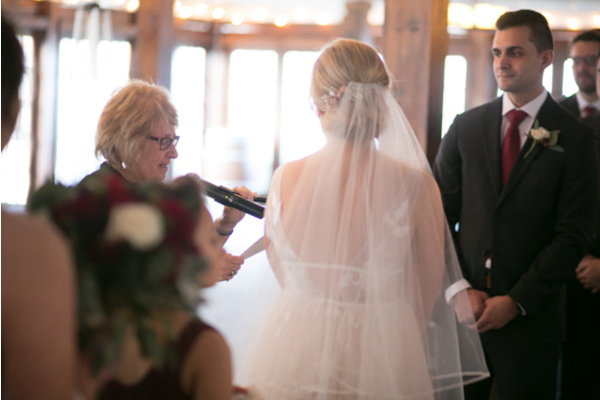 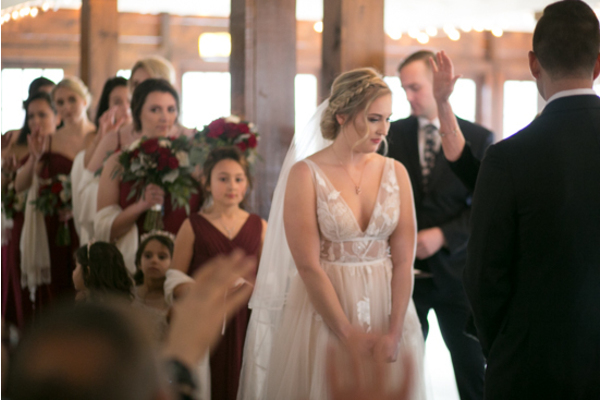 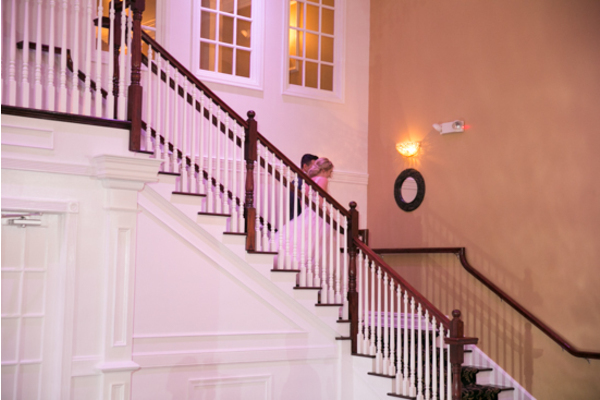 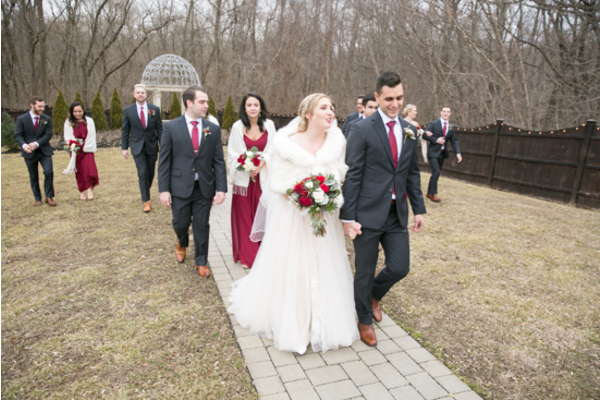 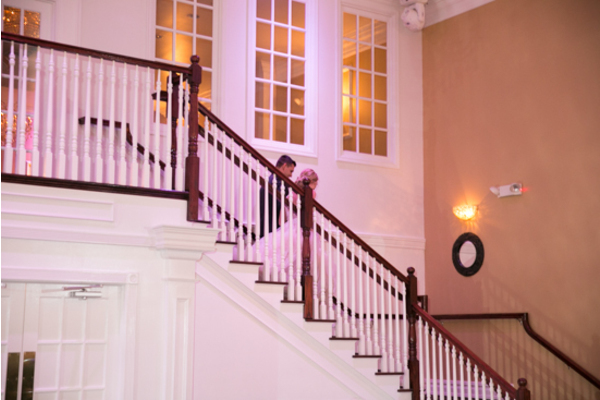 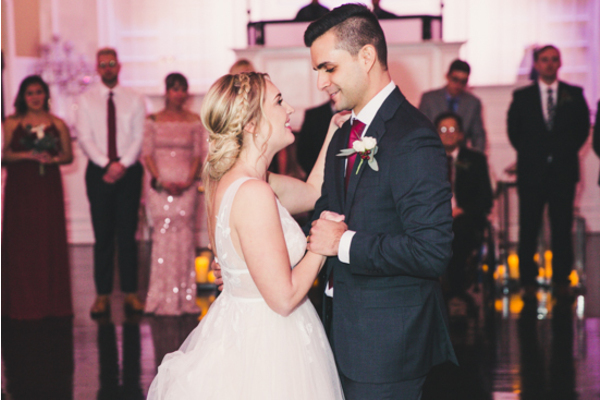 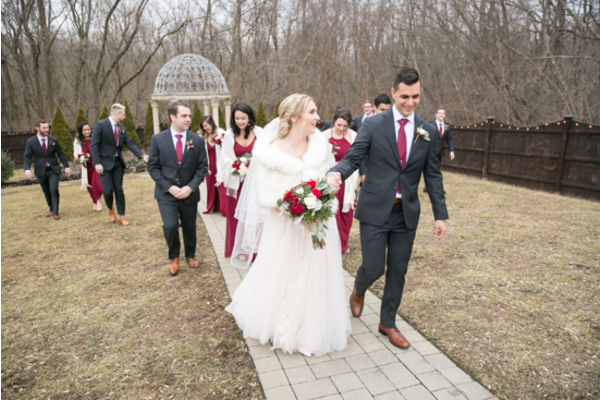 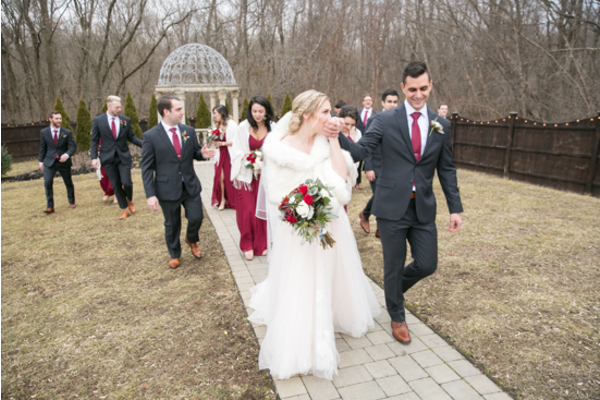 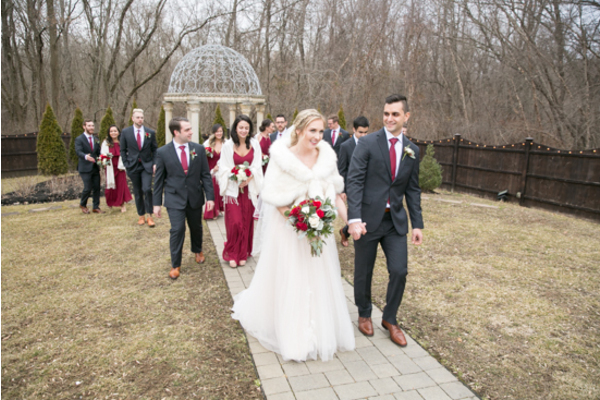 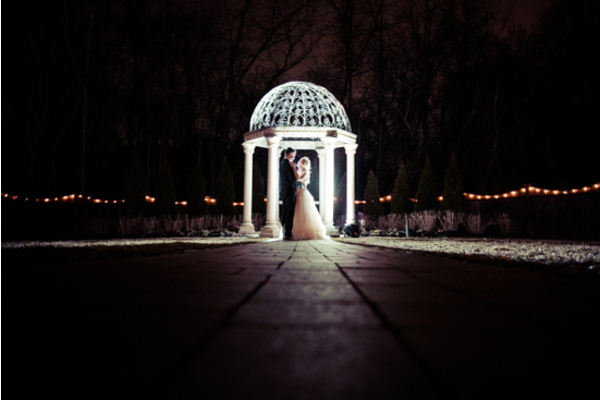 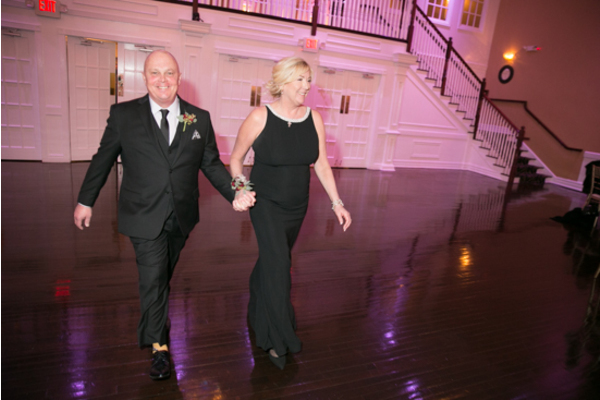 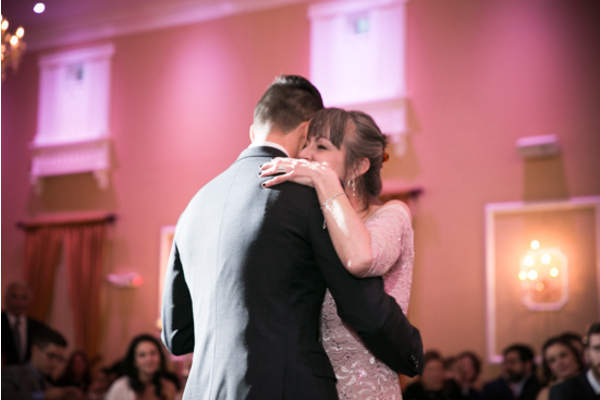 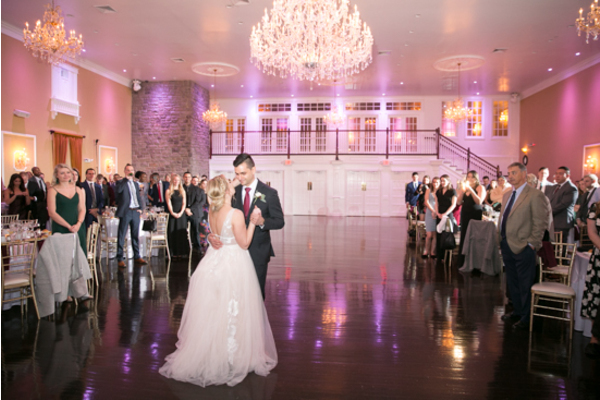 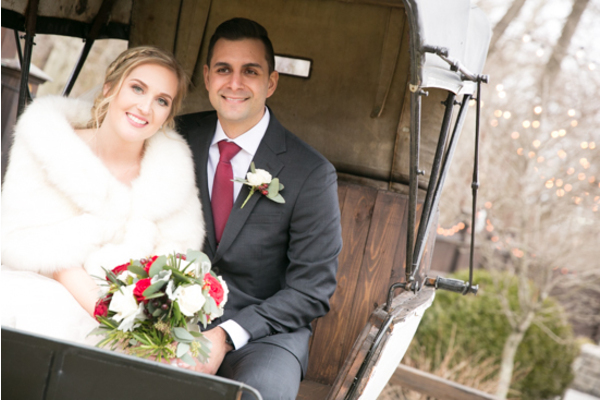 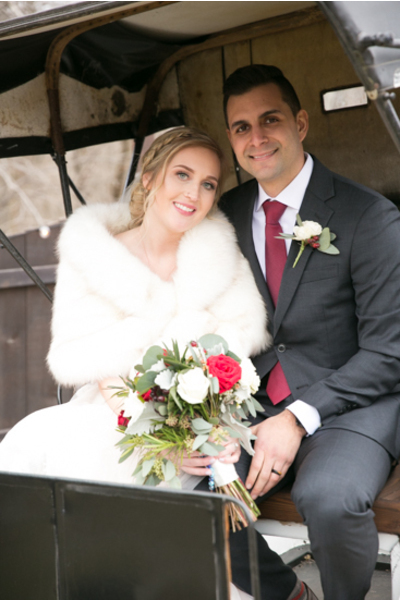 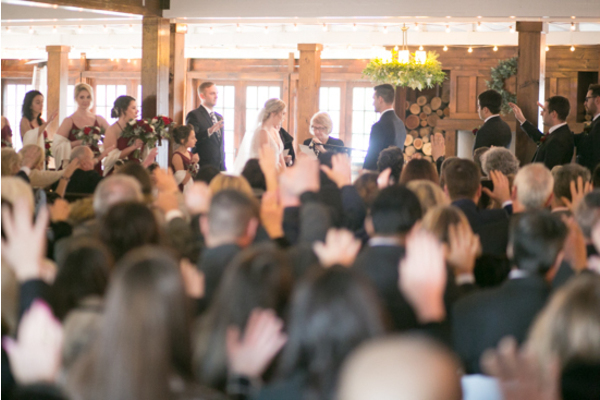 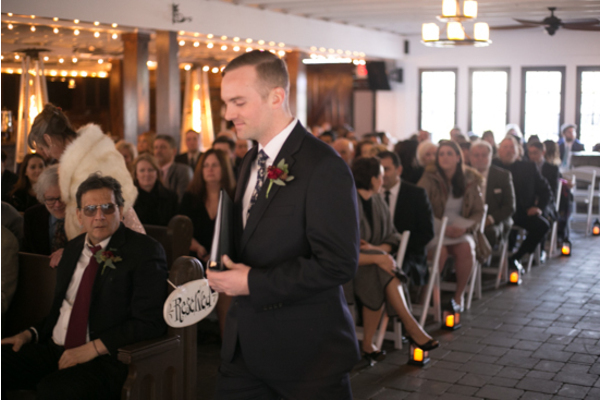 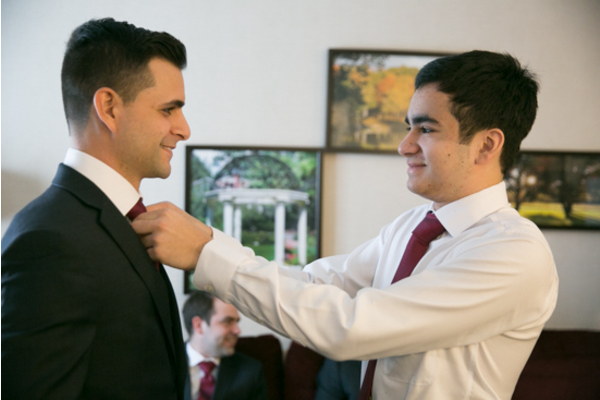 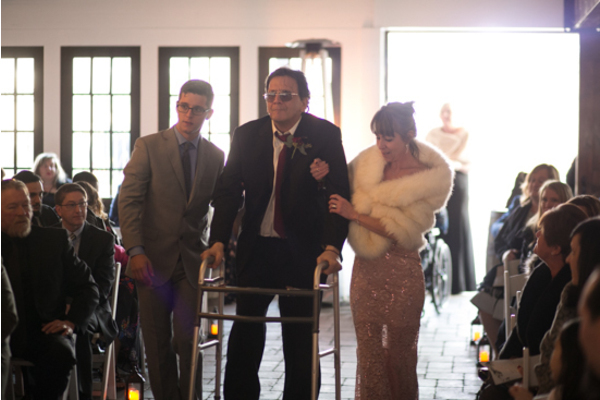 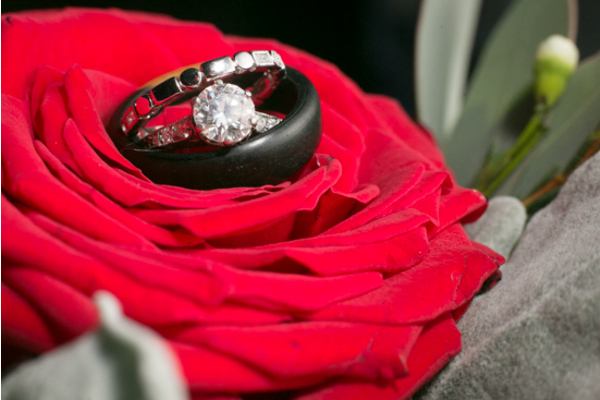 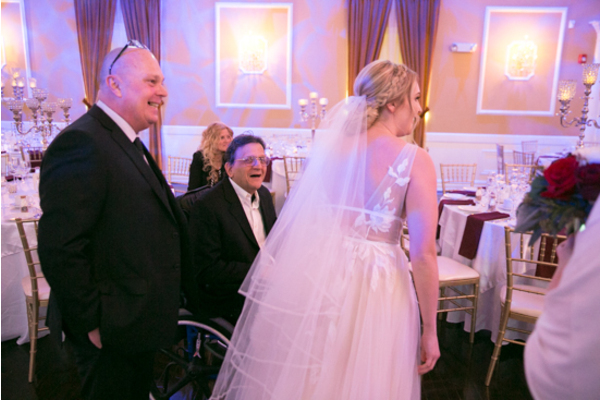 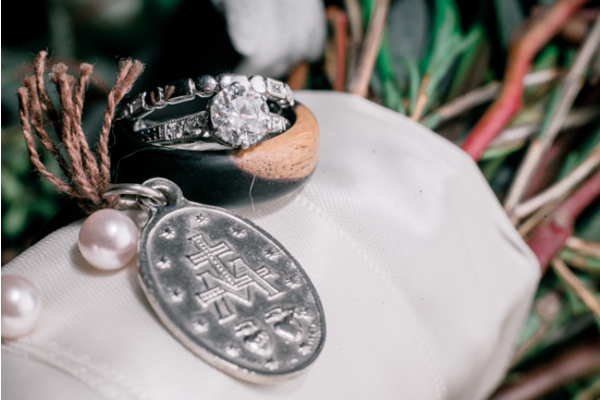 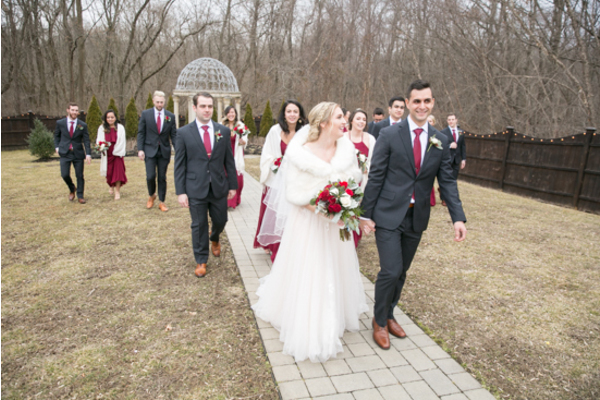 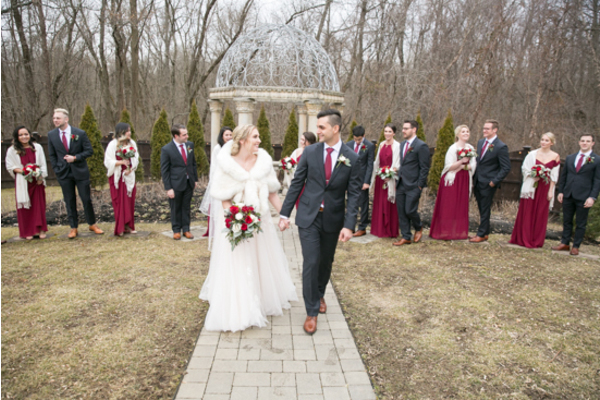 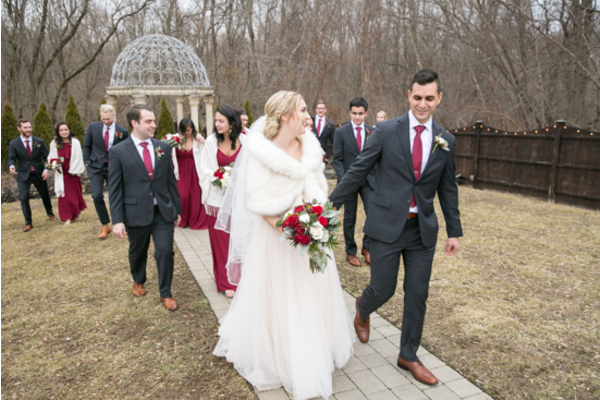 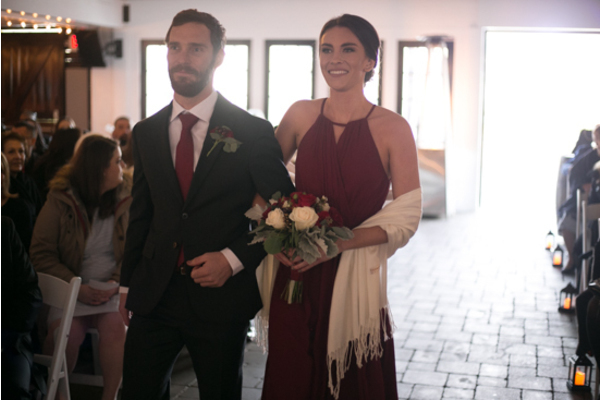 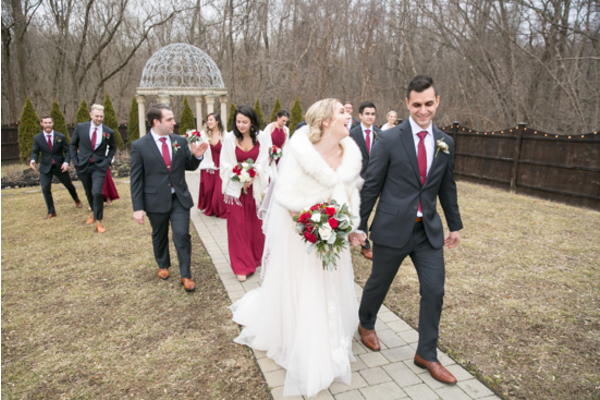 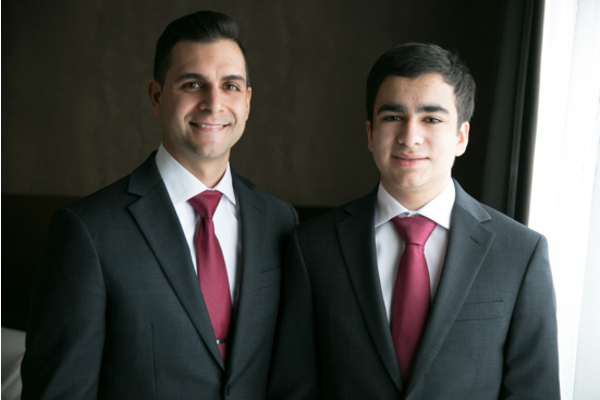 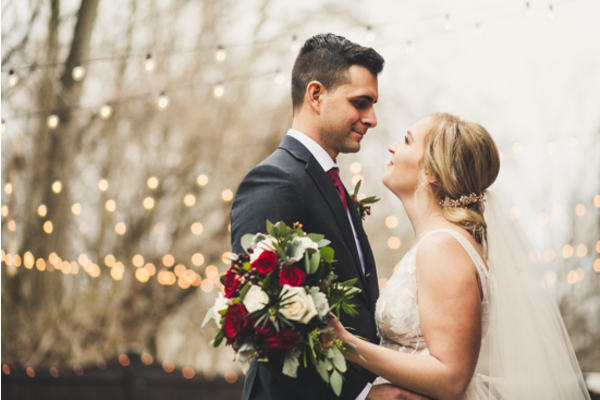 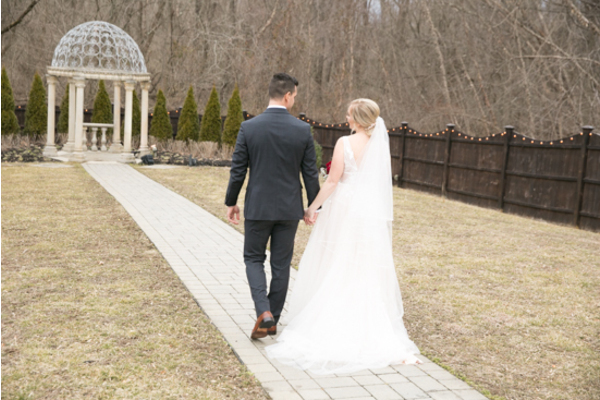 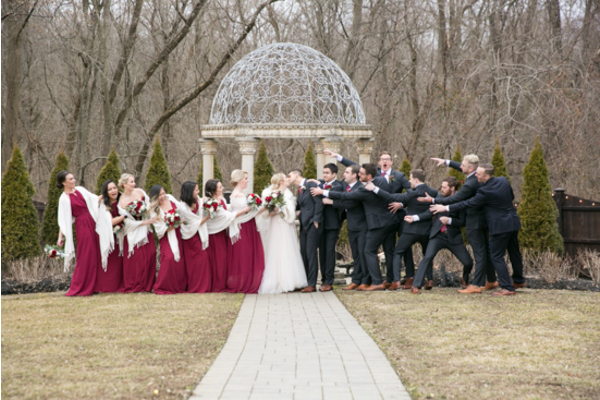 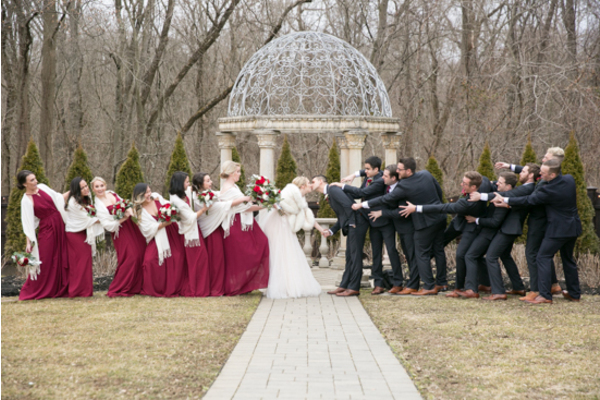 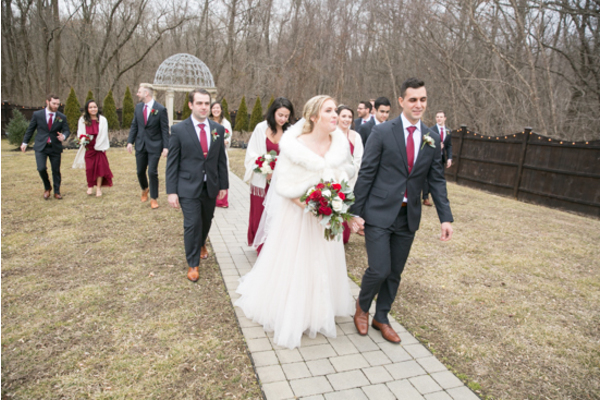 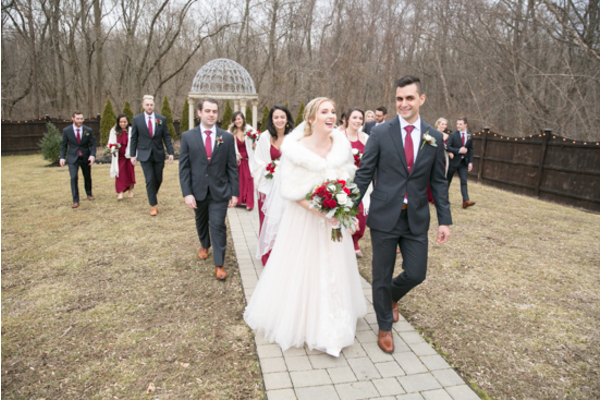 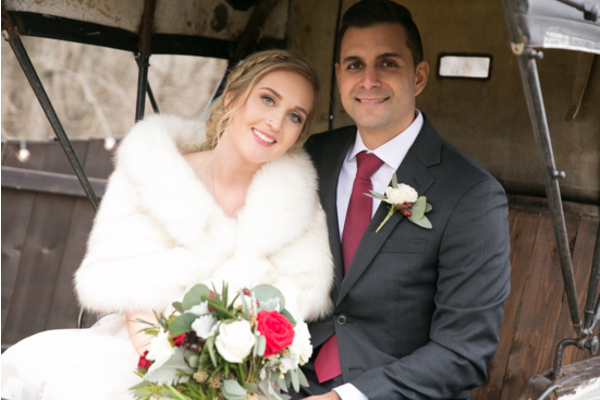 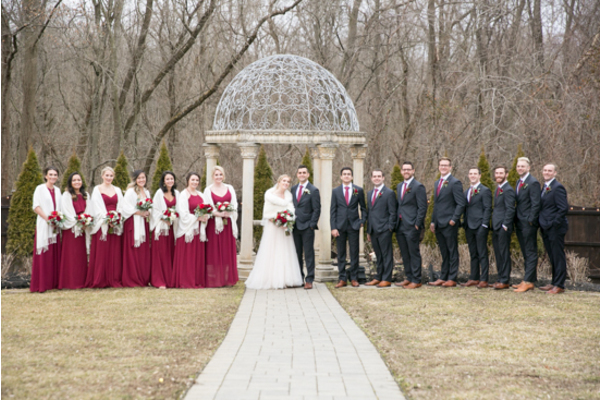 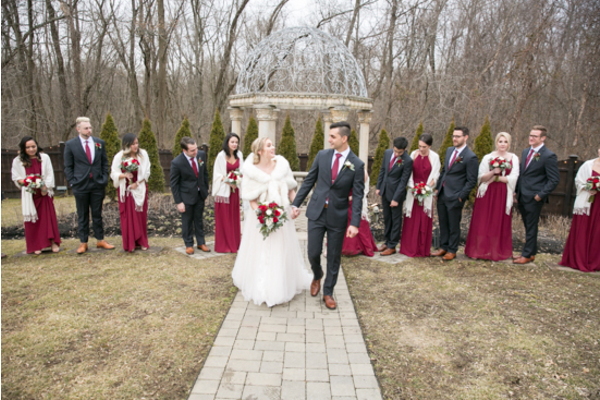 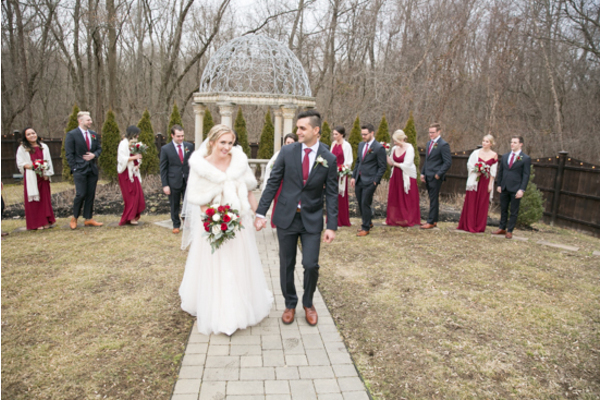 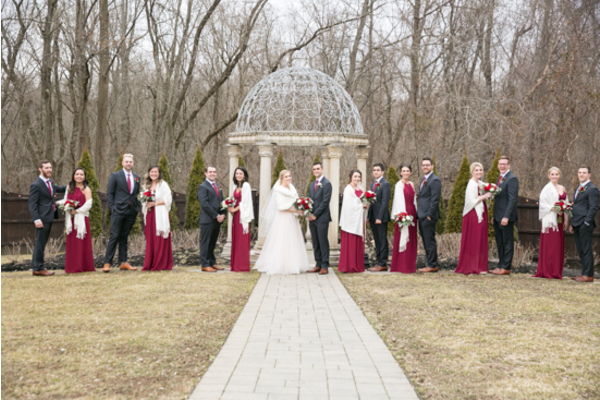 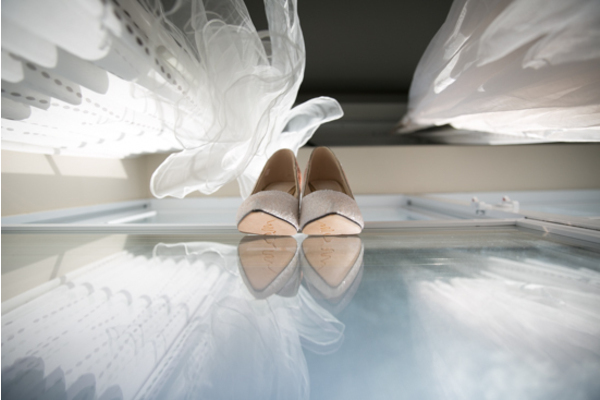 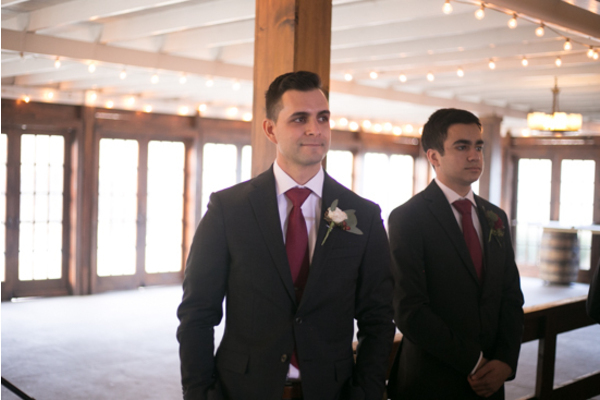 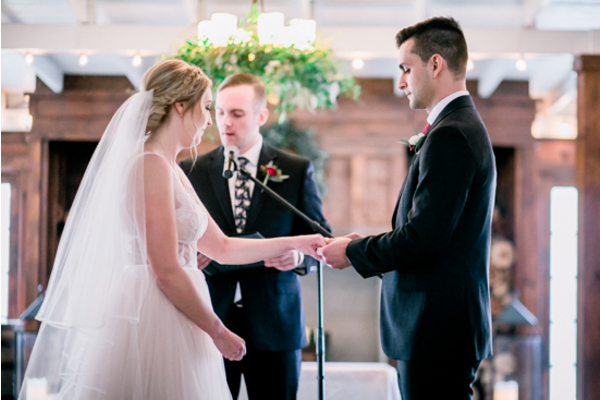 This perfect pair celebrated their February wedding at the always beautiful Hamilton Manor. 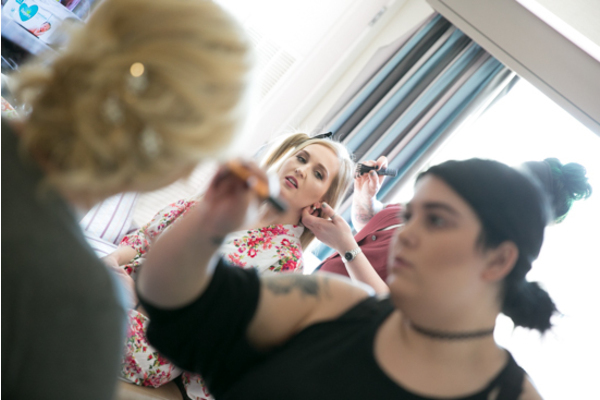 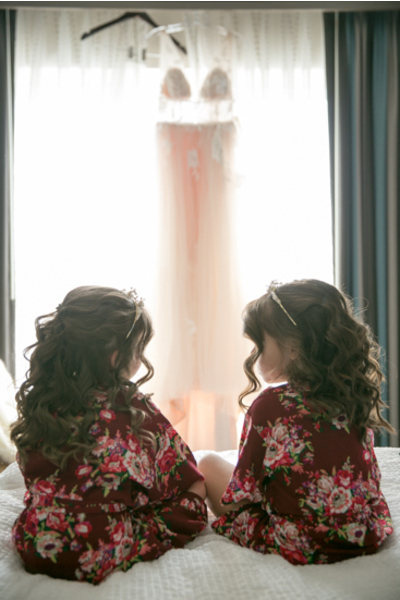 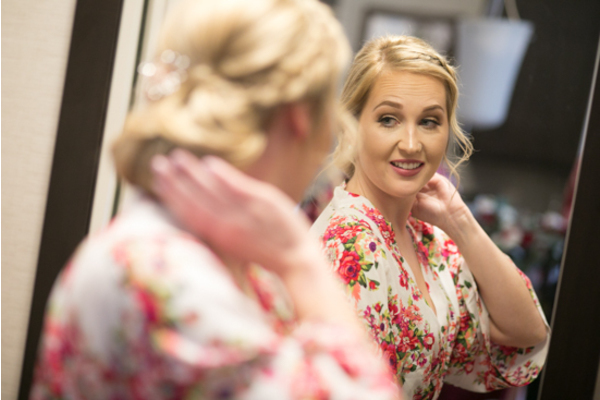 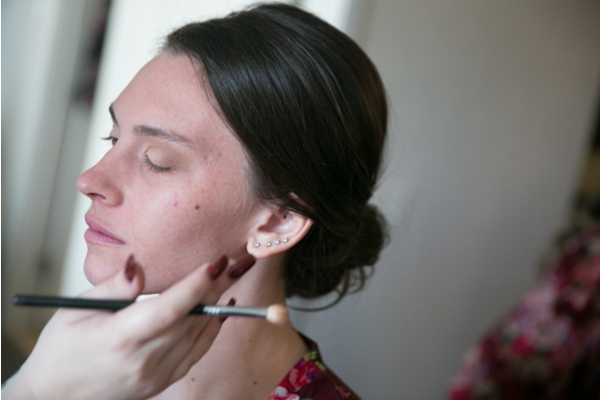 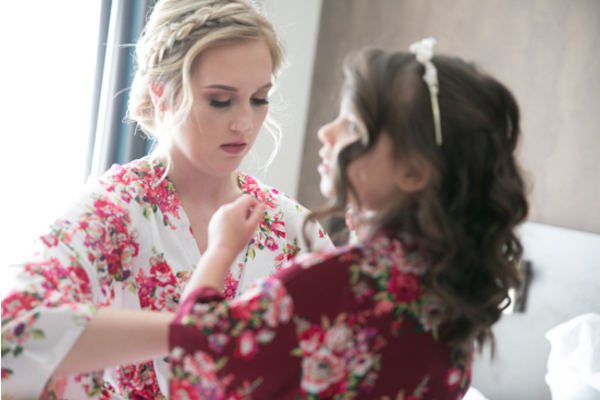 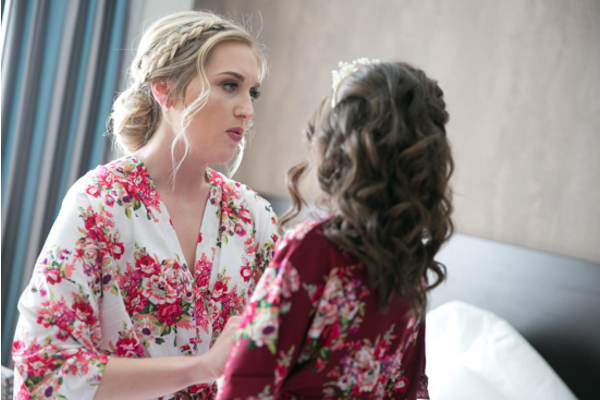 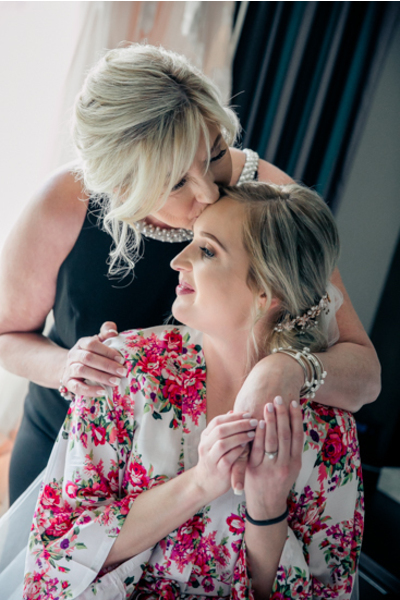 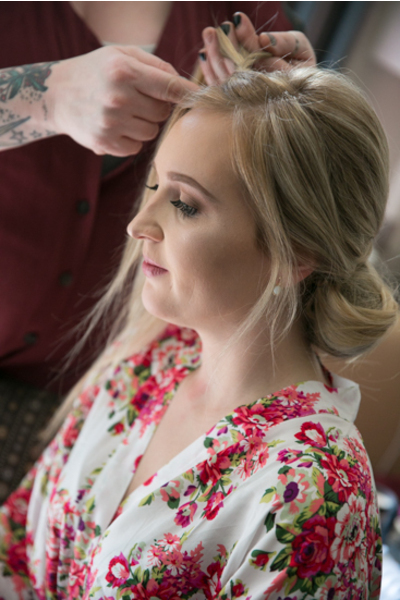 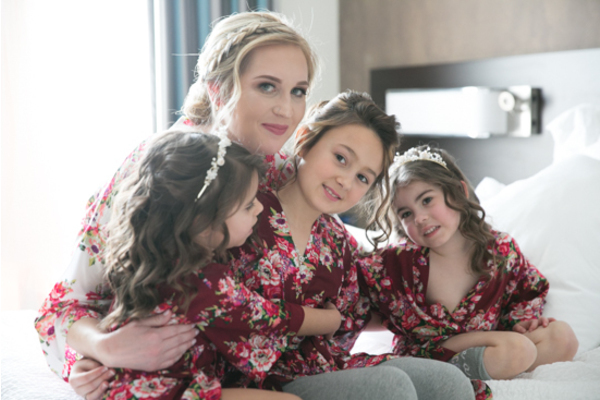 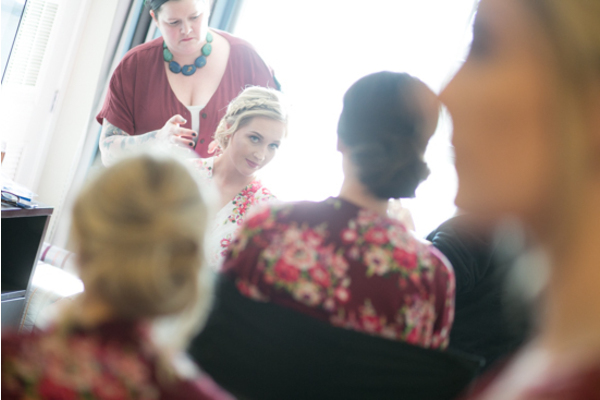 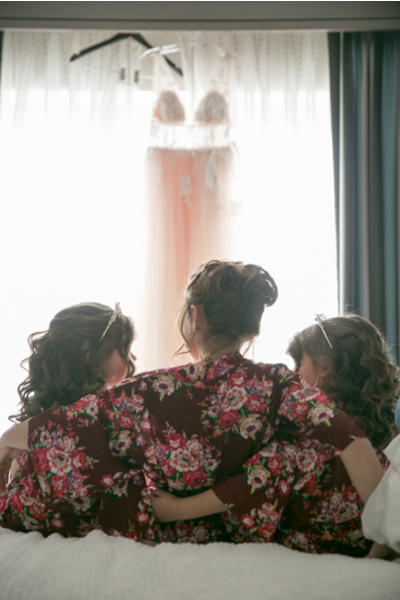 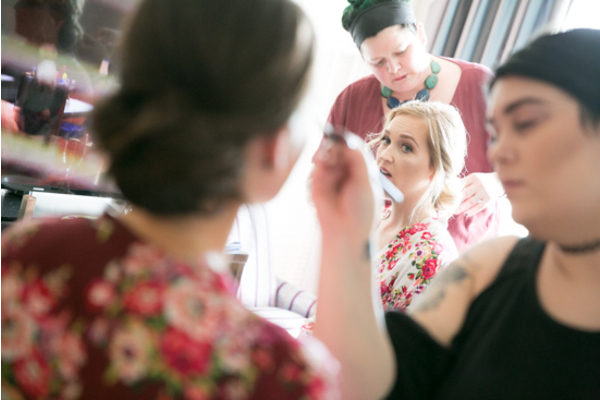 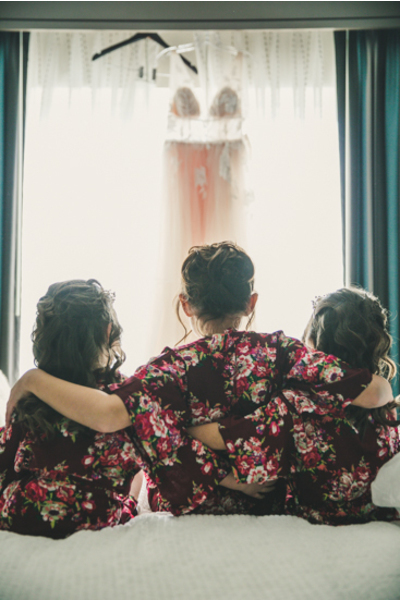 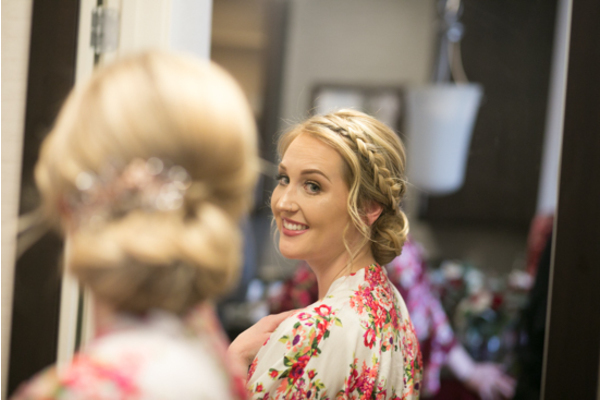 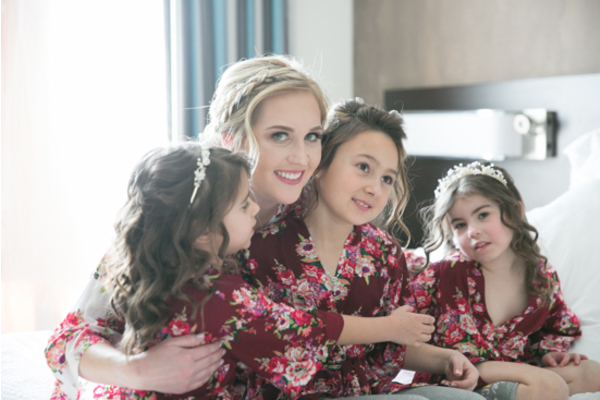 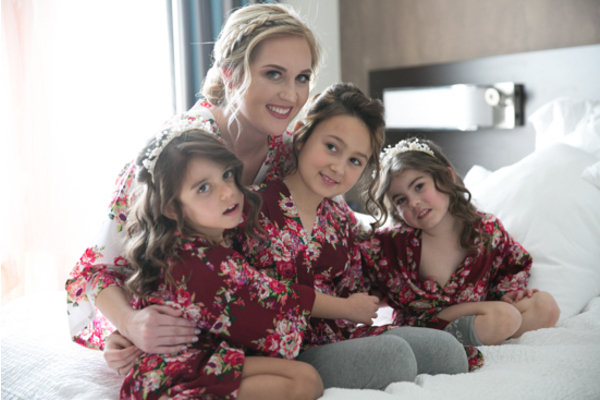 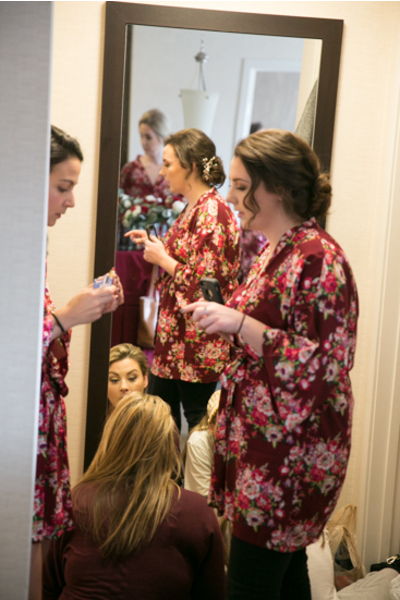 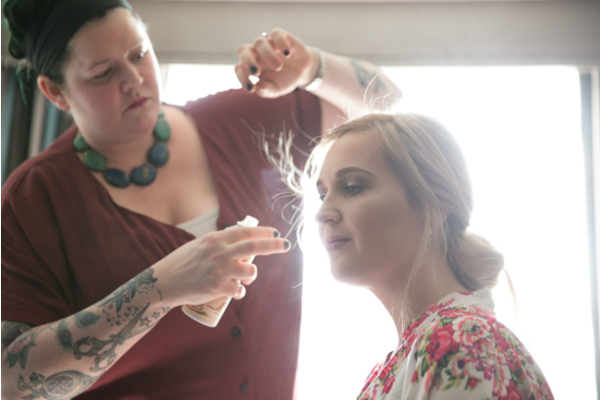 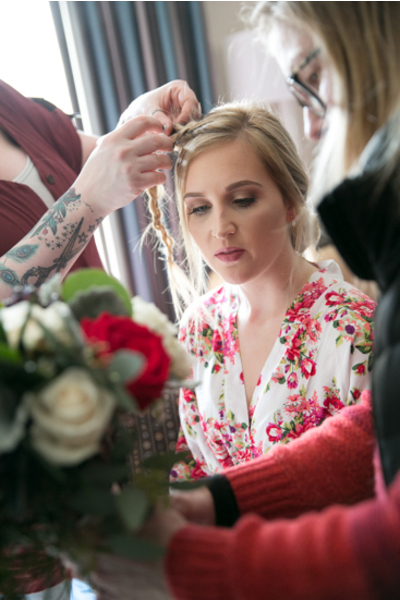 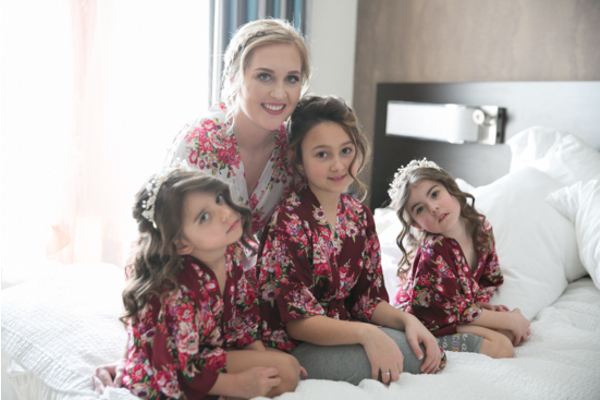 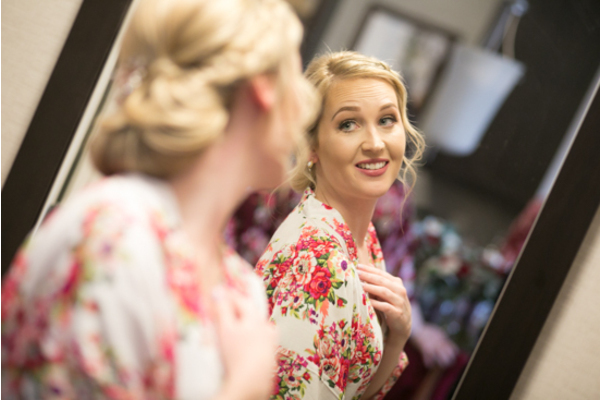 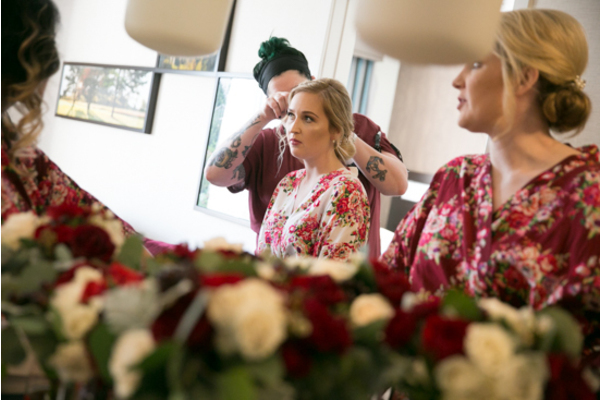 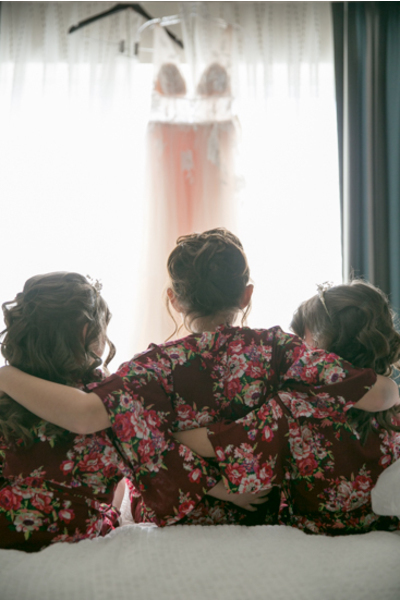 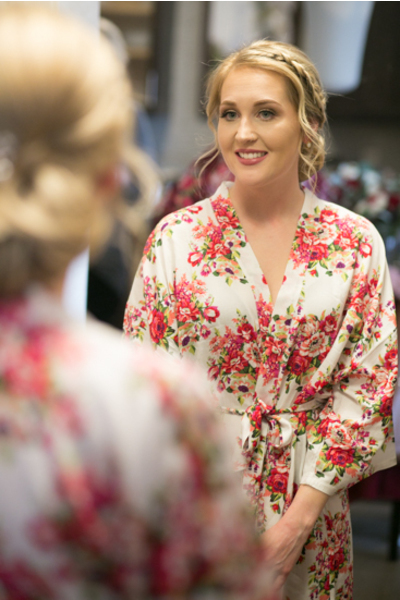 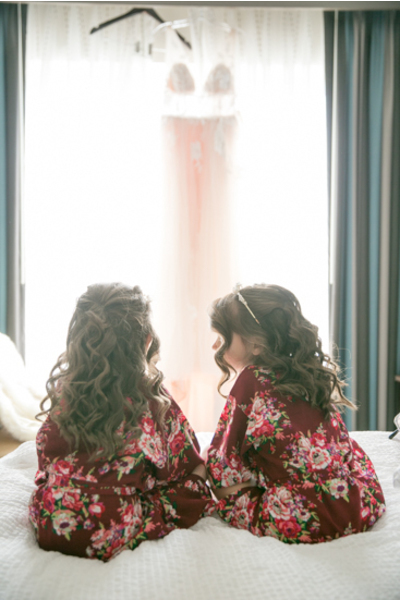 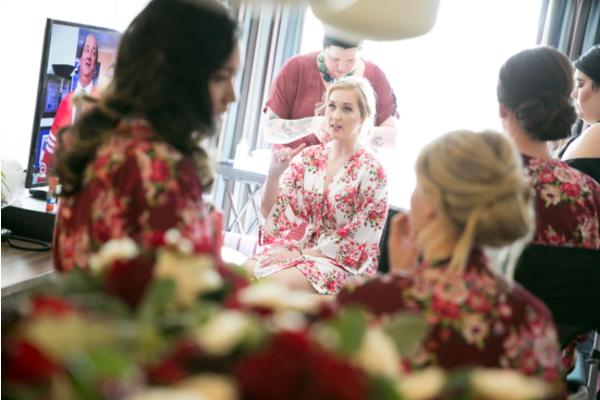 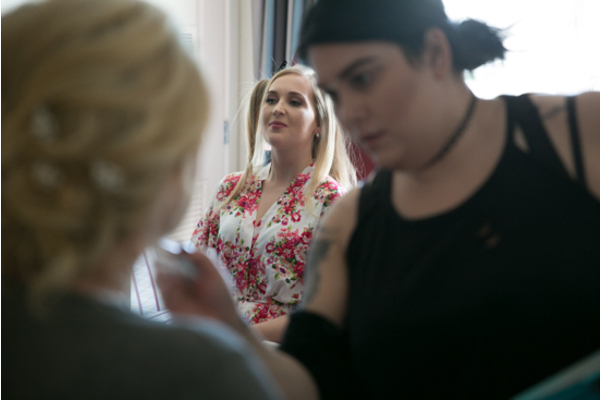 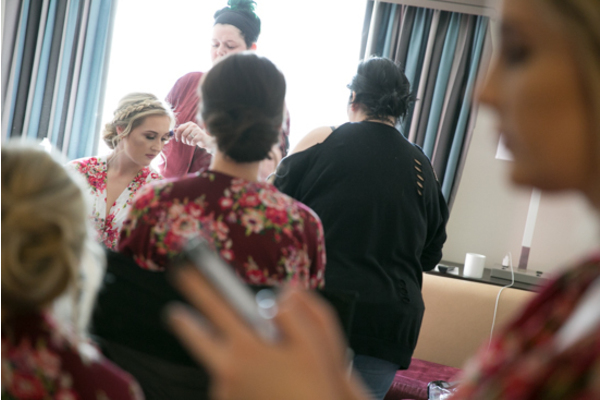 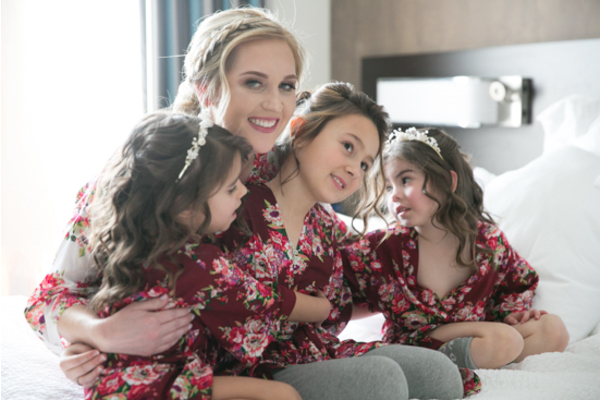 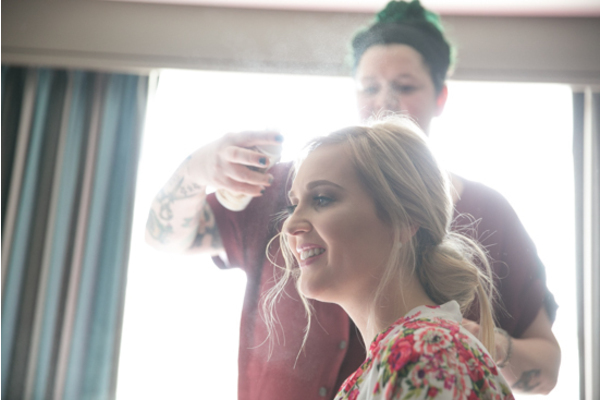 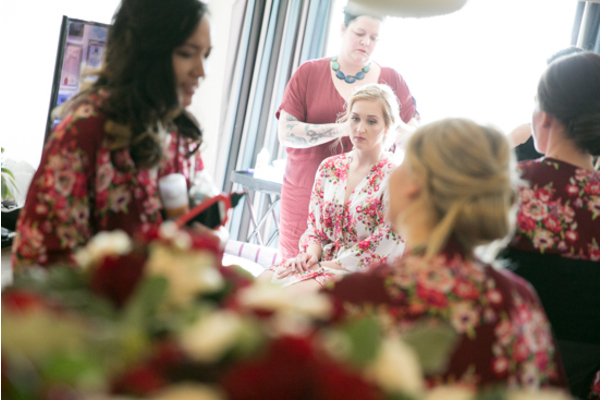 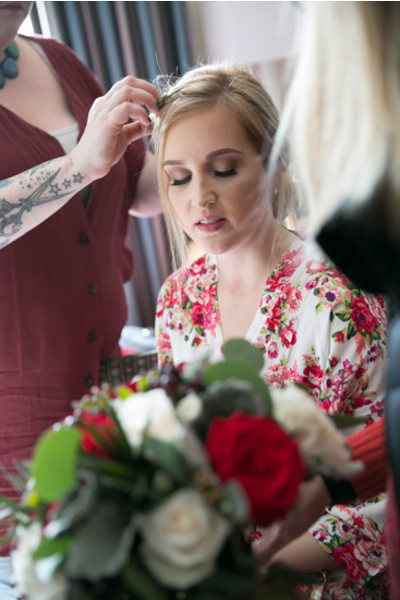 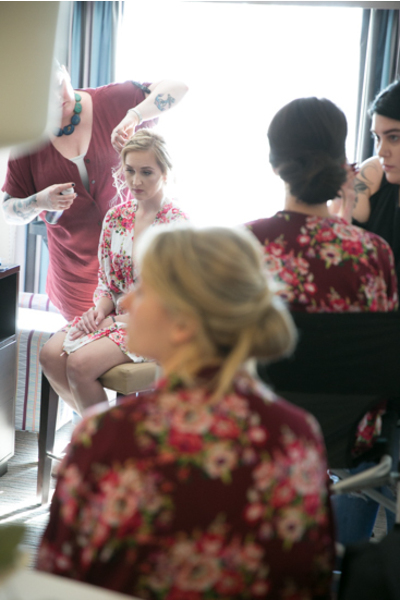 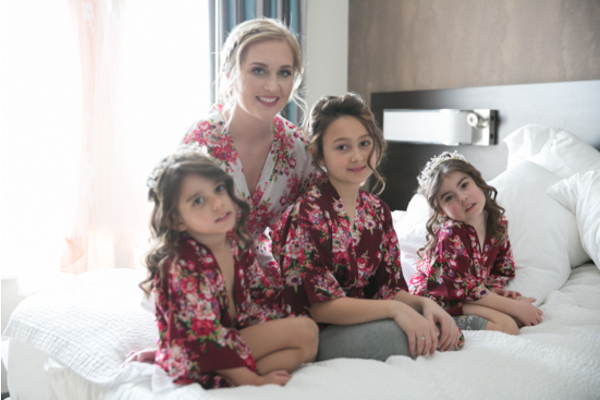 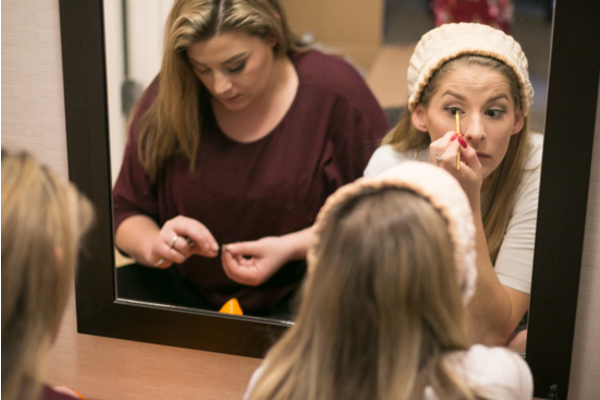 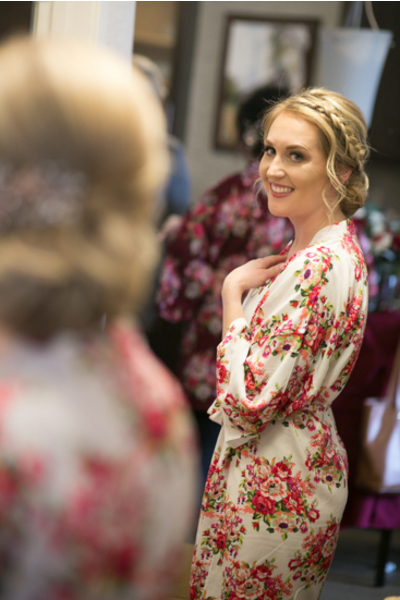 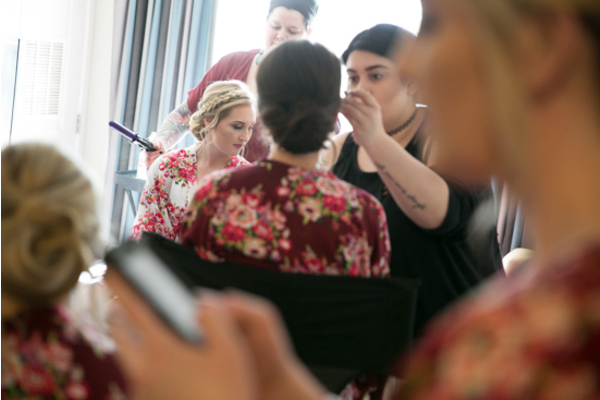 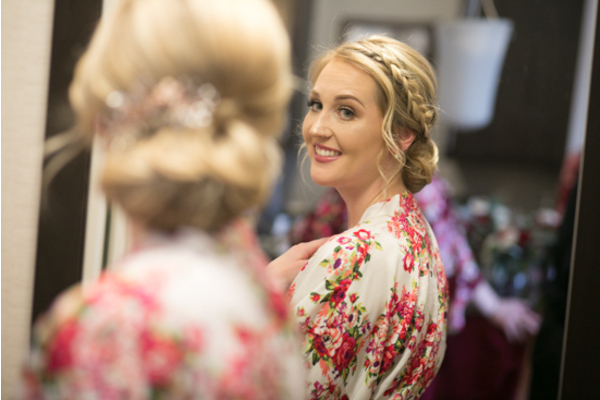 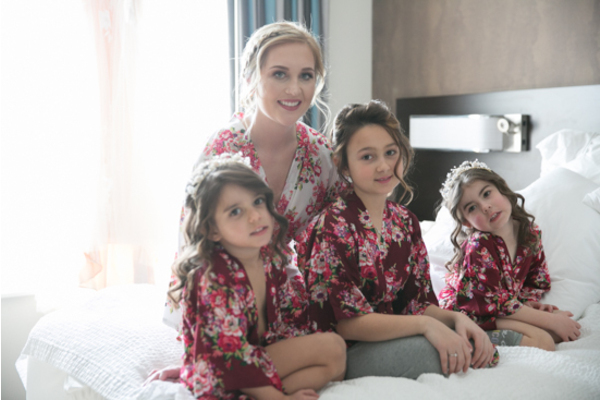 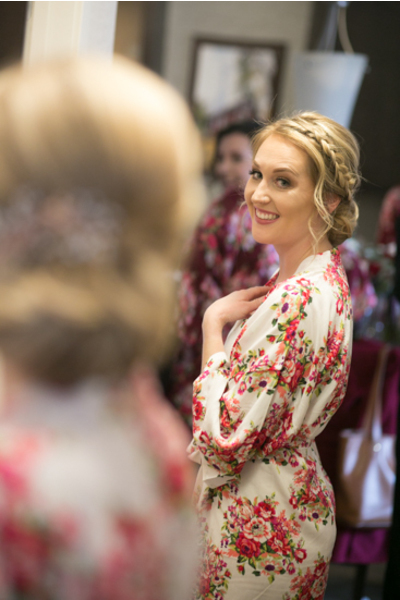 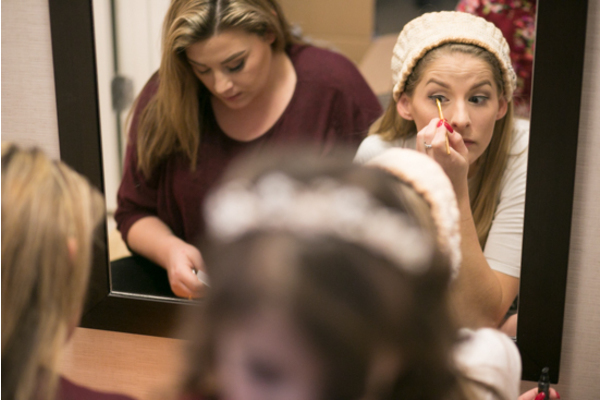 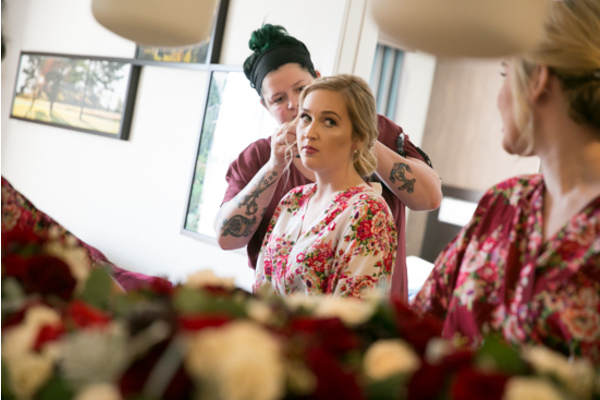 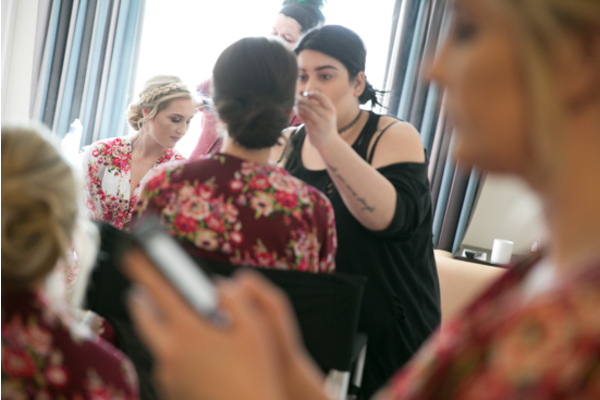 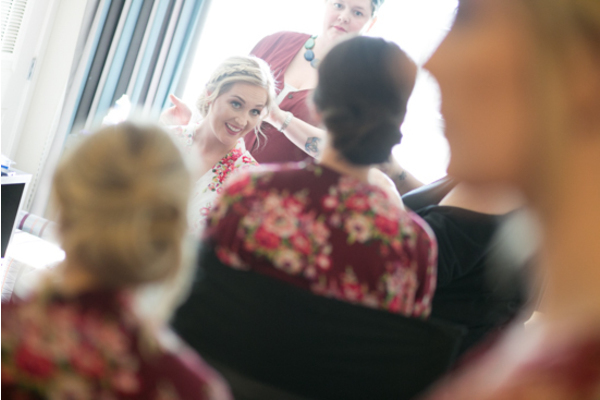 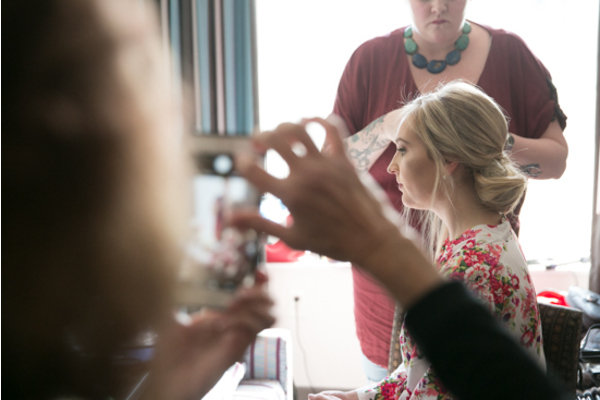 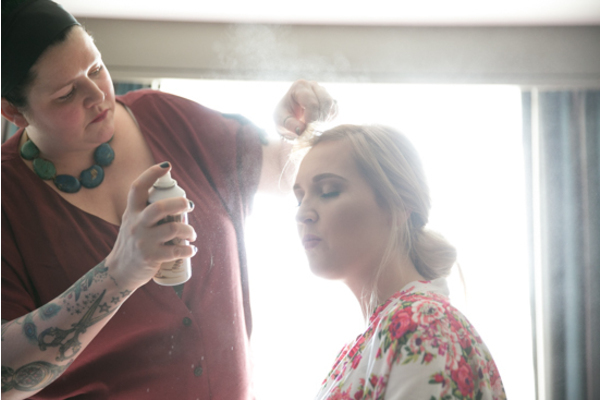 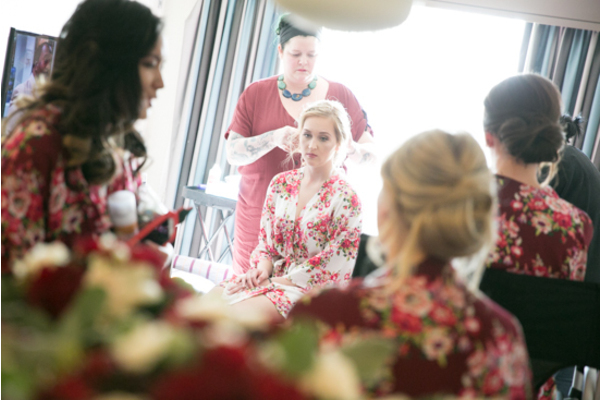 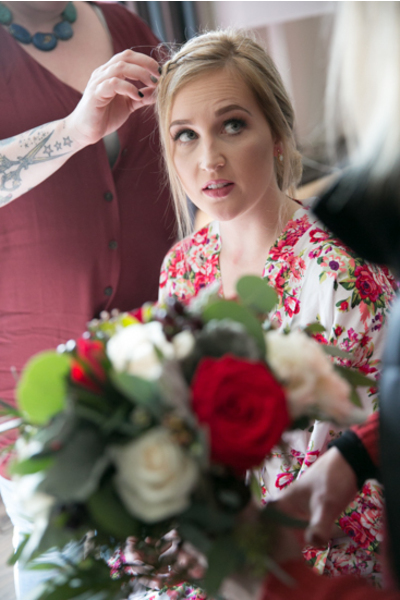 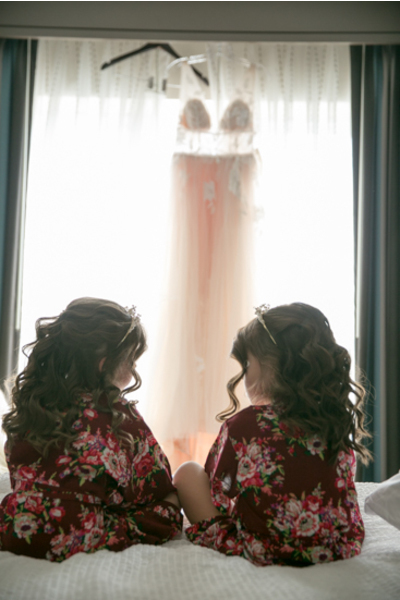 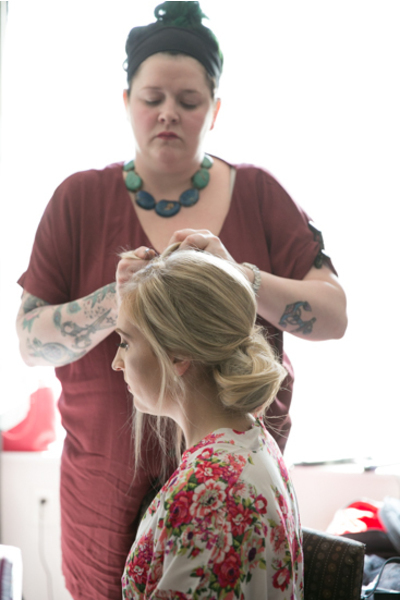 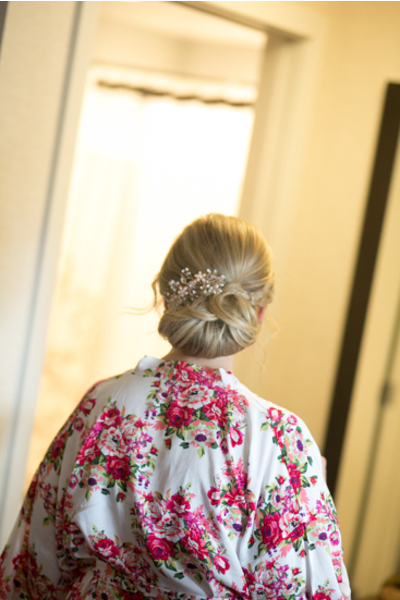 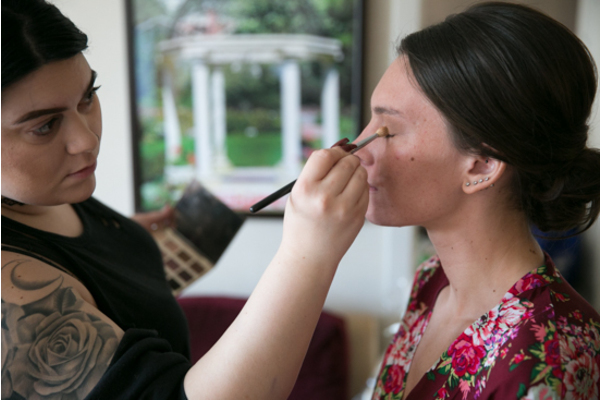 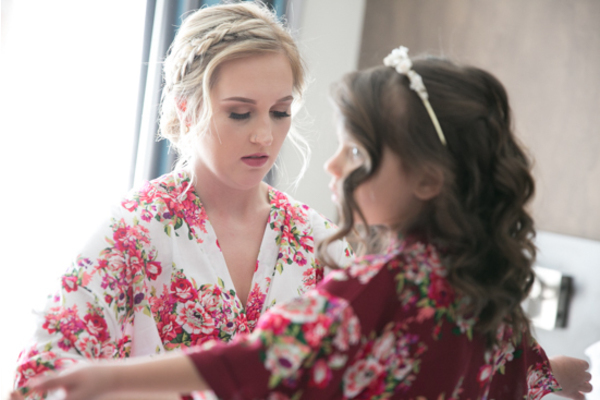 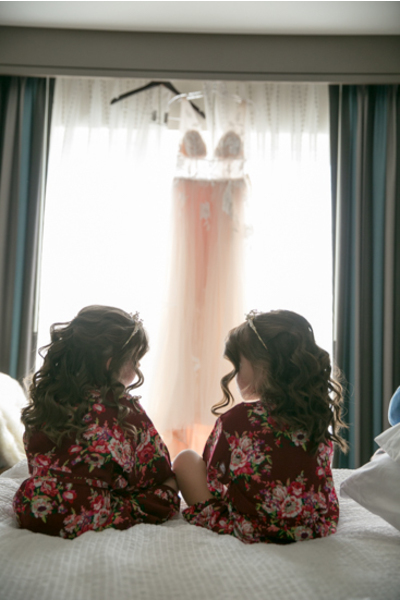 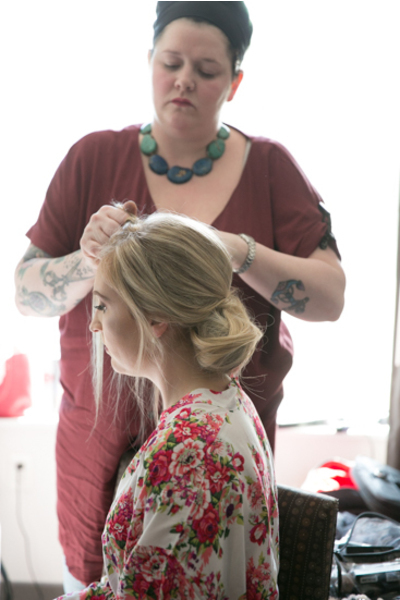 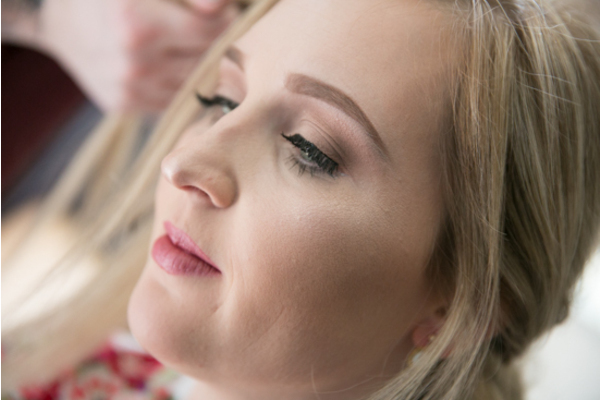 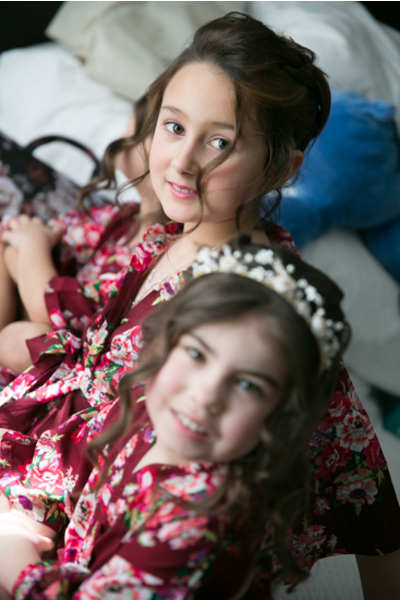 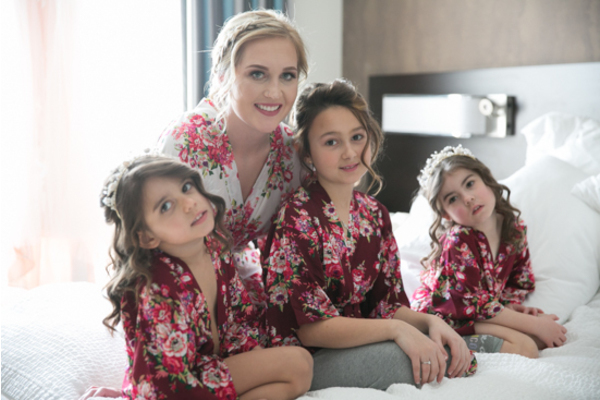 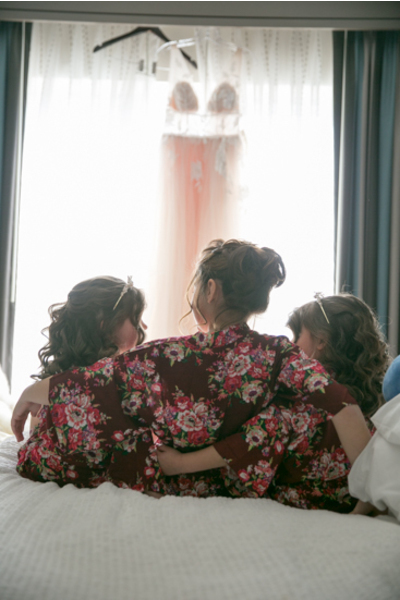 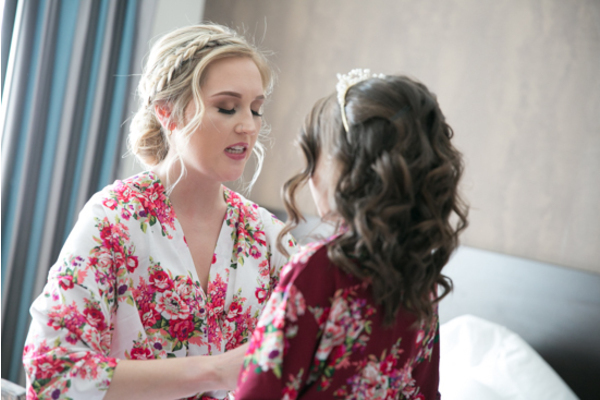 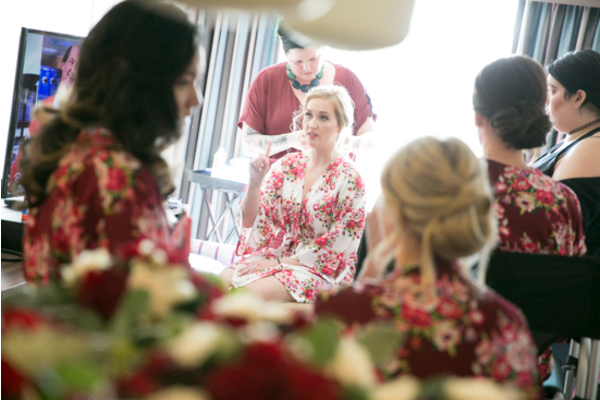 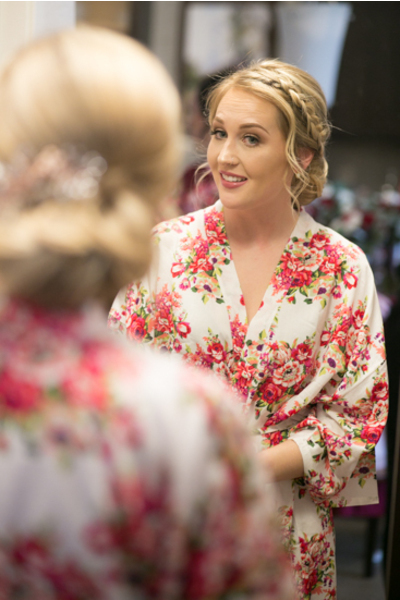 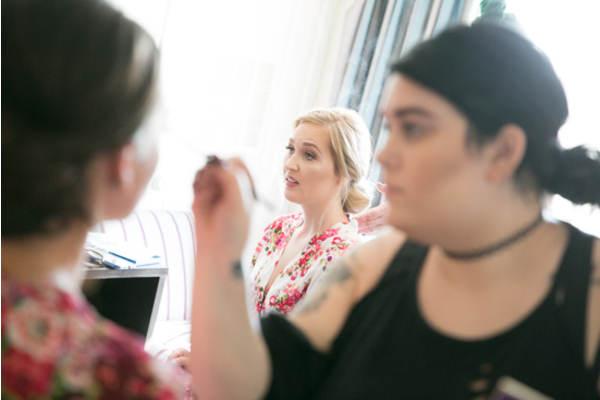 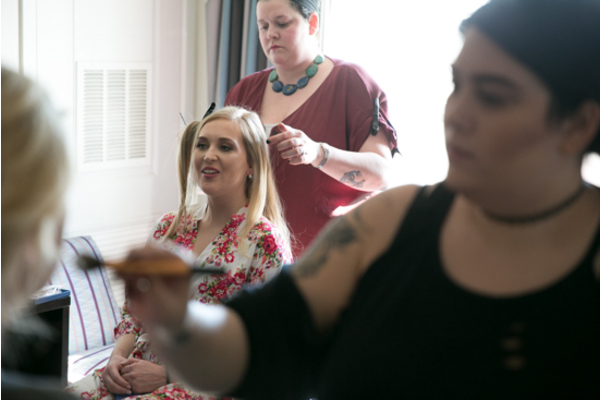 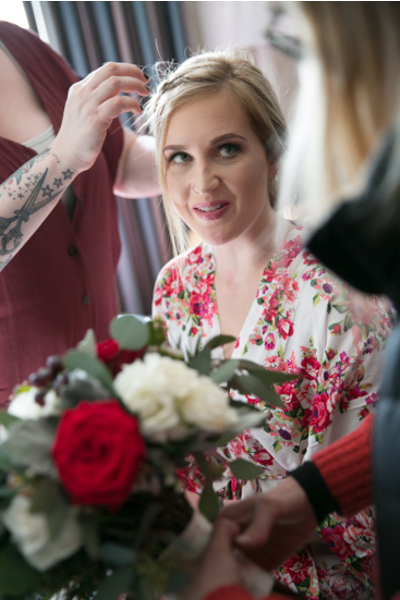 From the very beginning, our NJ Wedding Photographer captured Lexi and her favorite ladies getting ready in their bright floral robes. 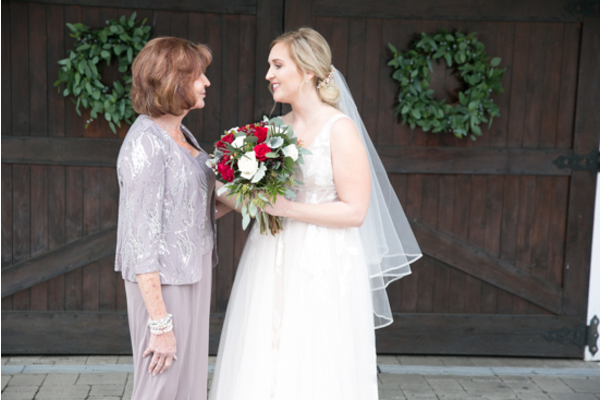 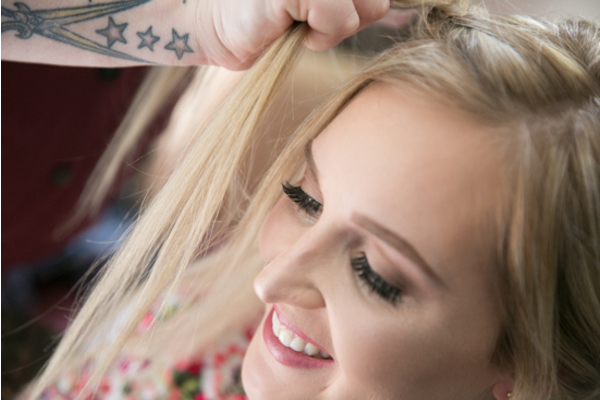 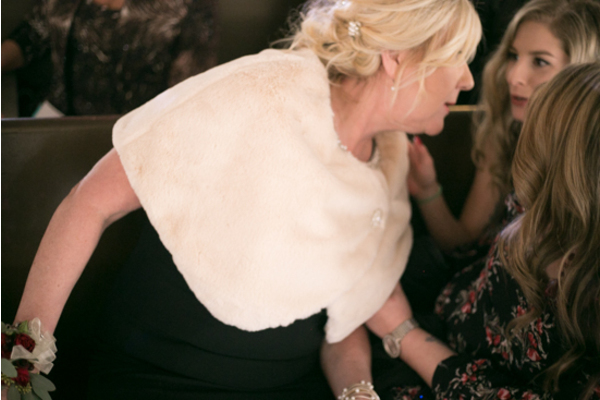 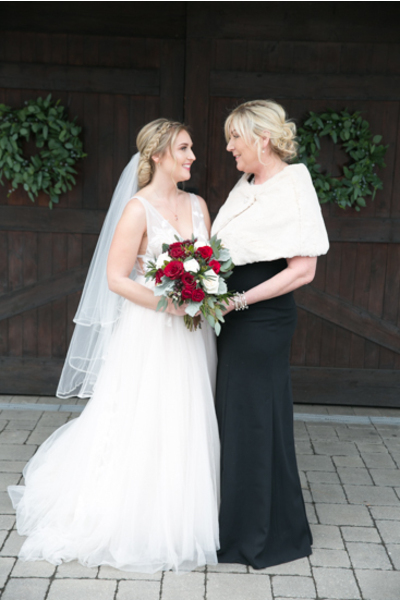 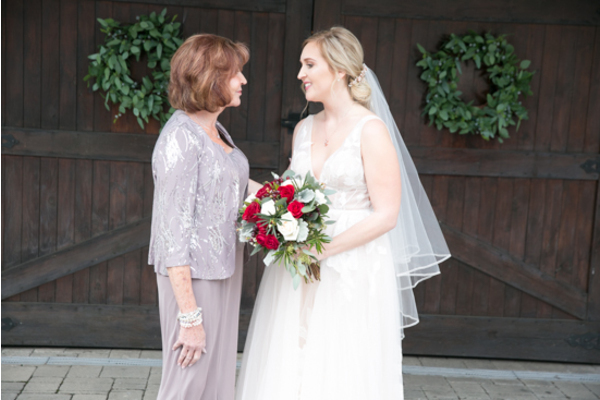 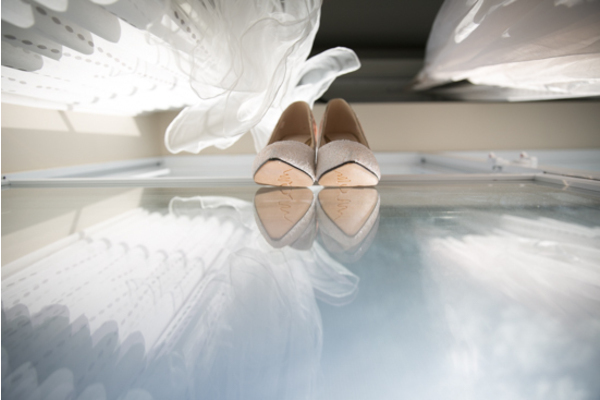 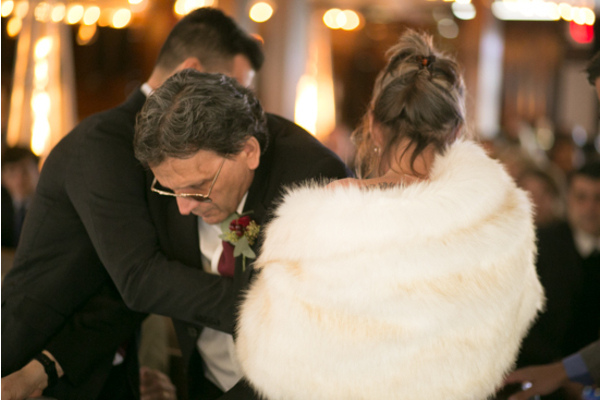 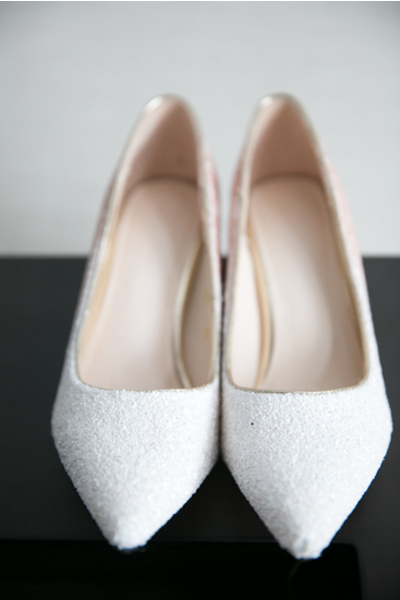 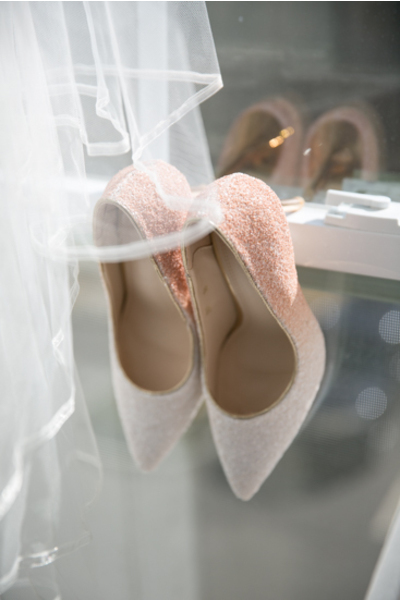 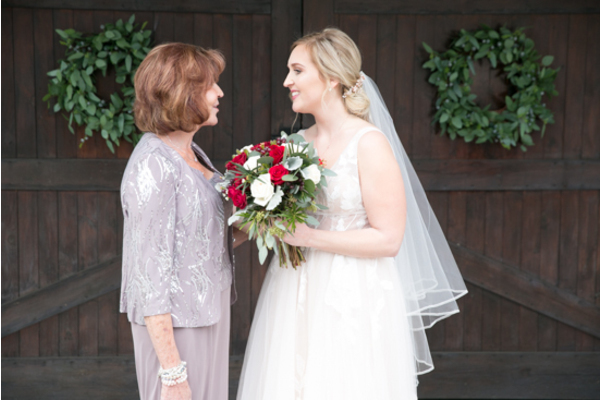 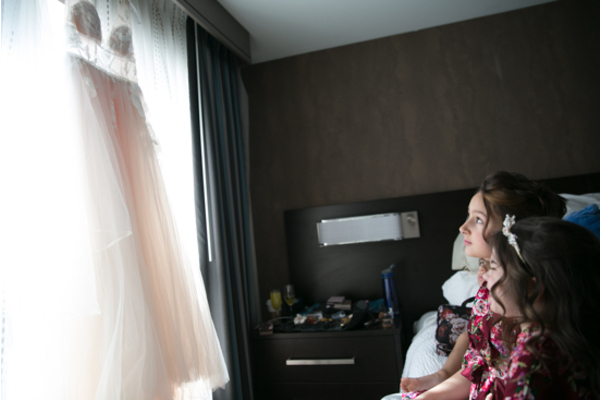 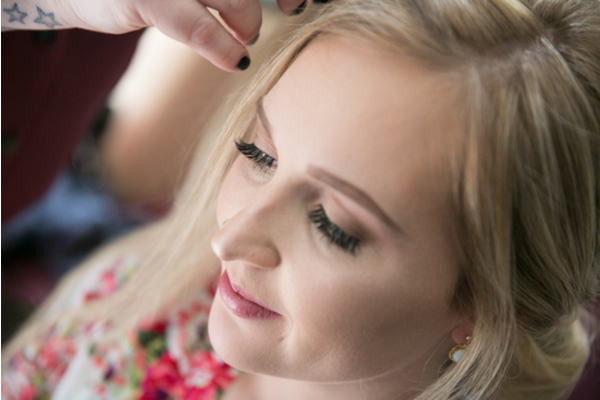 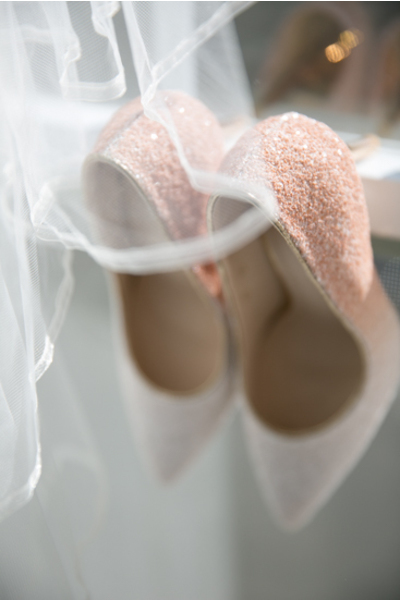 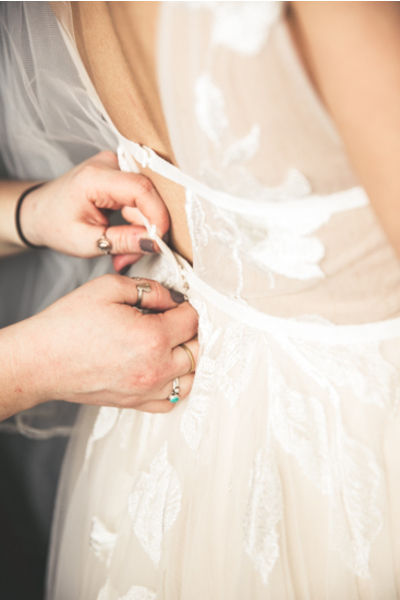 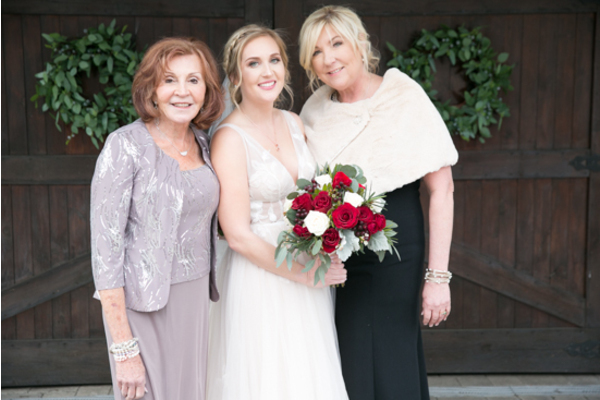 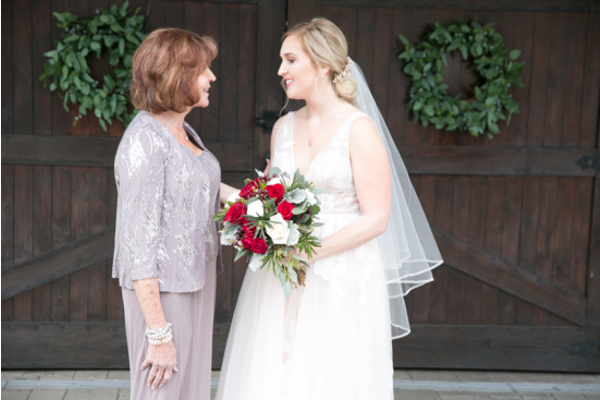 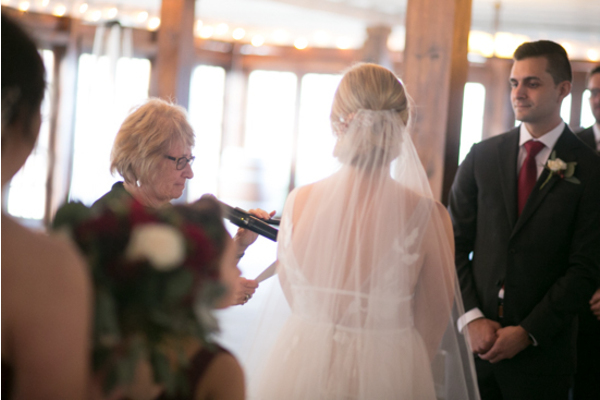 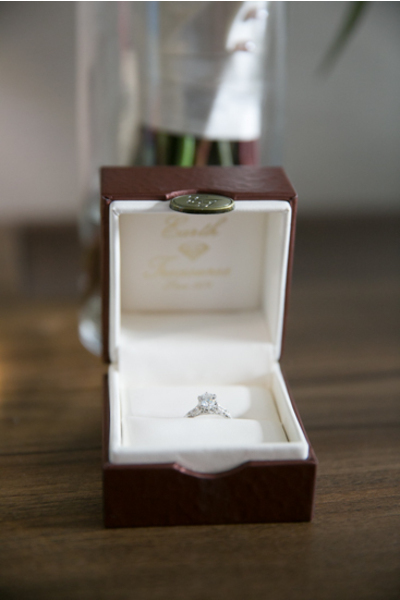 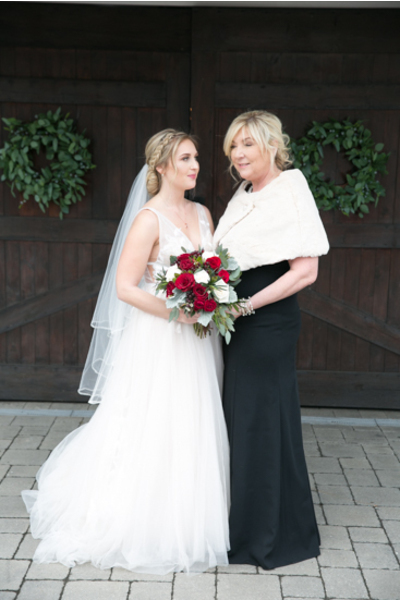 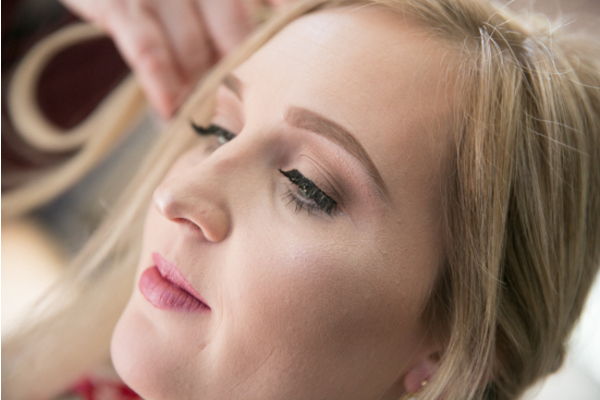 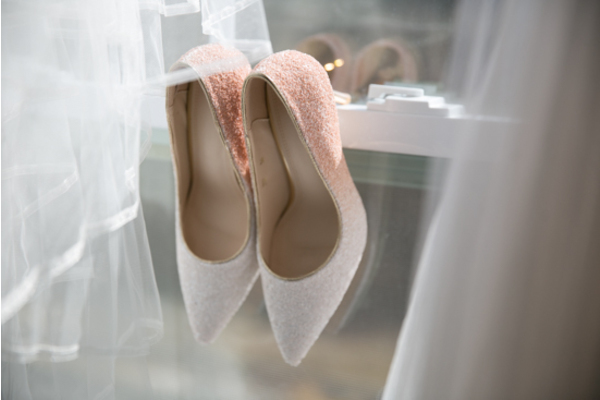 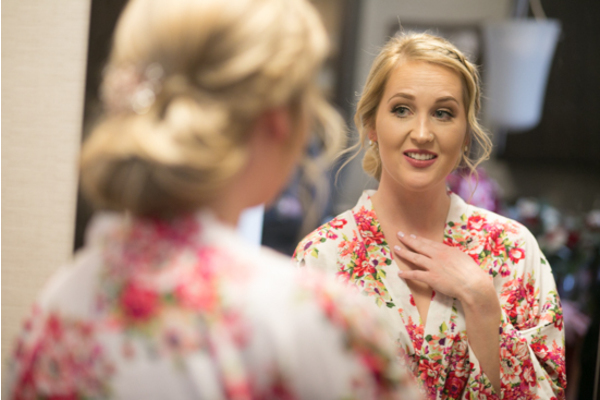 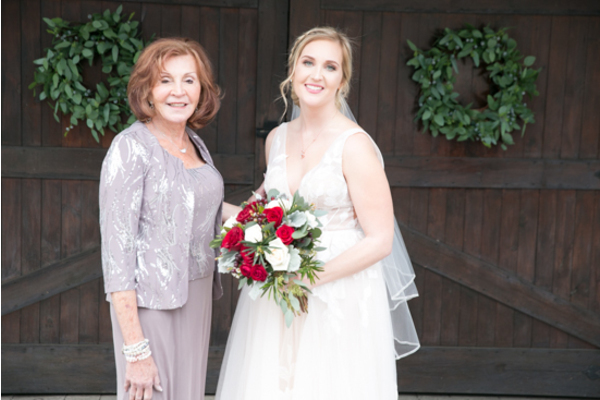 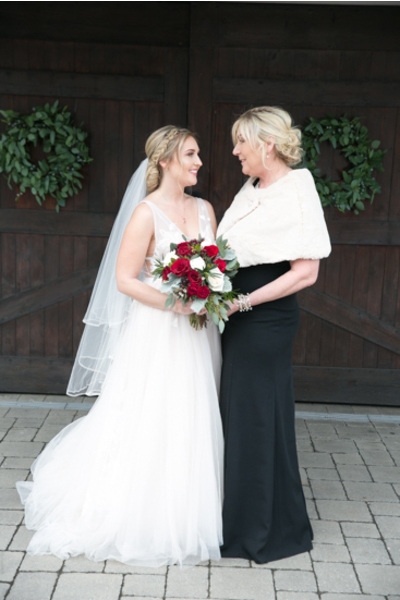 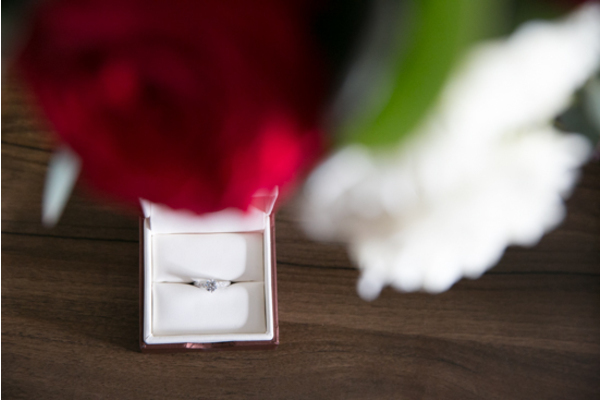 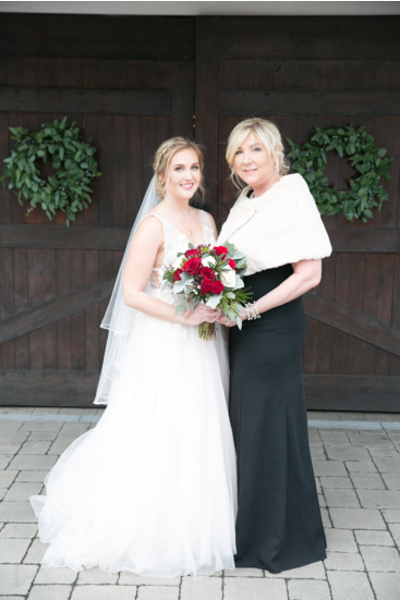 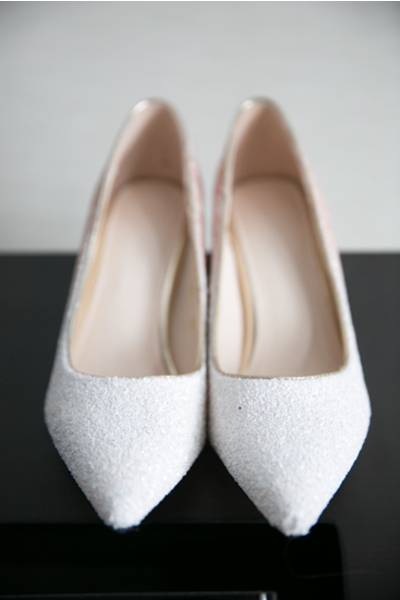 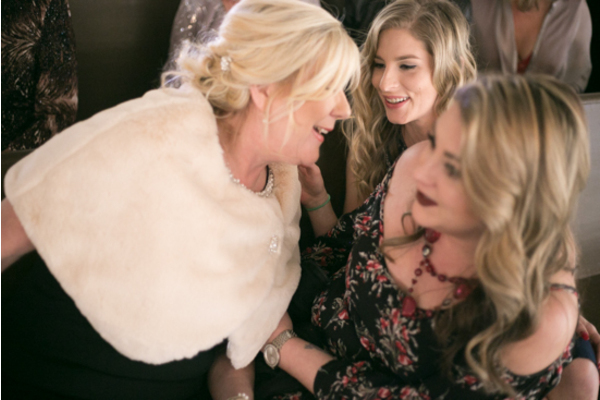 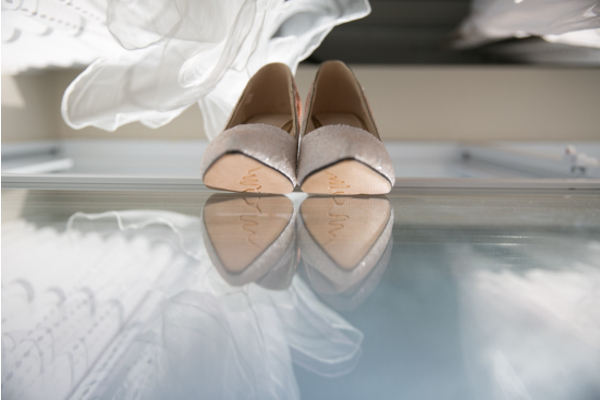 Before slipping on her gown, the bride was opening special gifts and looking through a beautiful photo album! 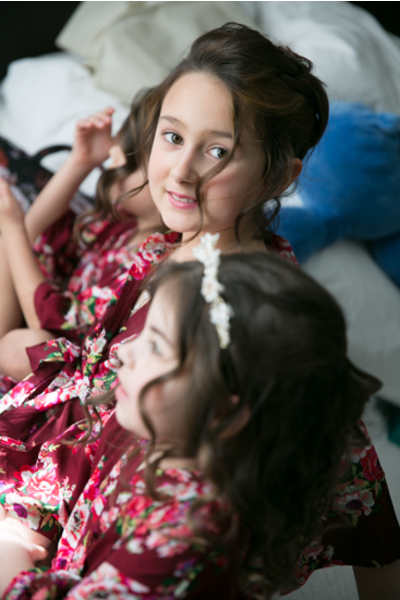 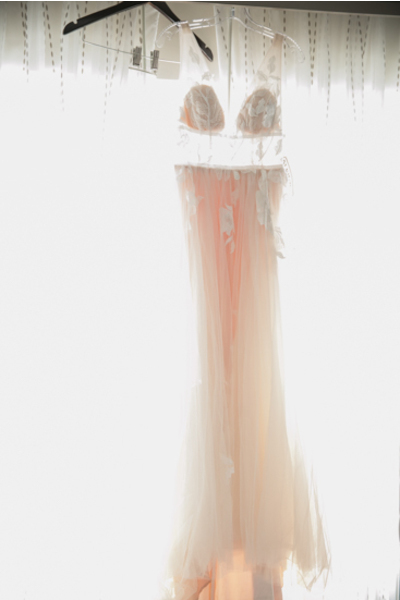 At last, she had assistance putting on her dazzling jewelry and dress to pose for more photos. 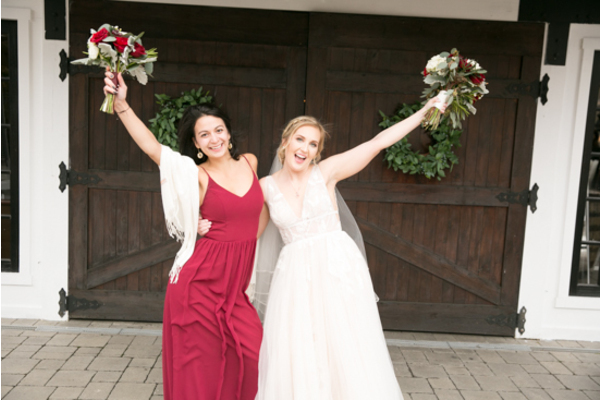 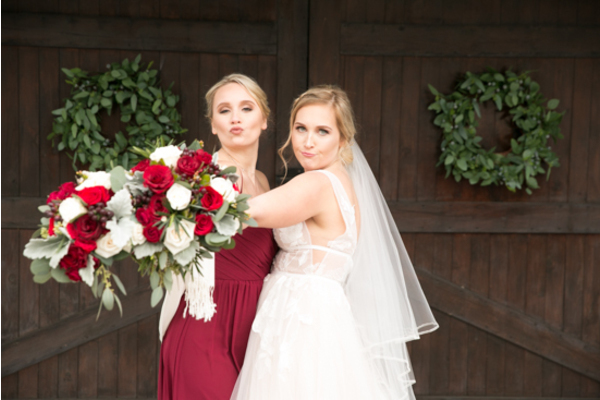 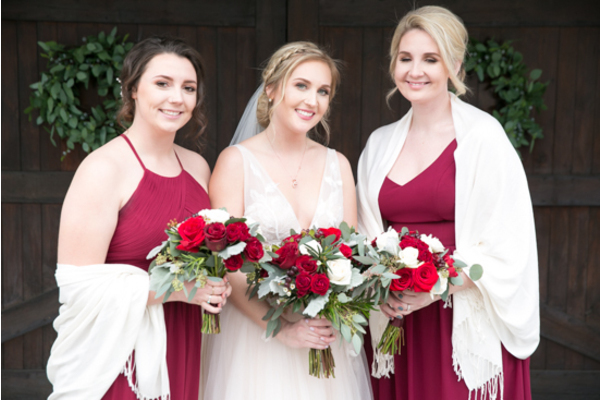 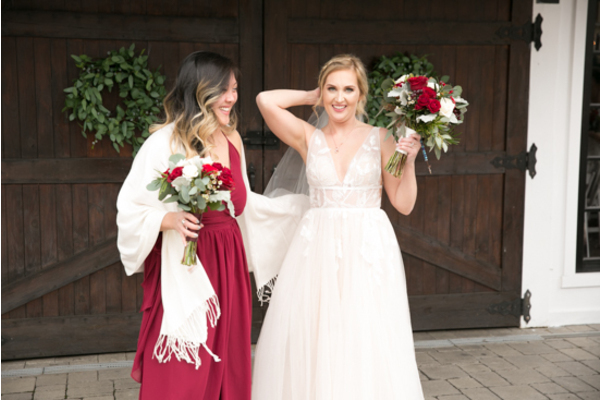 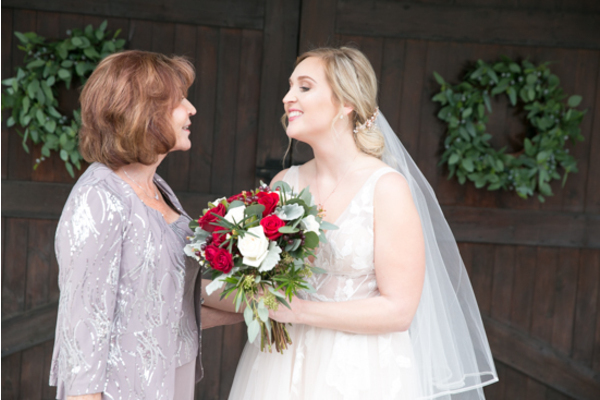 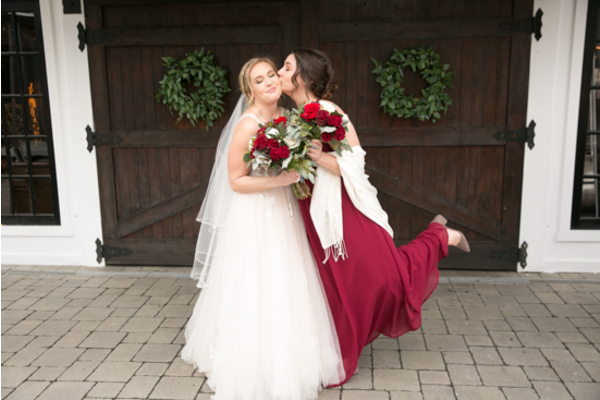 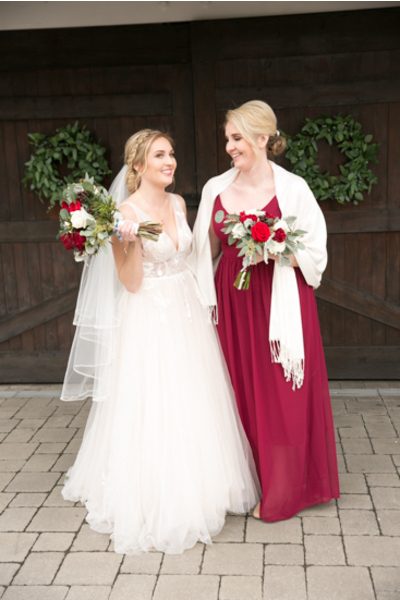 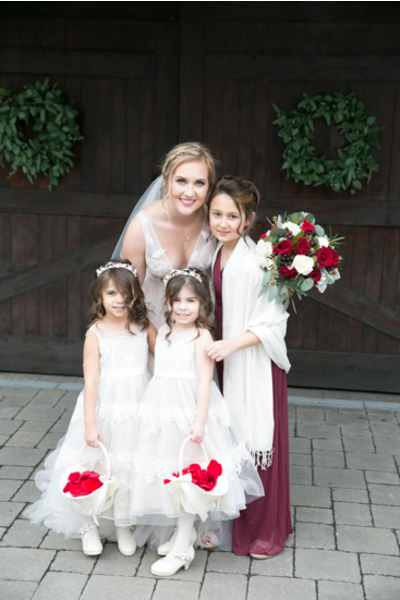 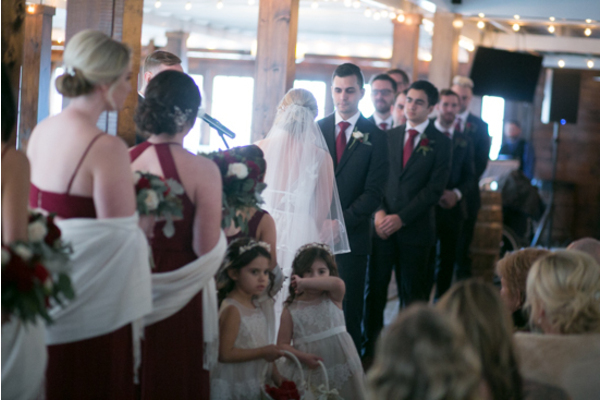 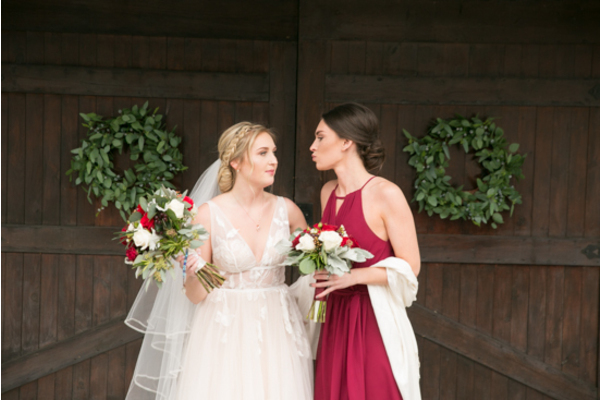 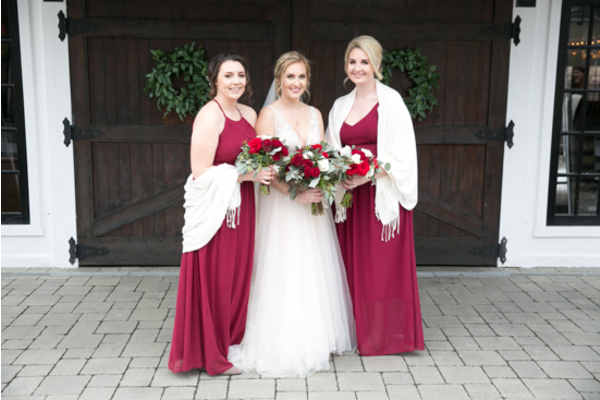 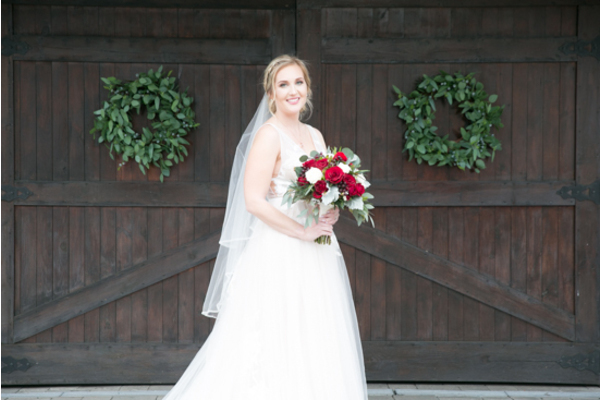 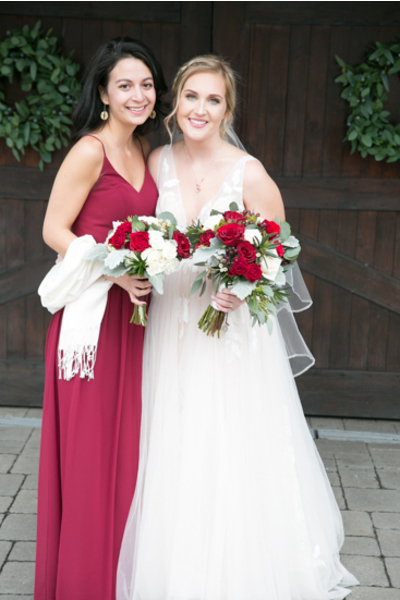 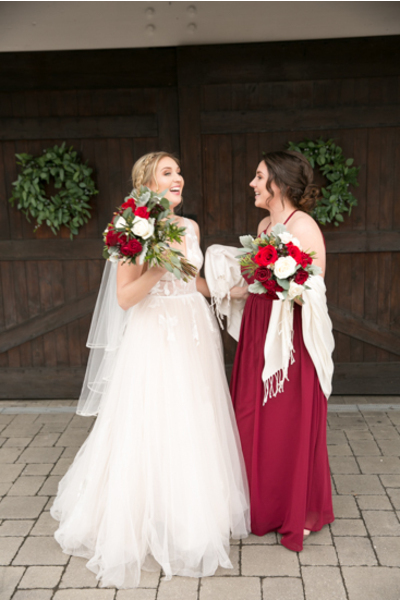 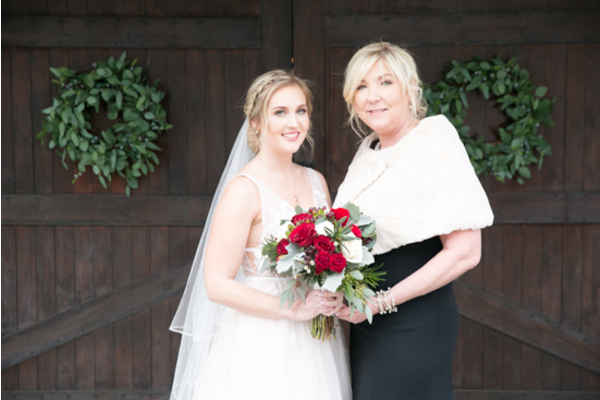 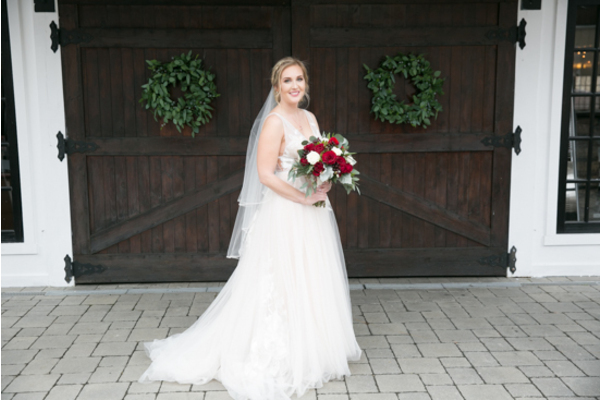 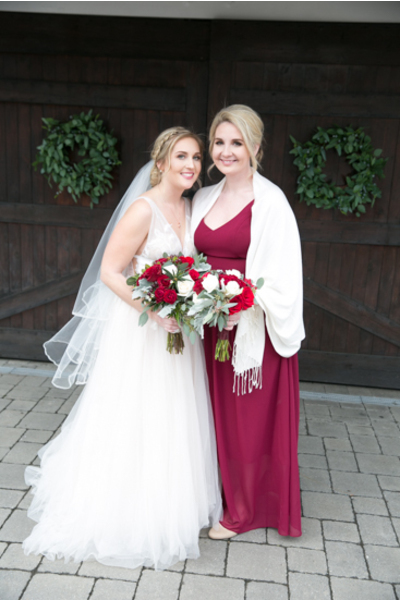 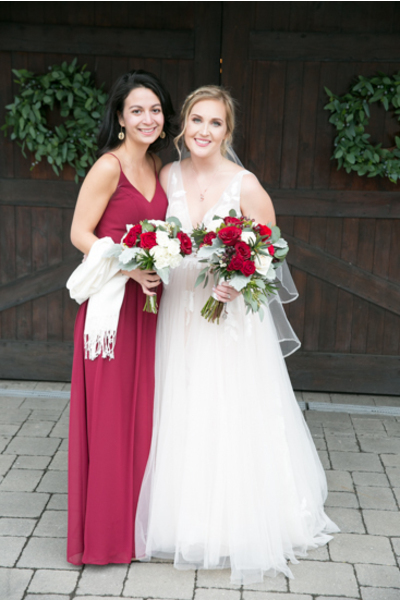 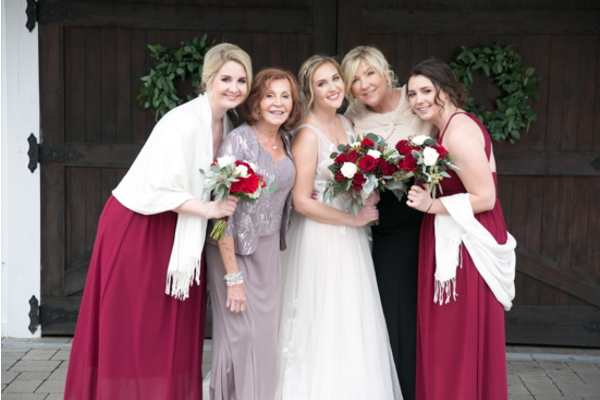 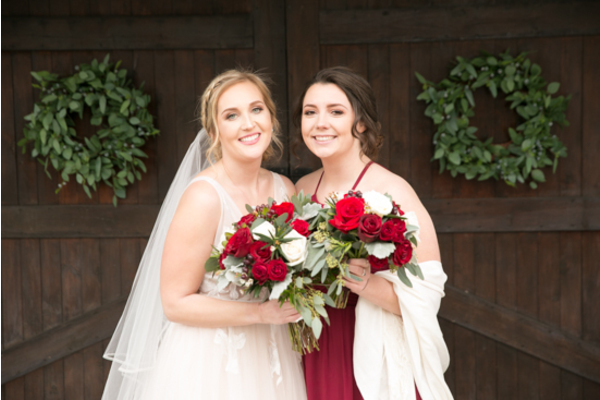 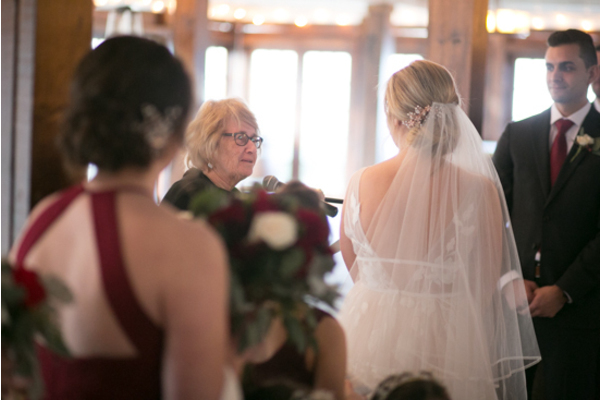 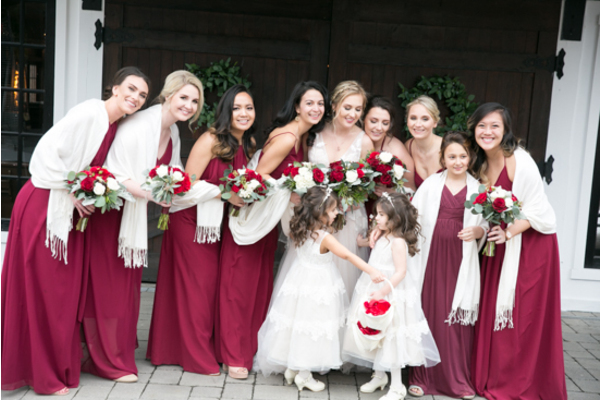 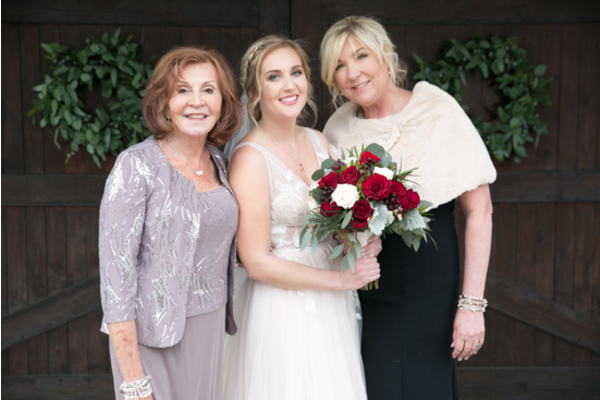 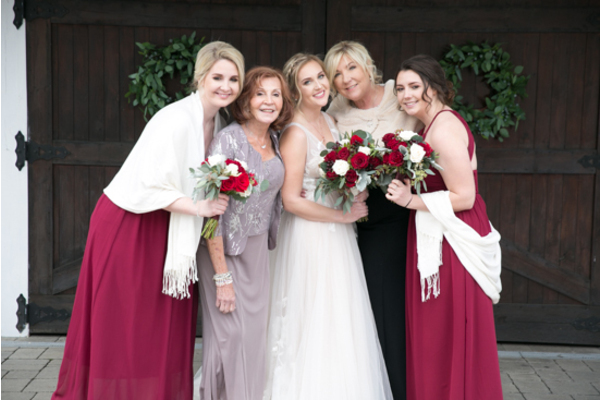 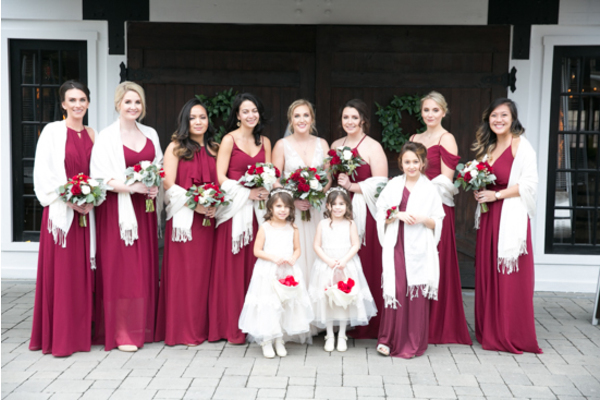 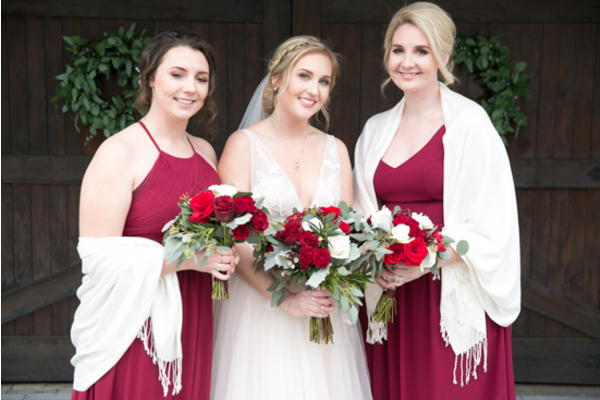 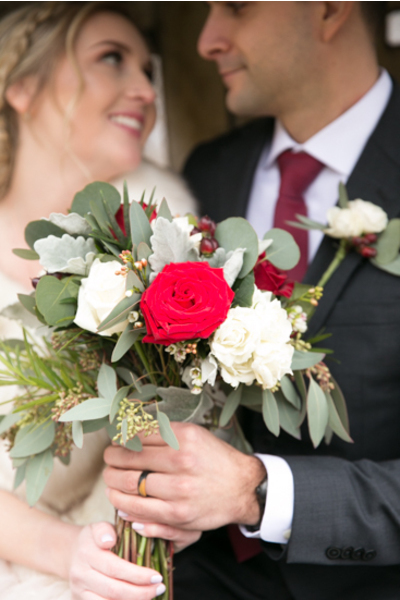 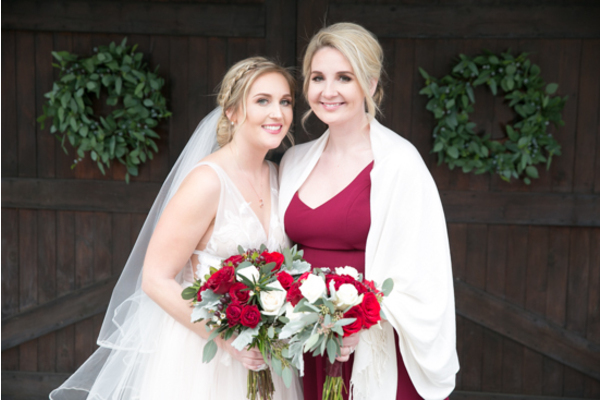 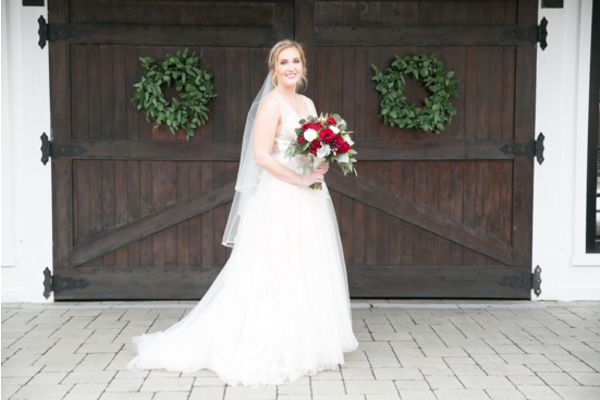 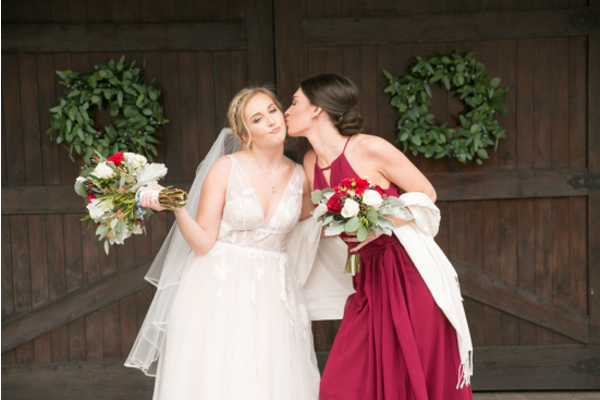 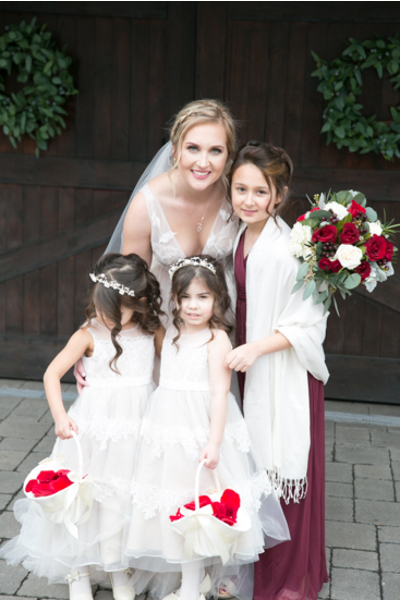 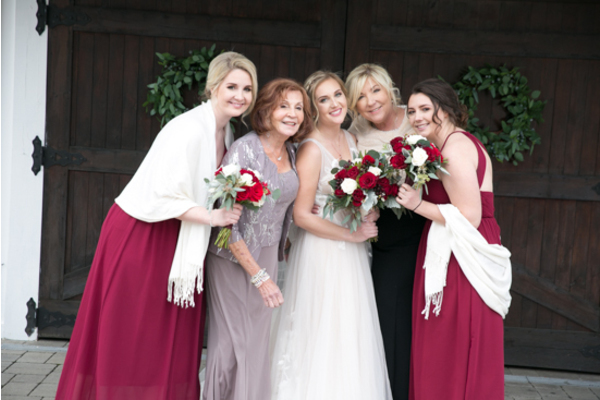 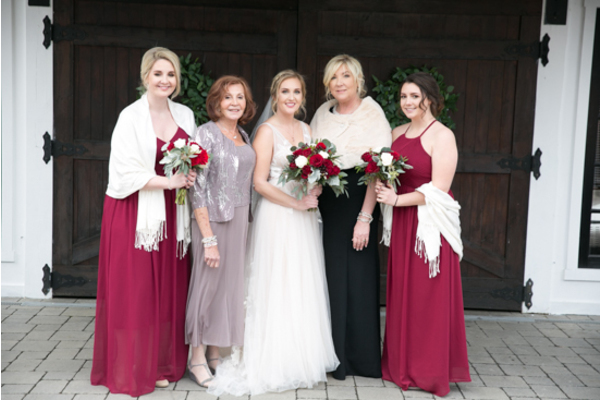 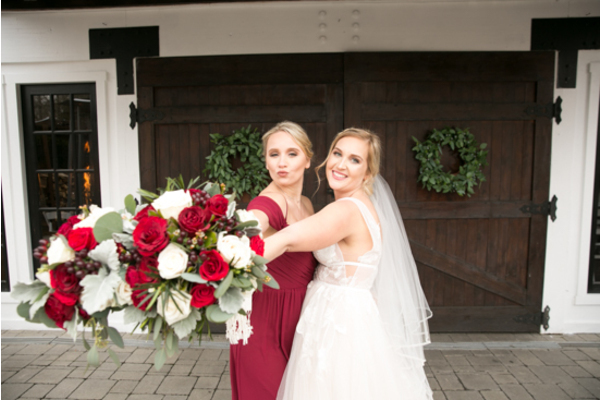 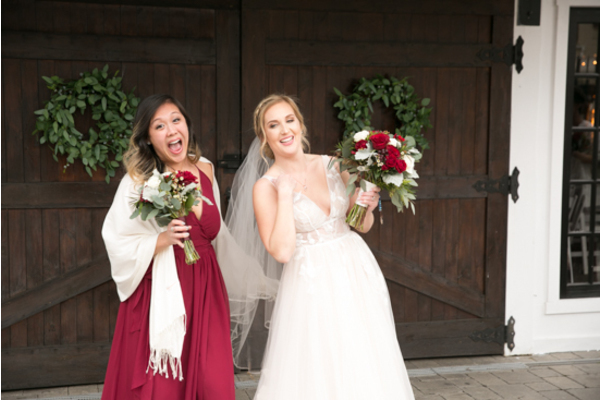 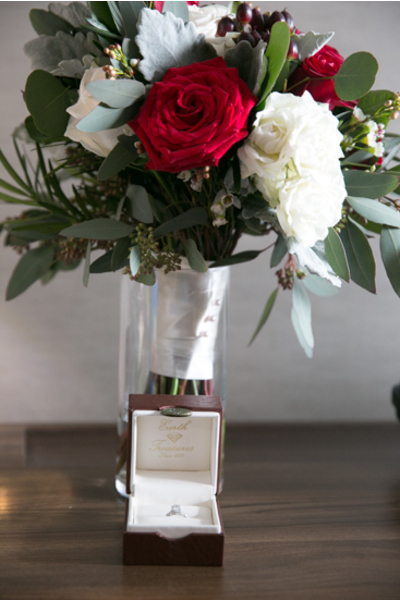 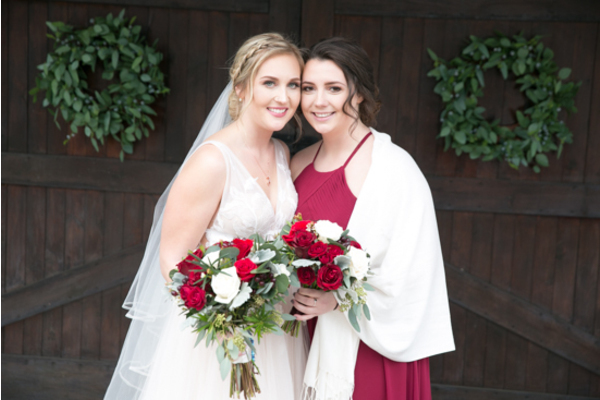 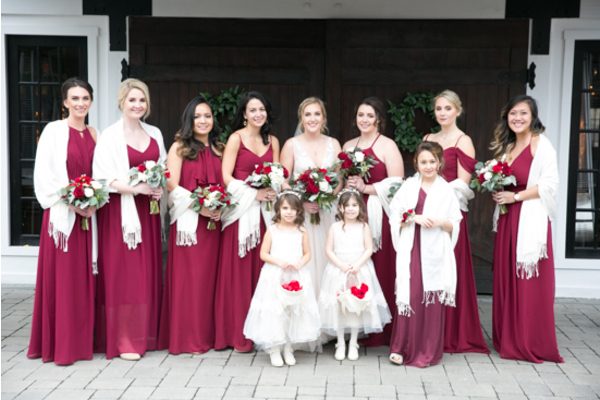 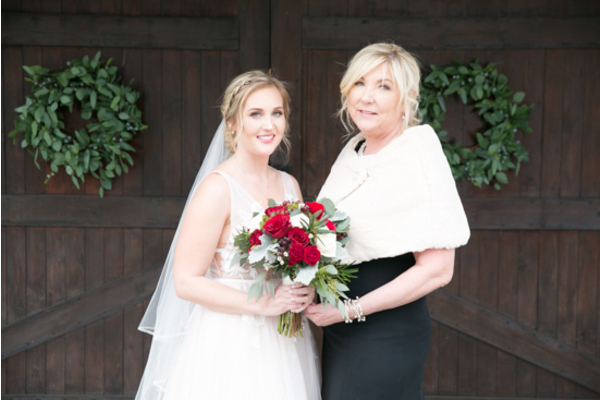 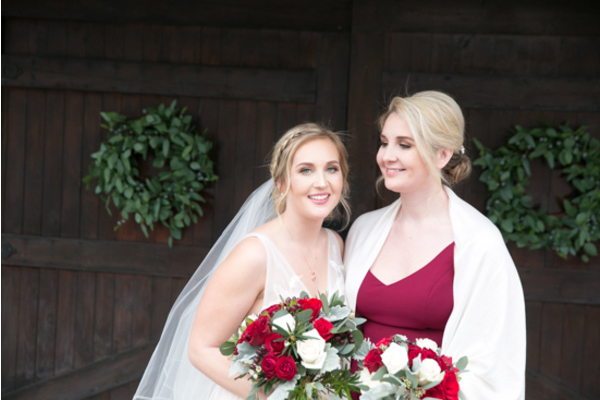 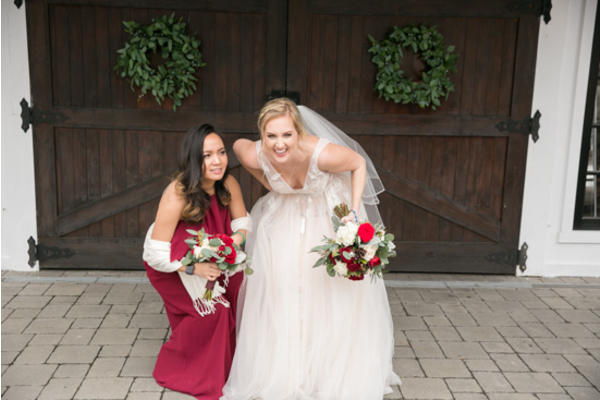 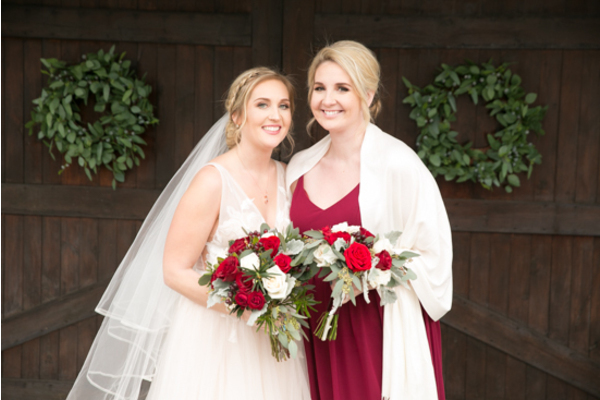 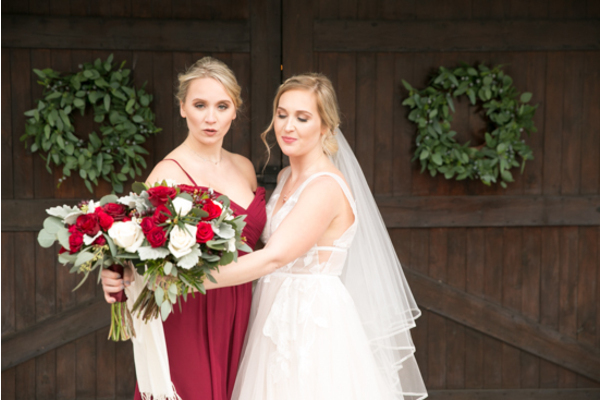 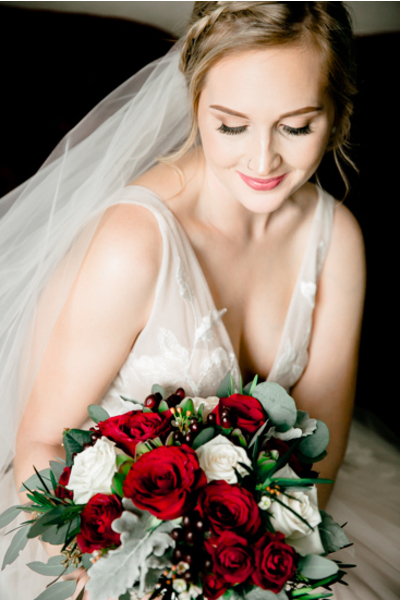 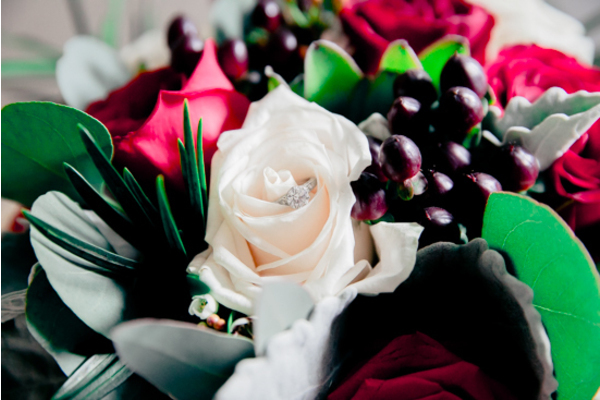 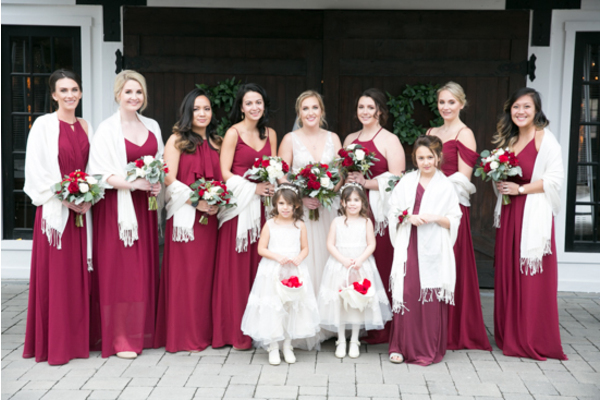 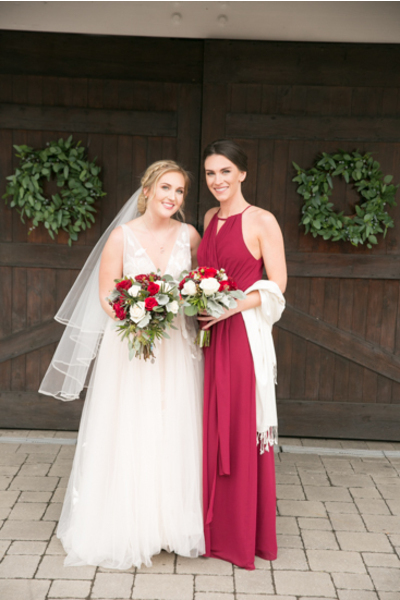 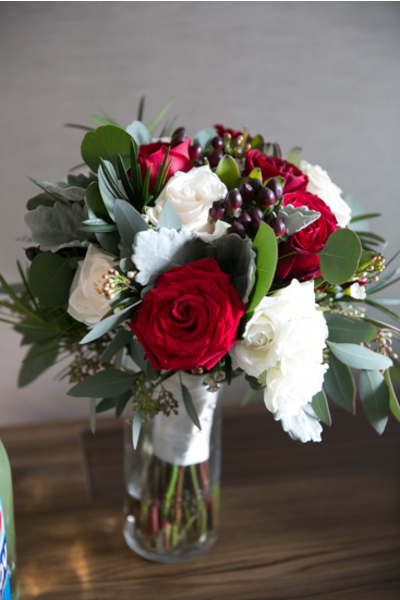 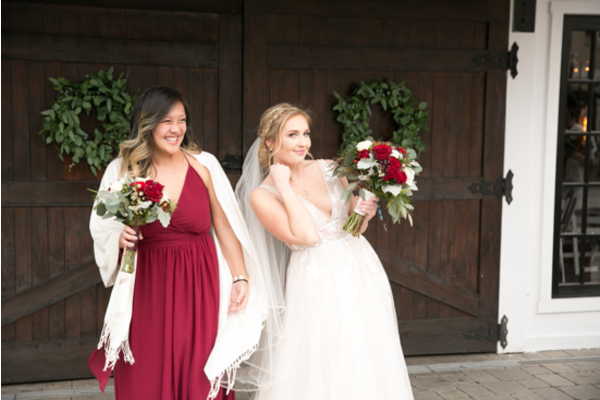 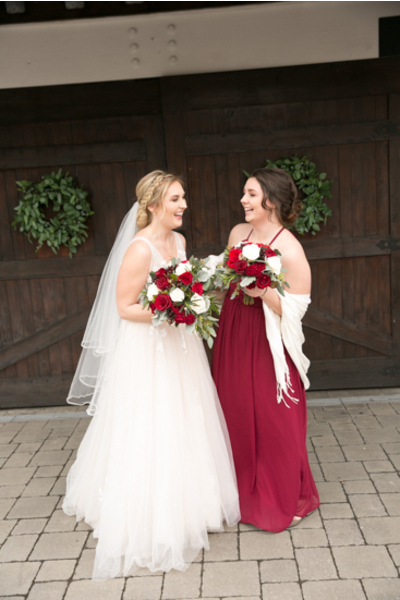 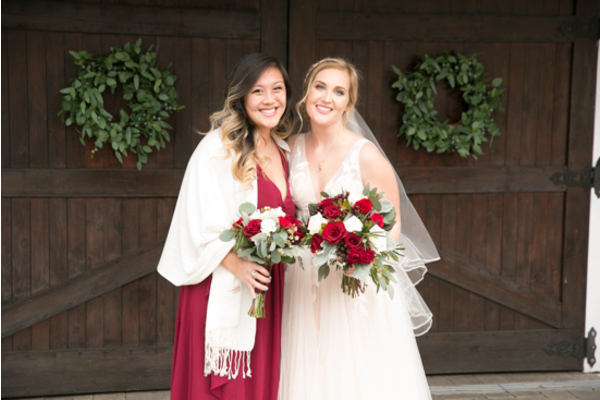 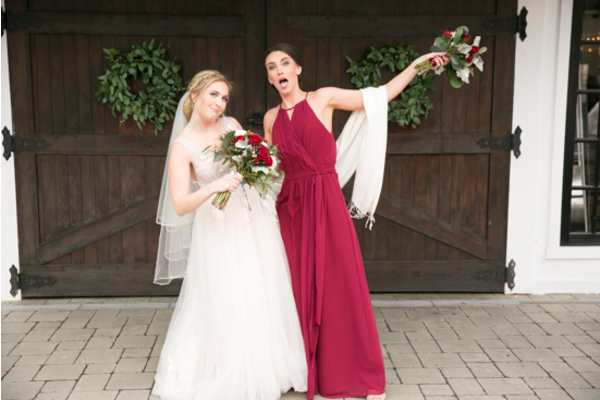 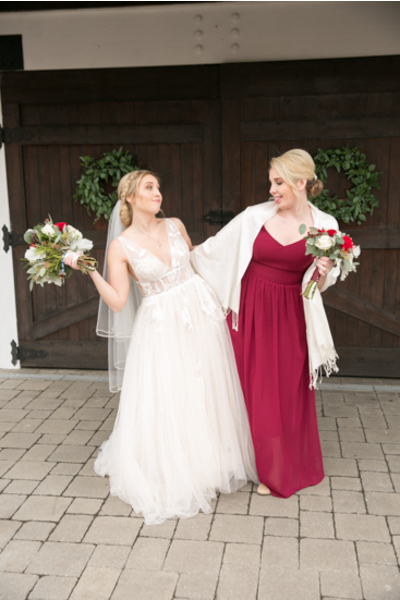 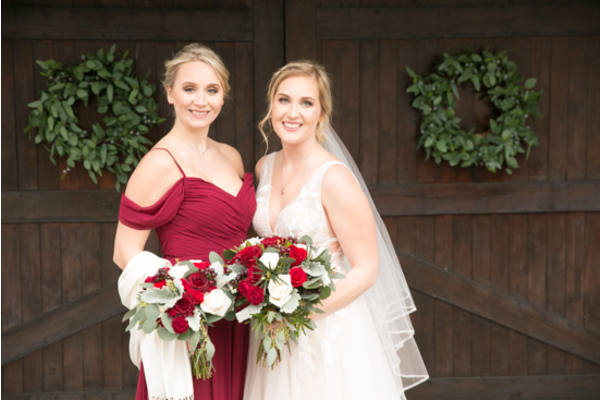 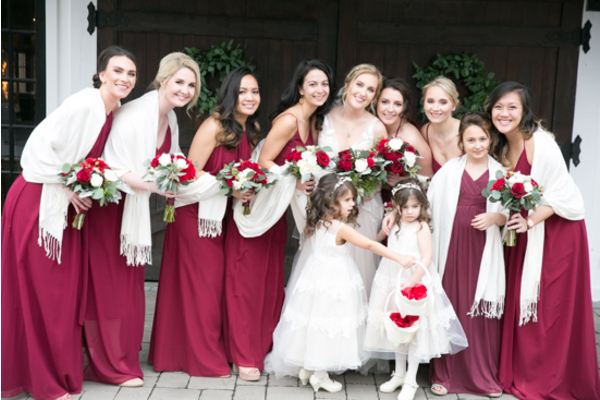 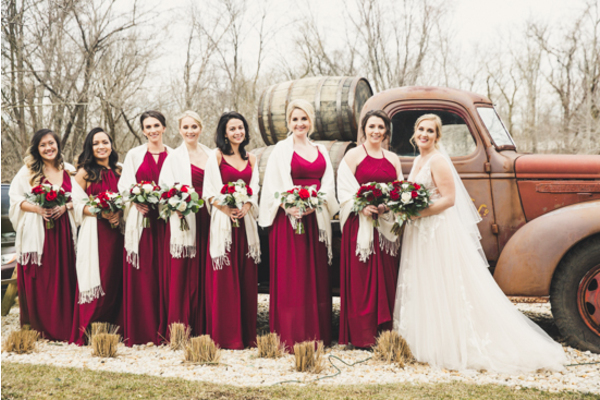 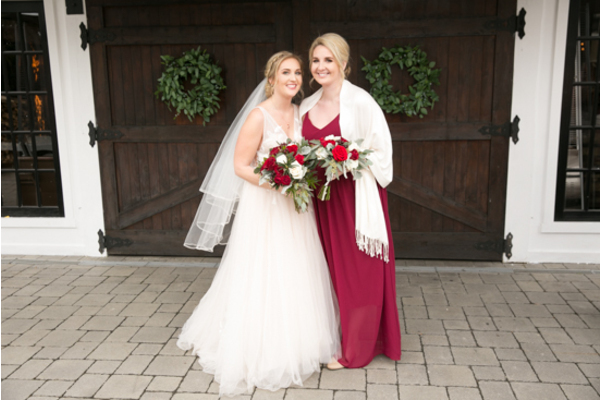 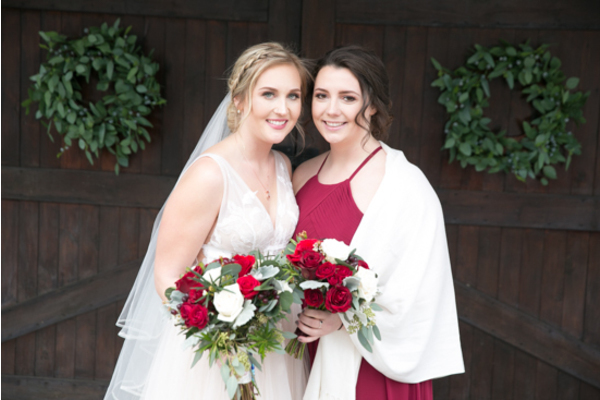 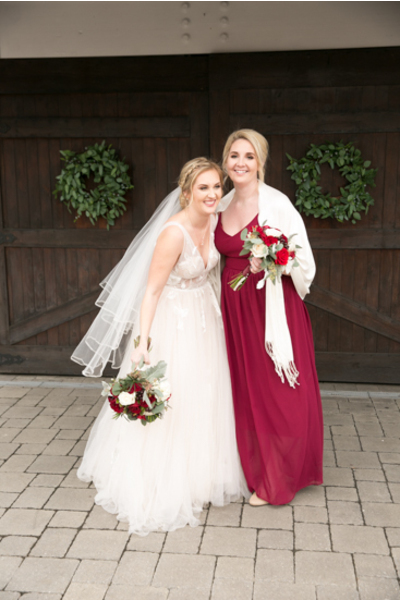 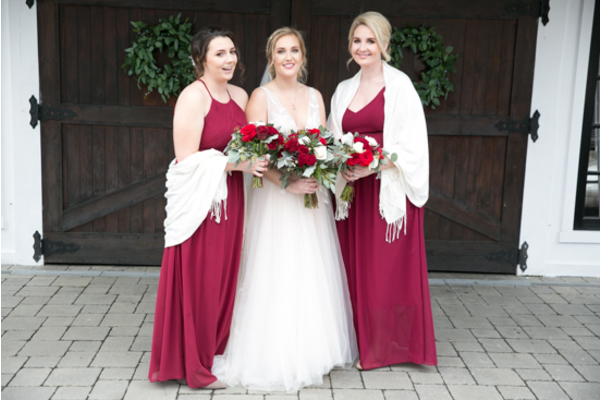 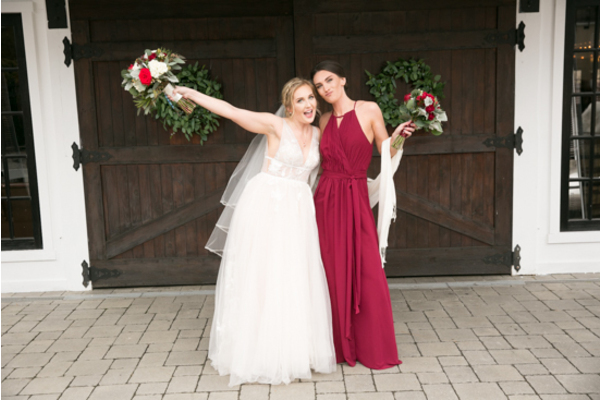 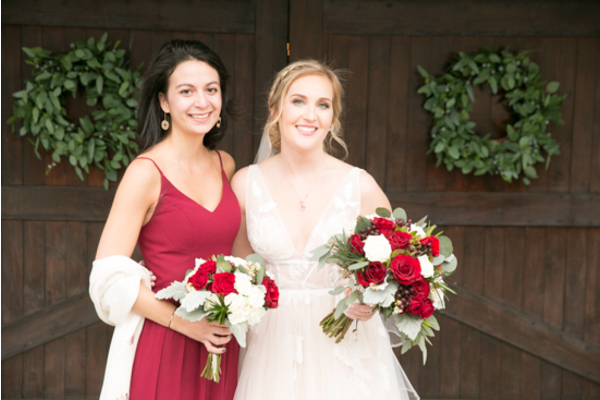 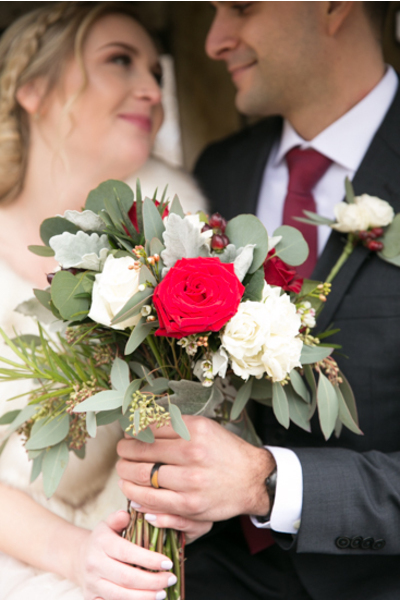 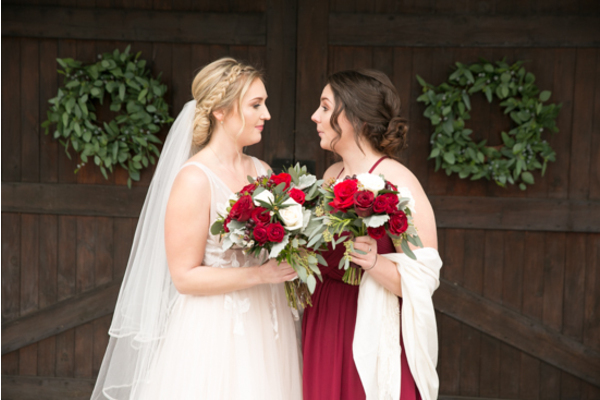 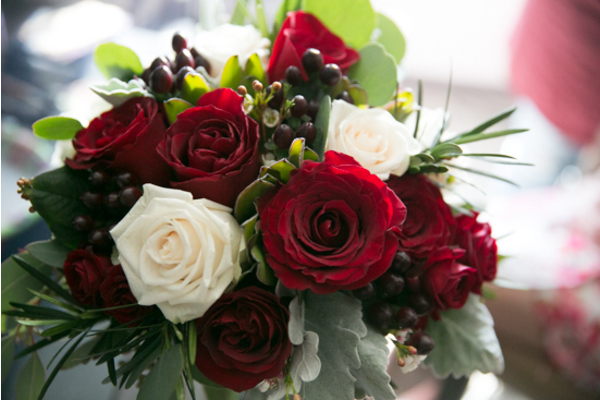 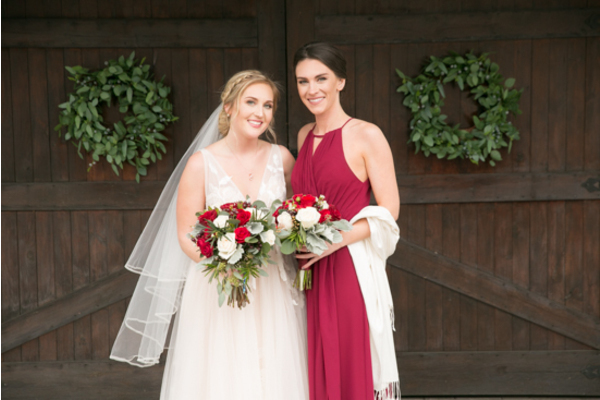 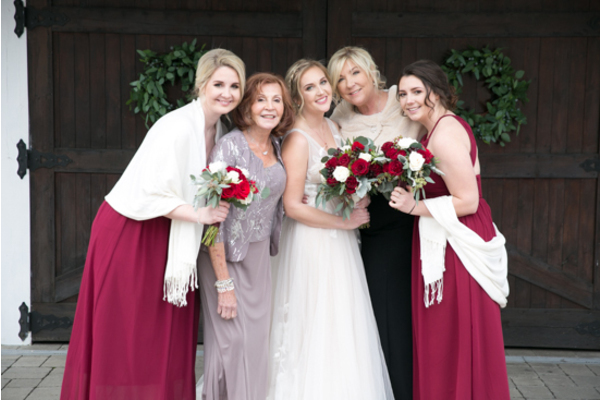 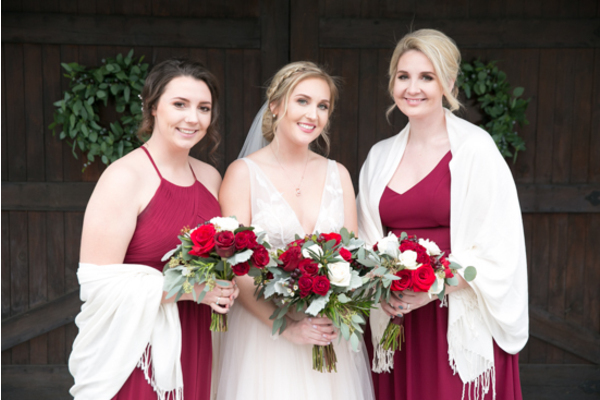 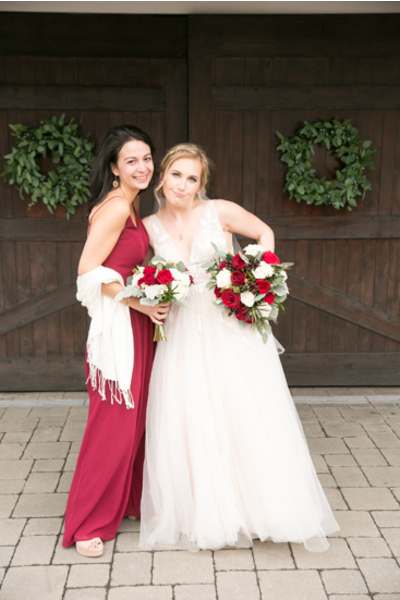 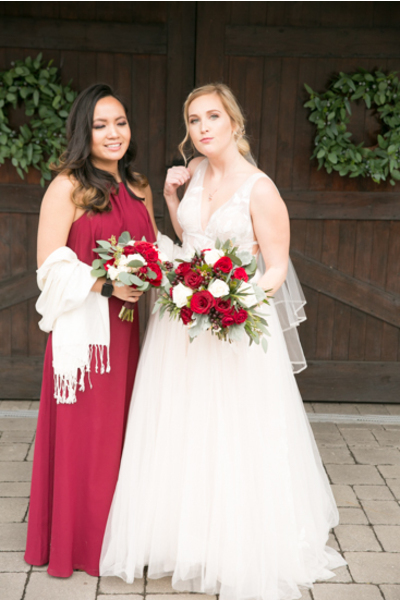 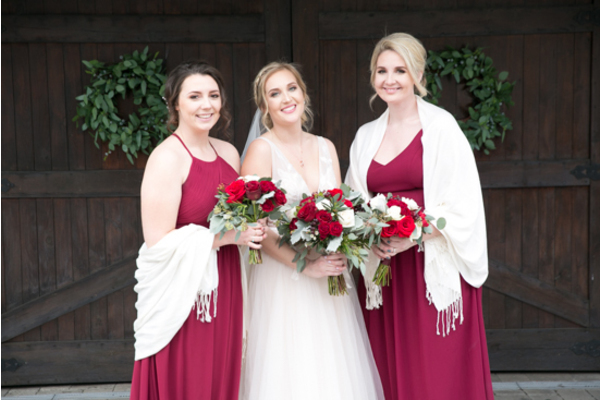 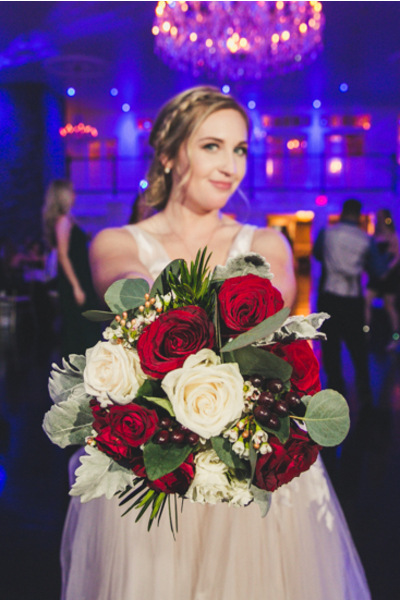 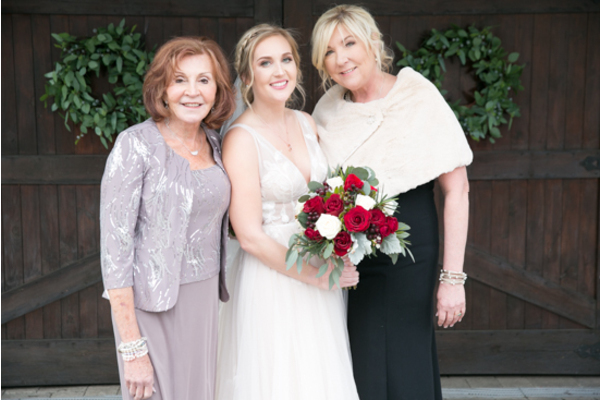 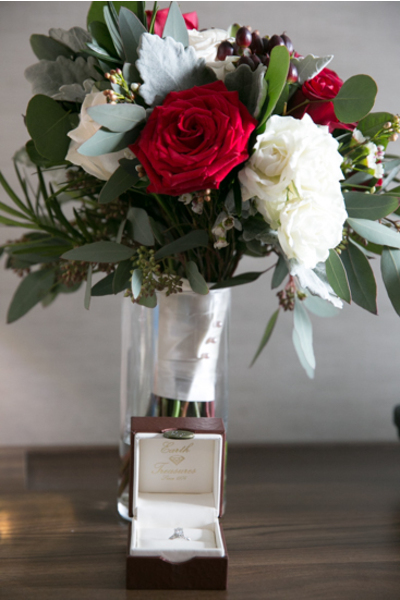 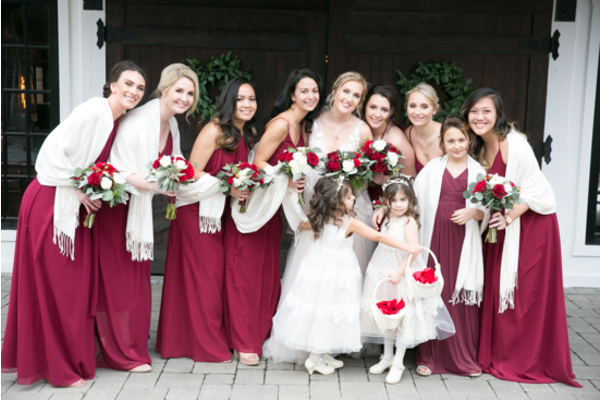 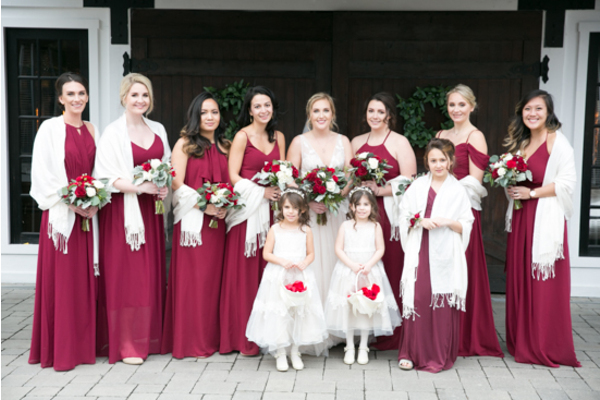 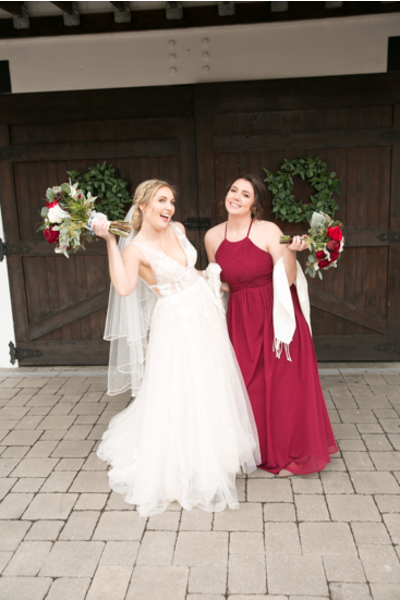 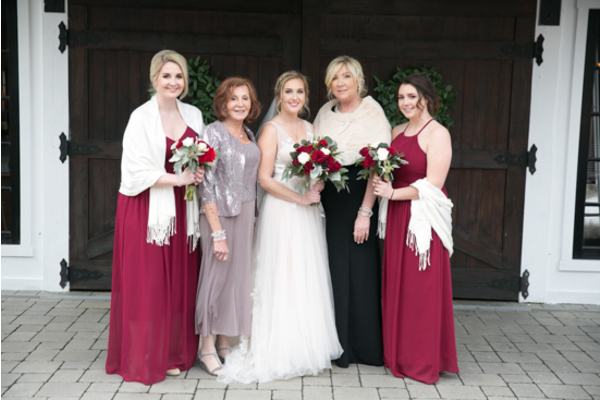 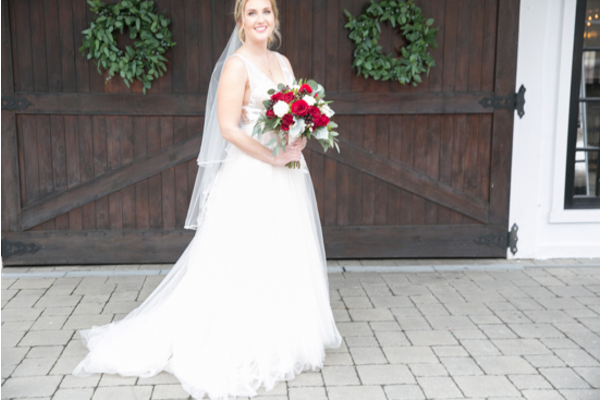 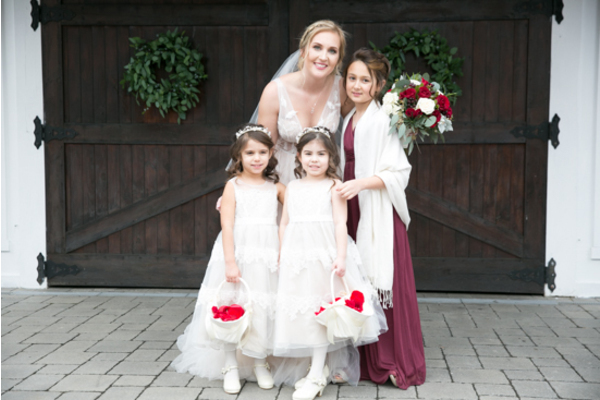 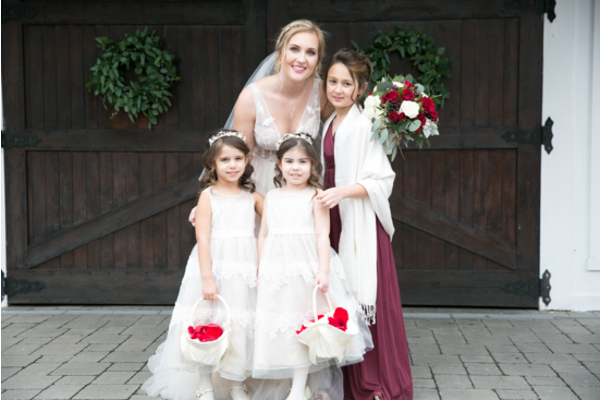 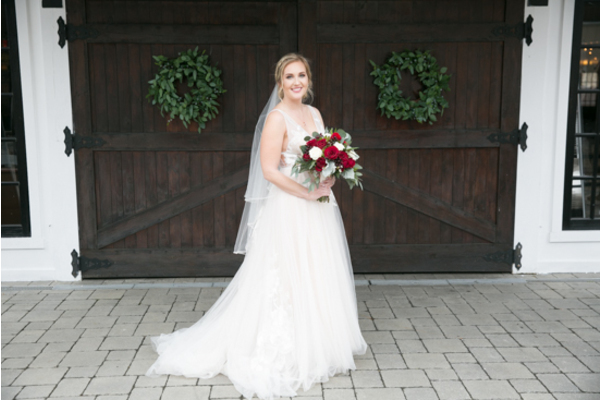 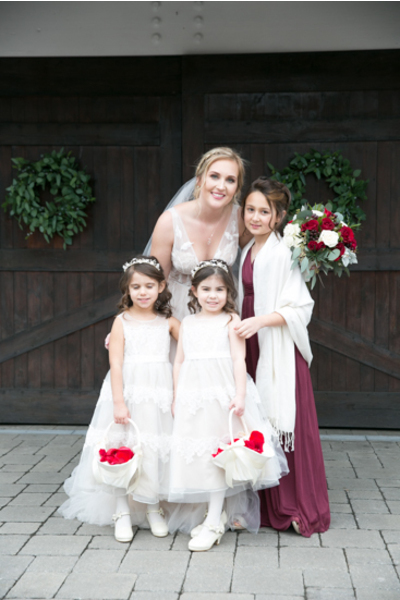 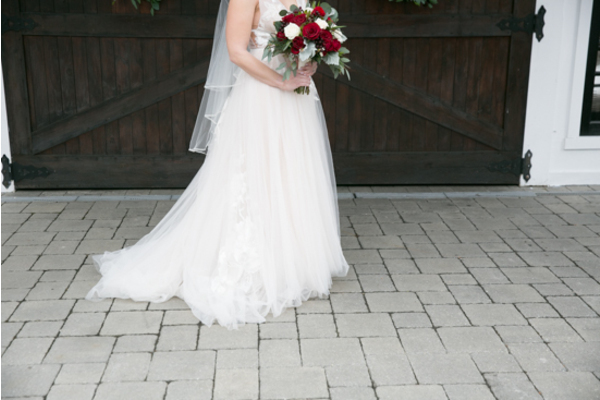 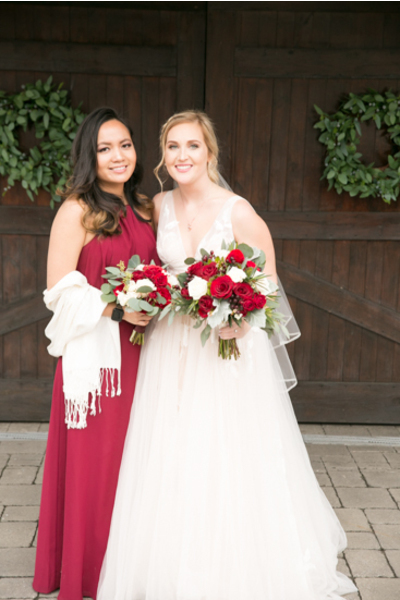 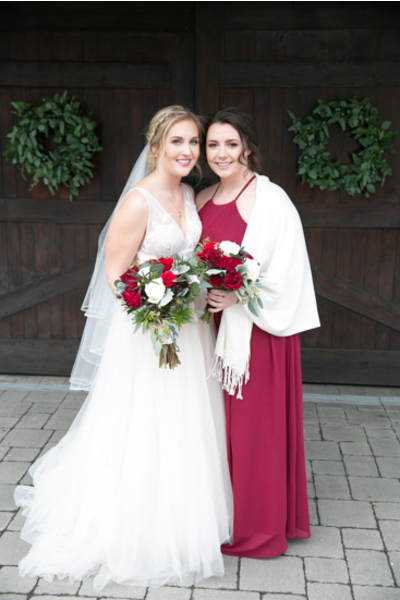 Her bridesmaids were dressed in beautiful cherry red dresses that perfectly complemented her rose bouquet! 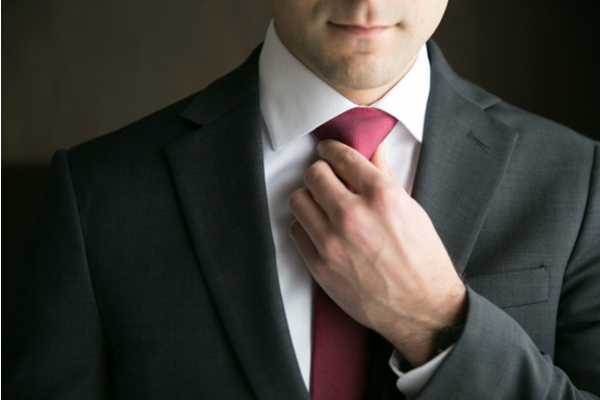 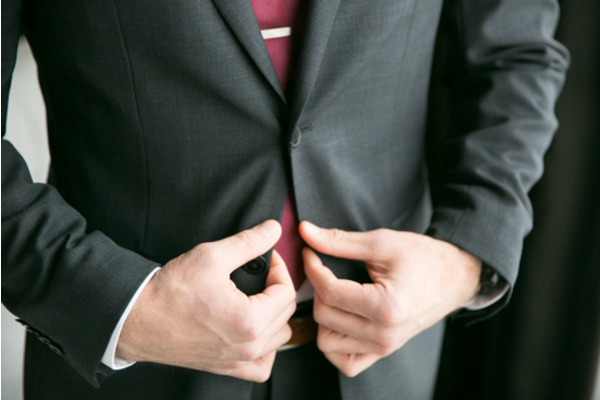 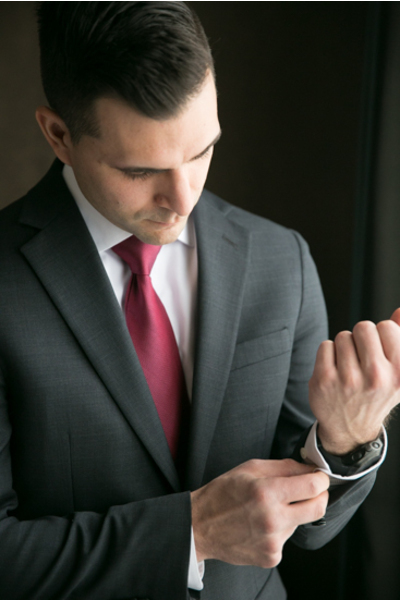 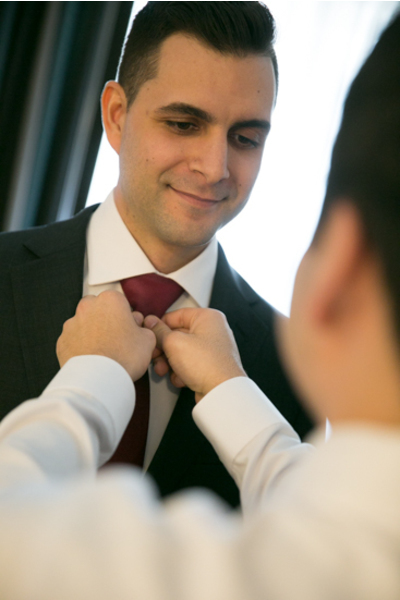 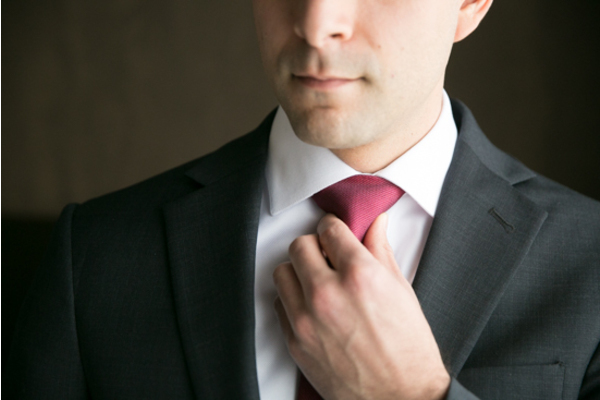 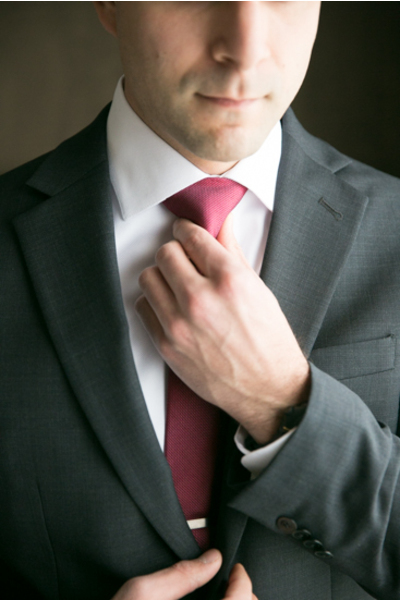 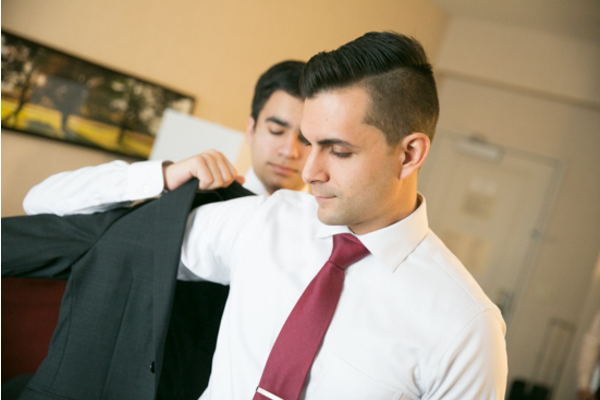 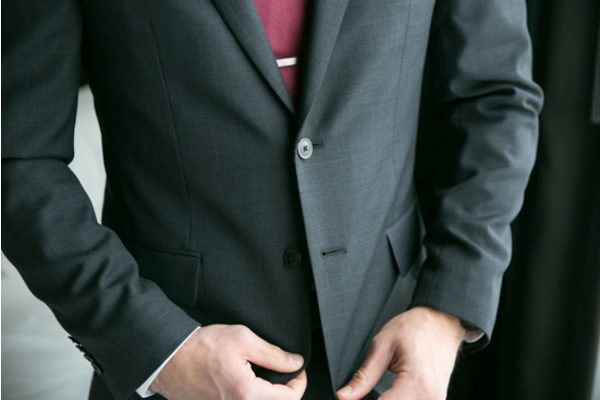 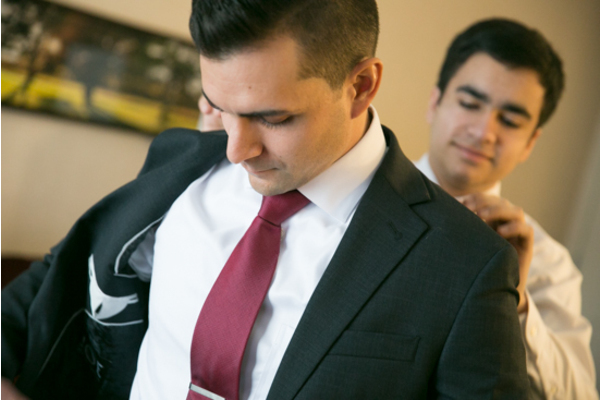 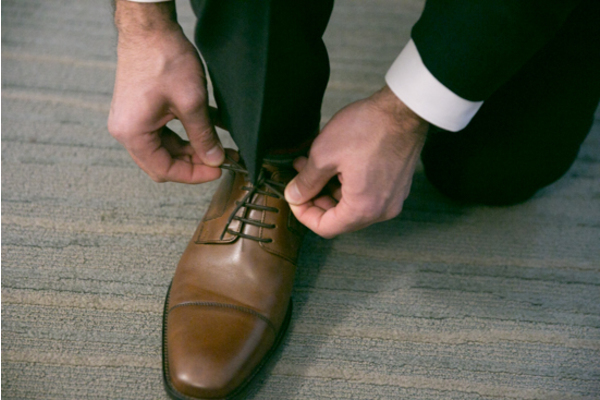 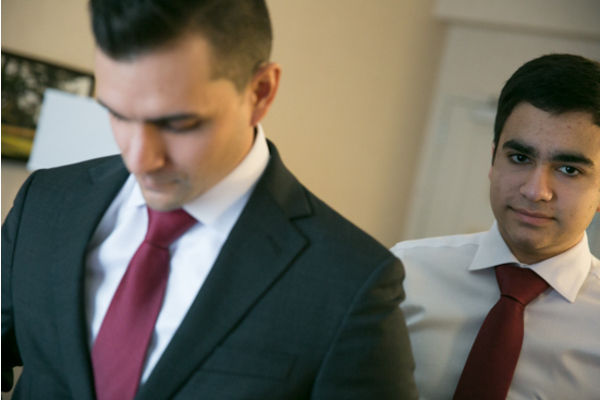 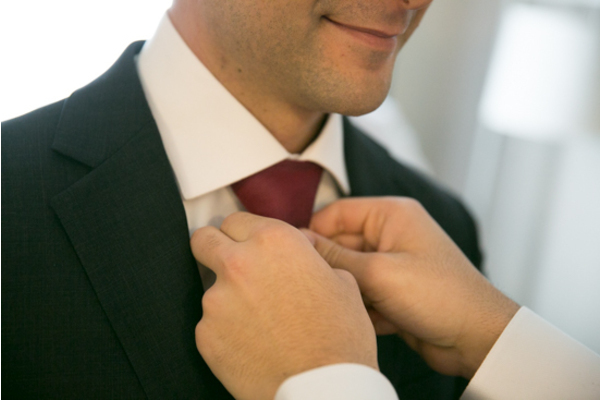 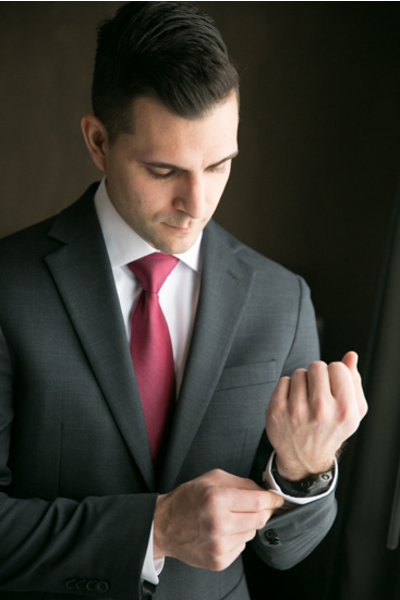 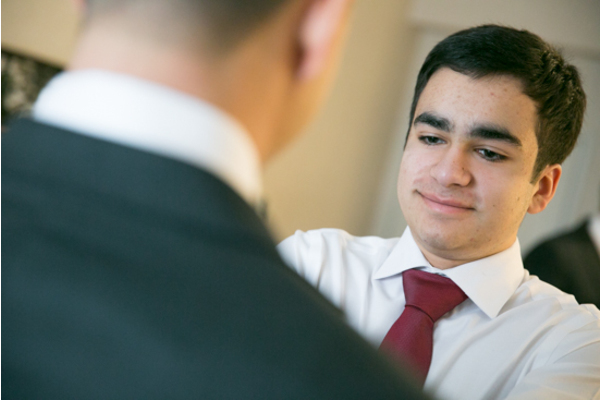 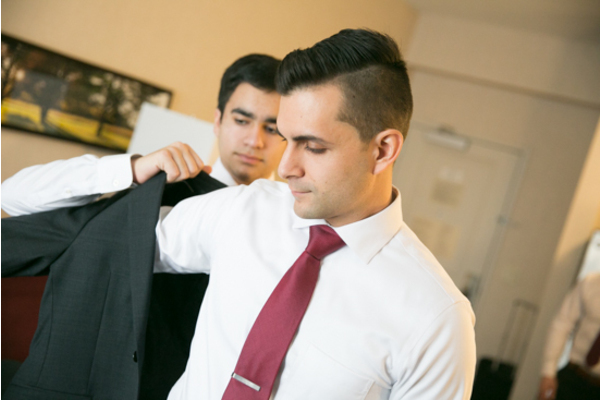 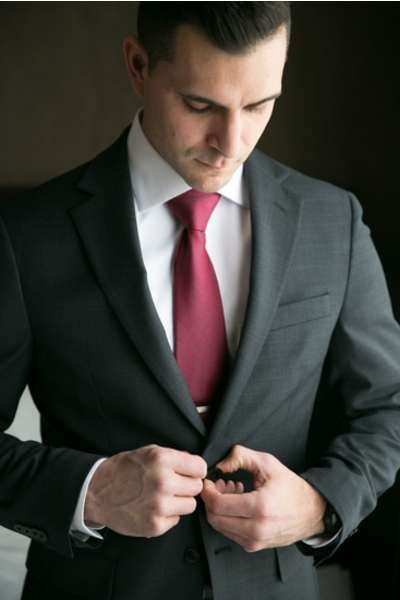 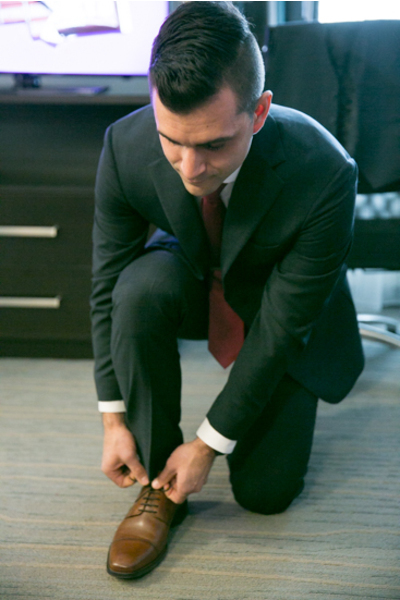 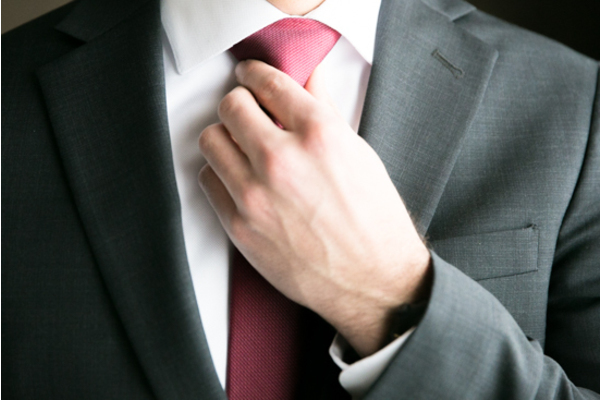 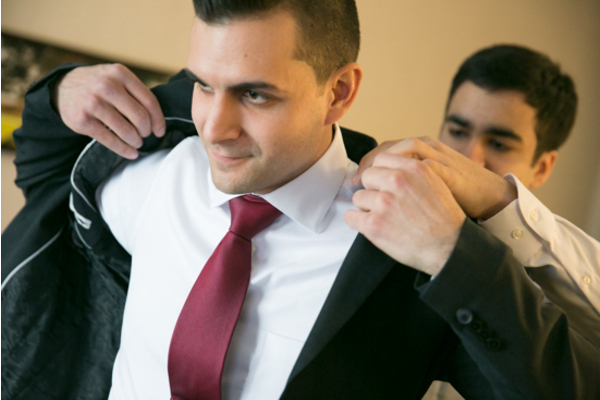 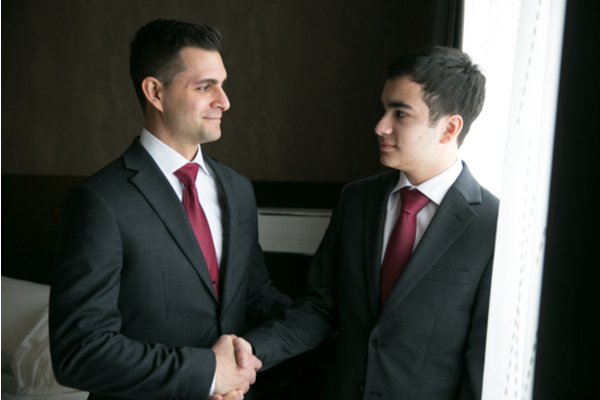 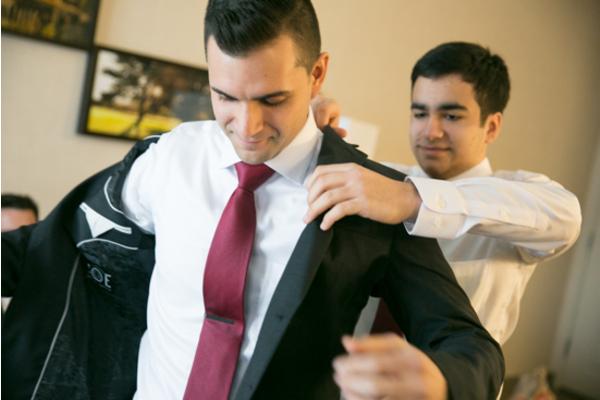 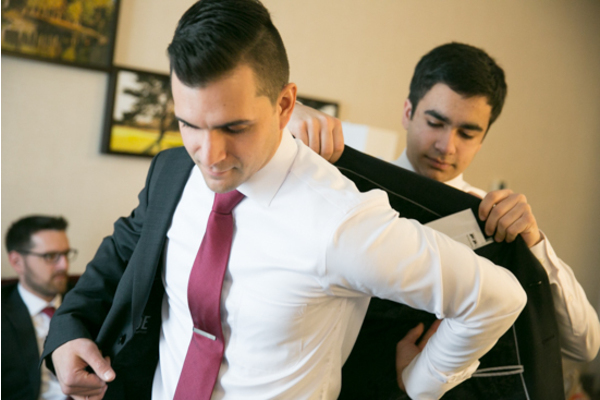 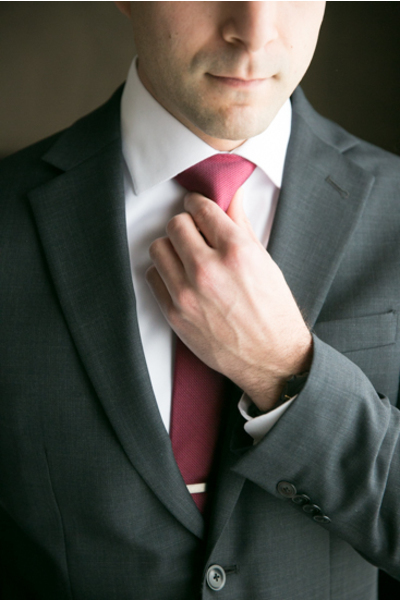 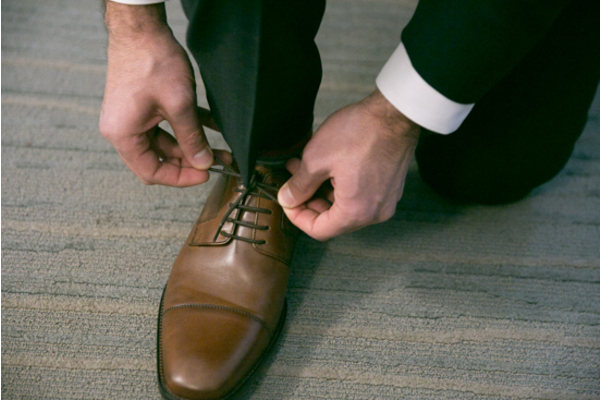 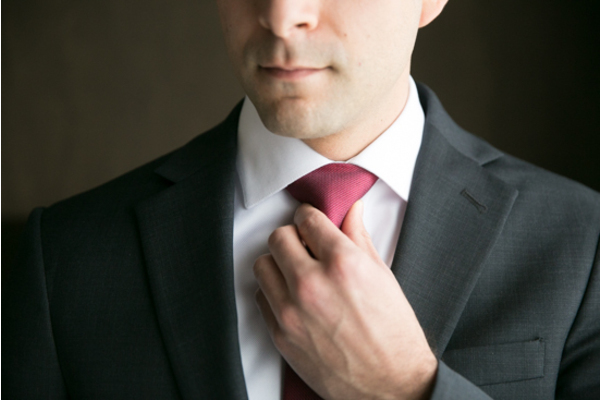 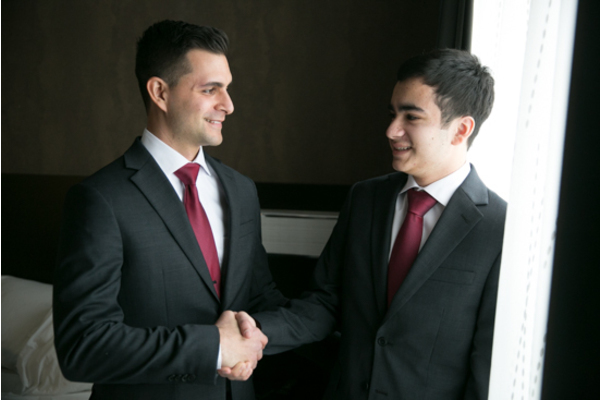 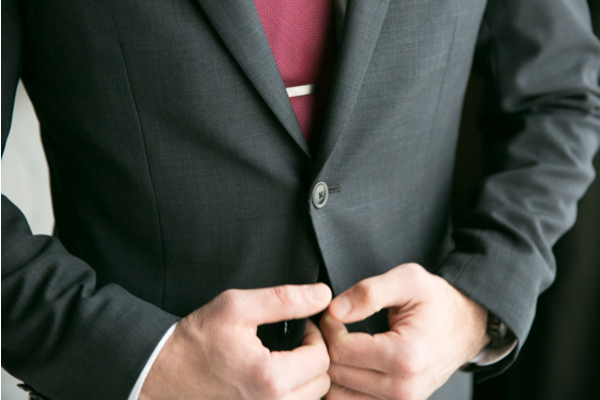 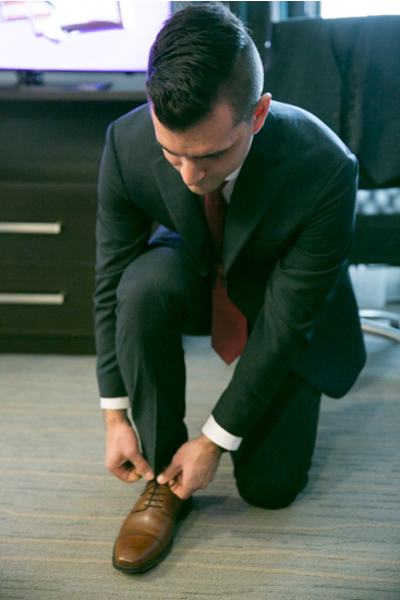 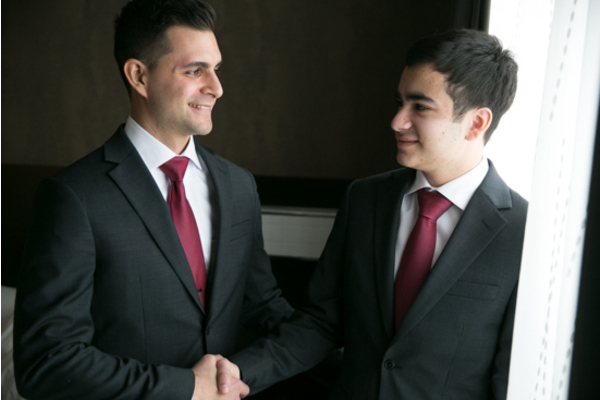 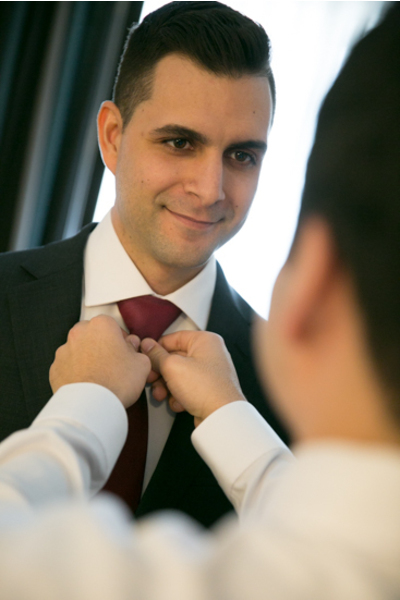 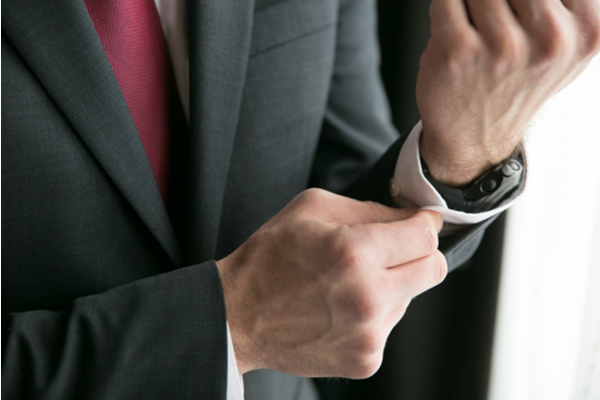 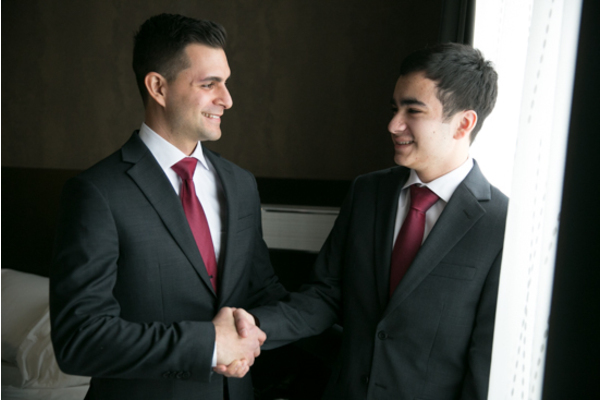 Meanwhile, Nick and his groomsmen were adding the finishing touches to their looks. 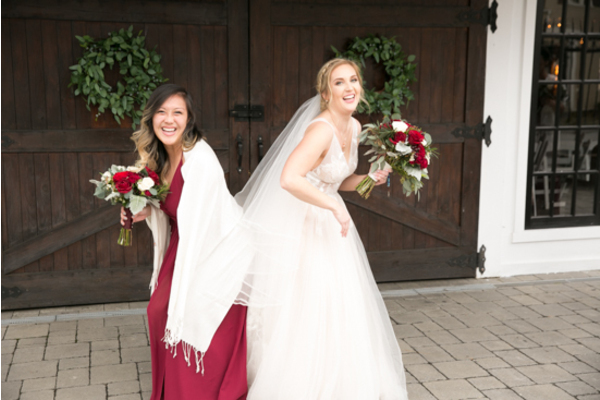 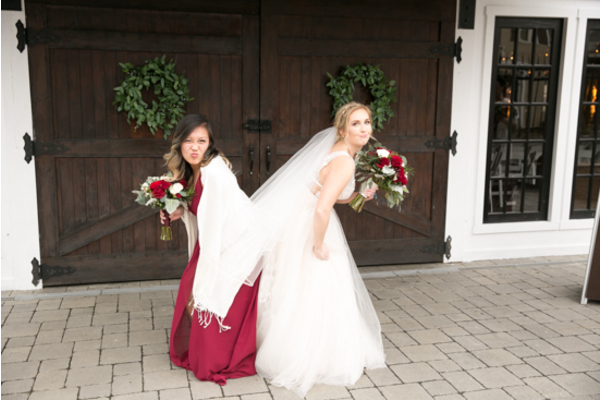 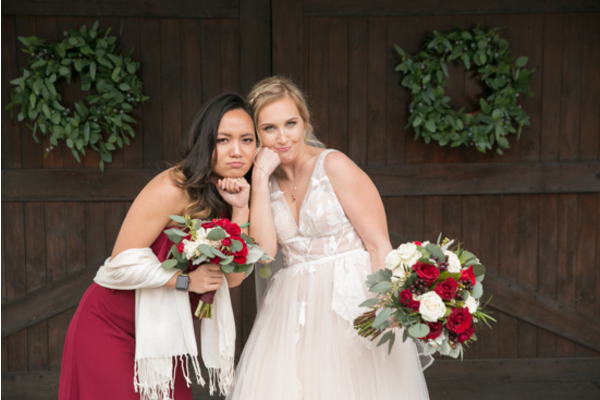 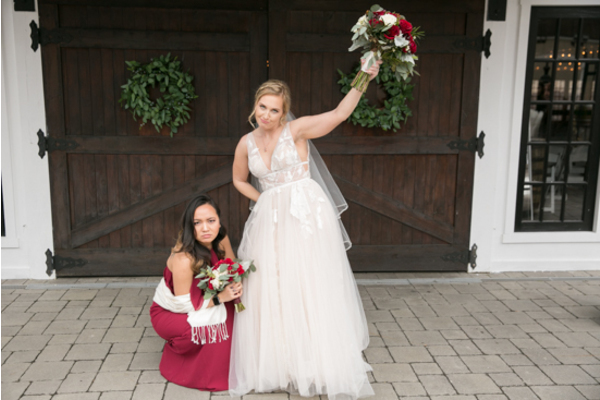 After, they got some fun and silly pictures outside before the ceremony! 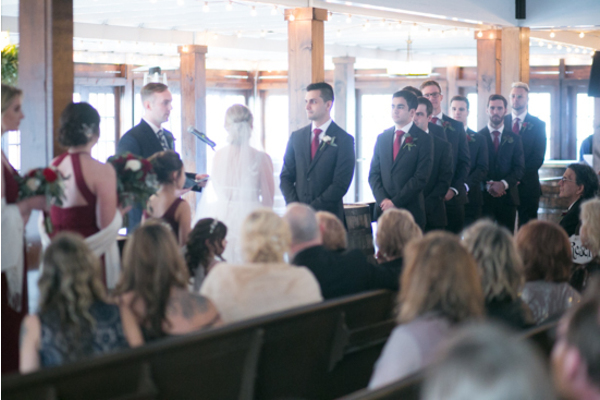 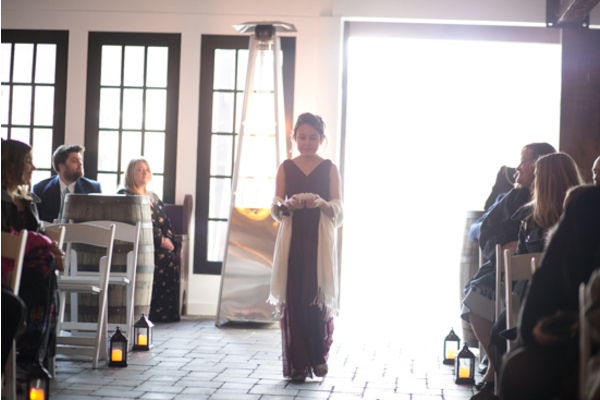 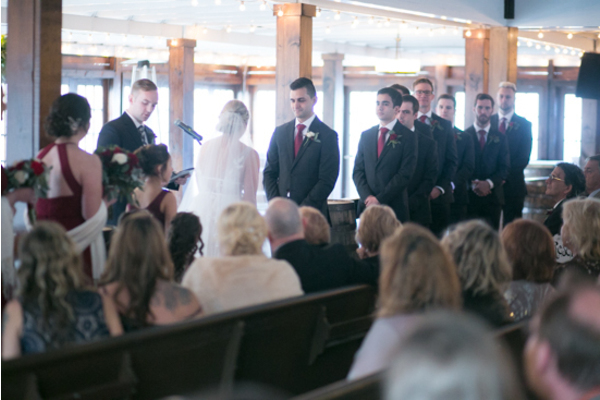 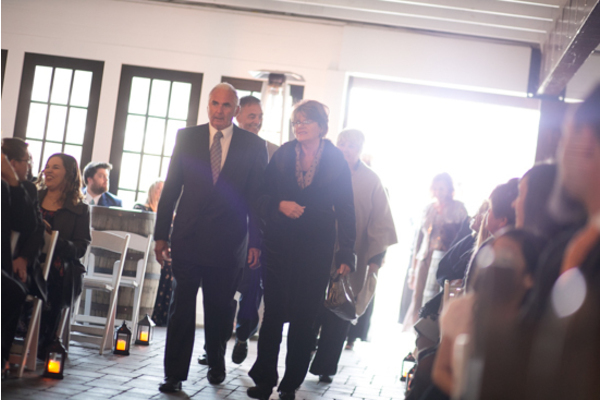 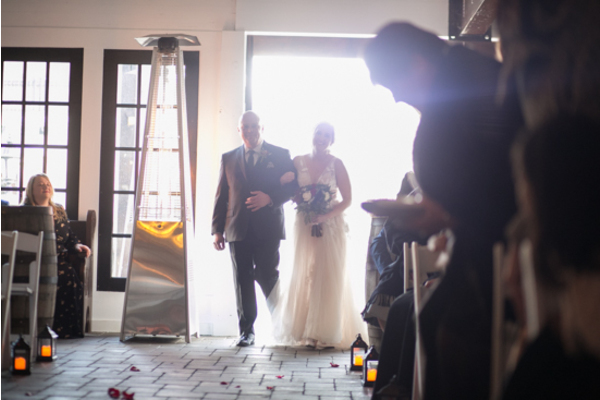 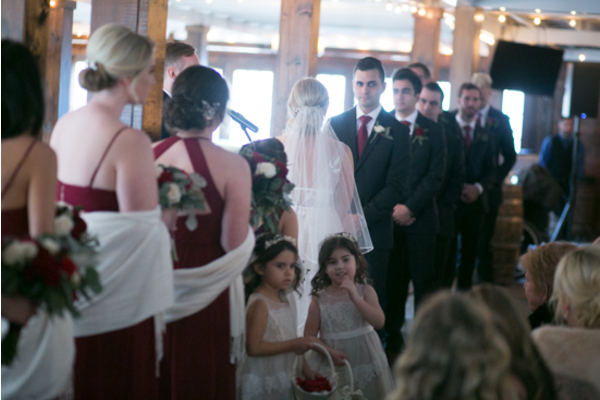 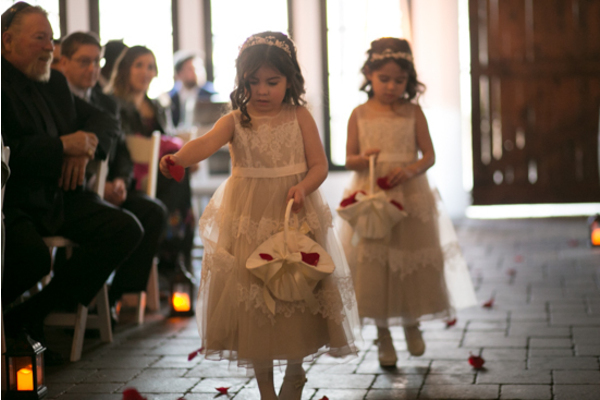 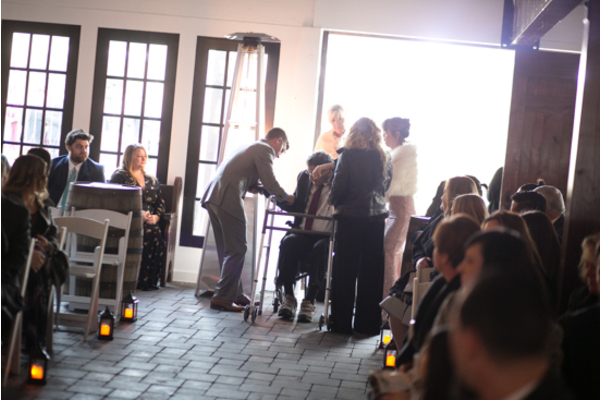 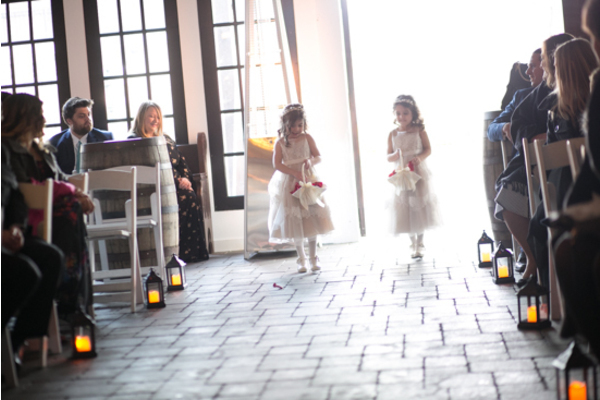 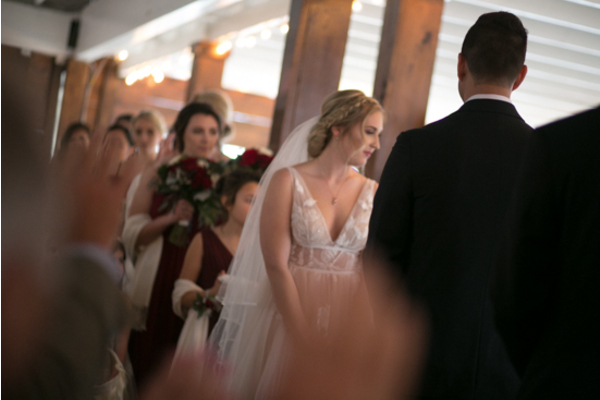 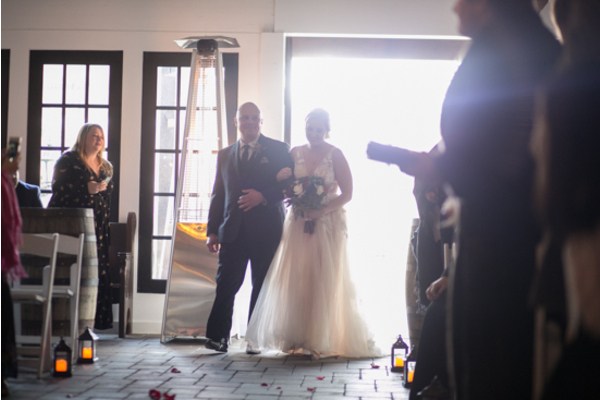 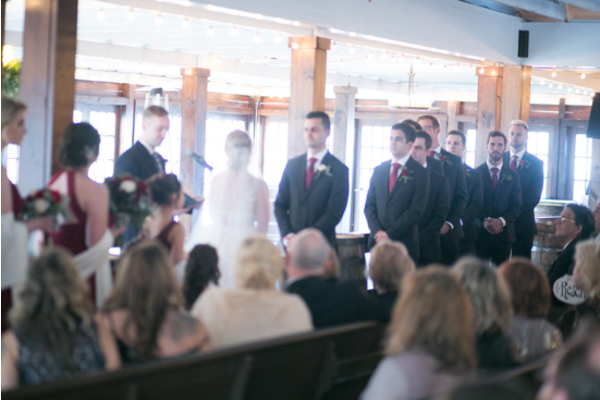 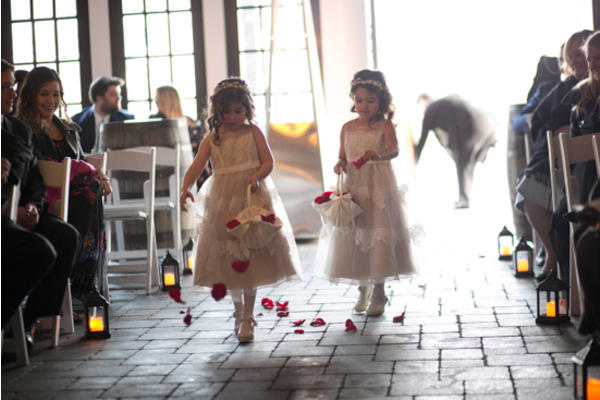 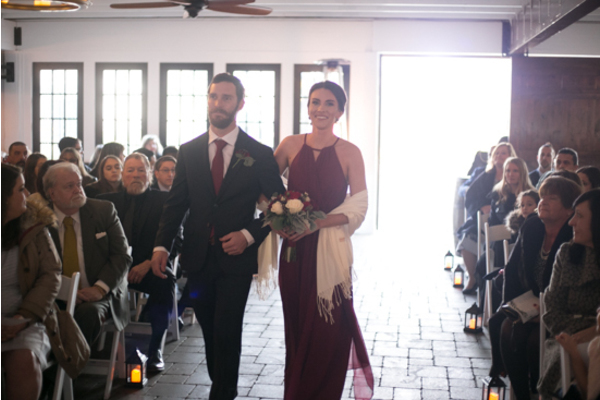 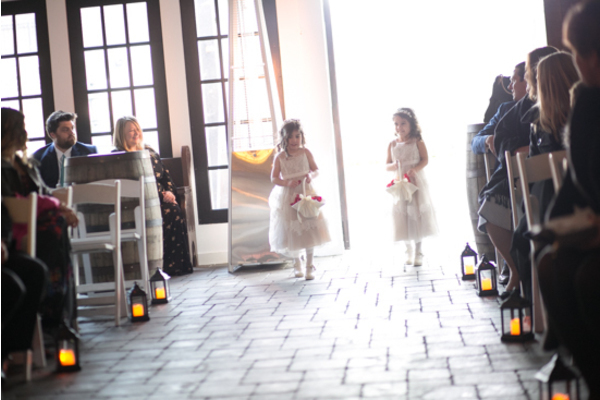 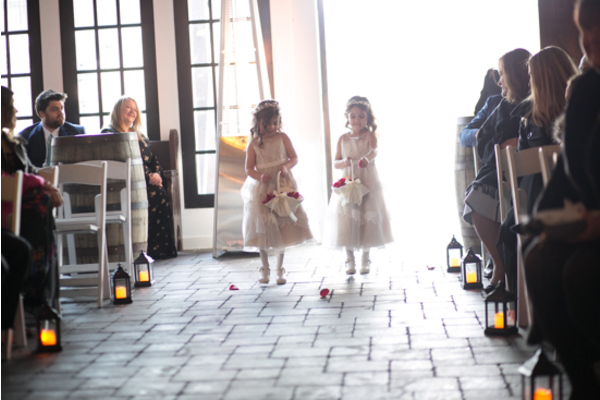 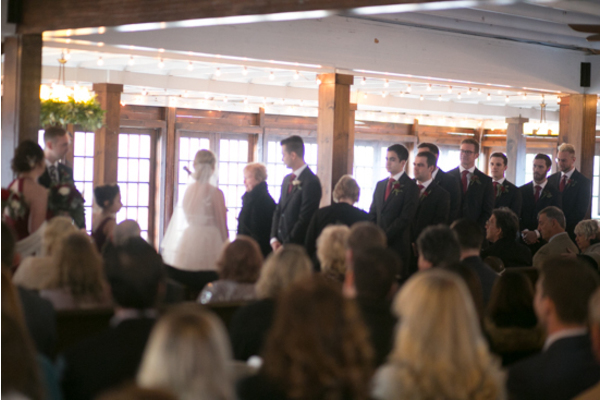 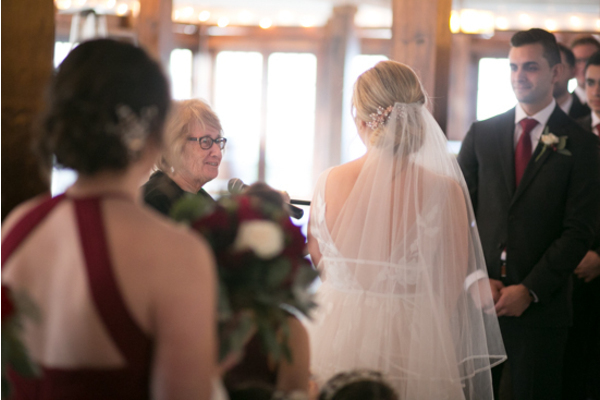 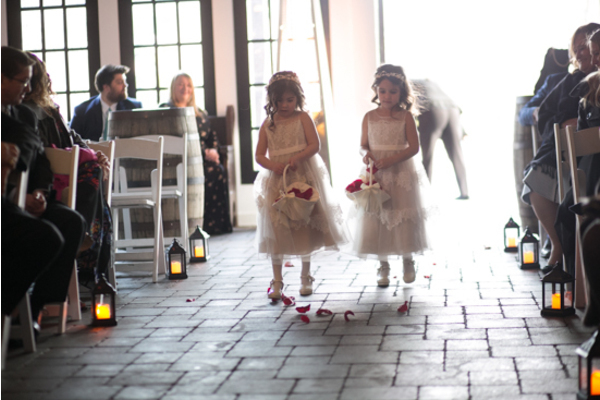 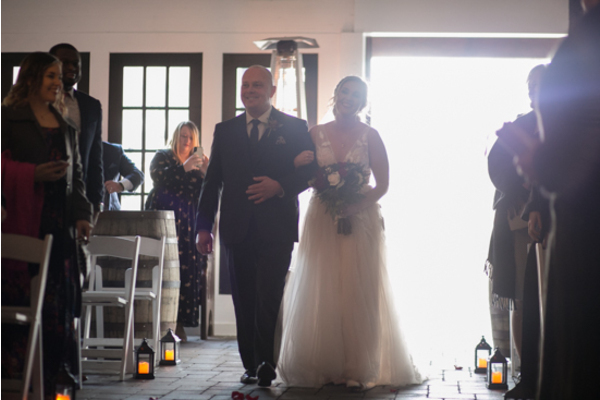 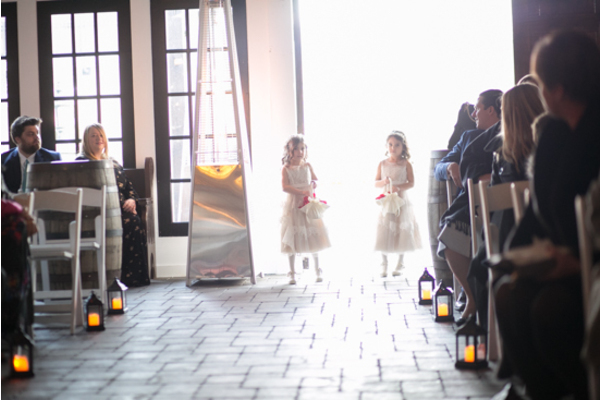 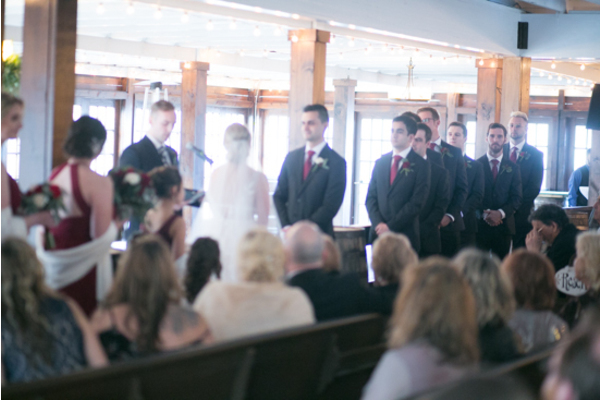 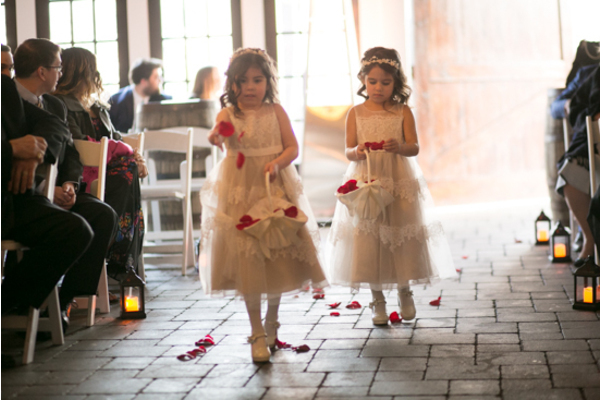 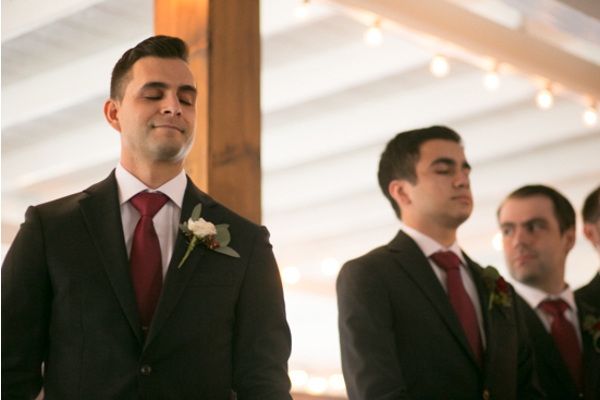 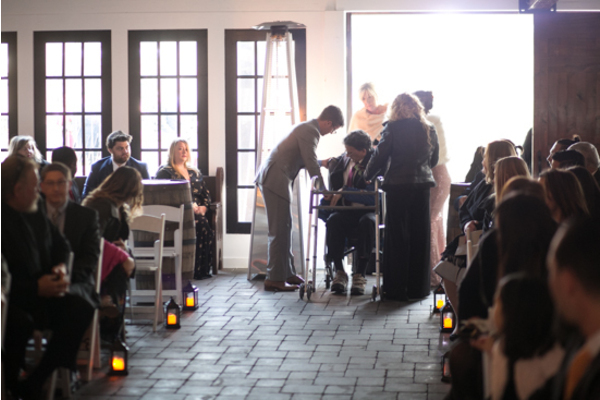 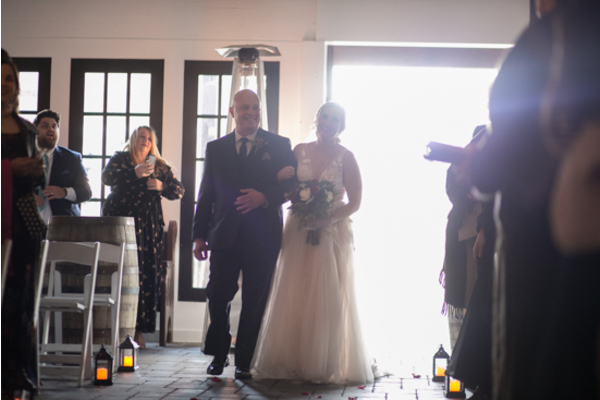 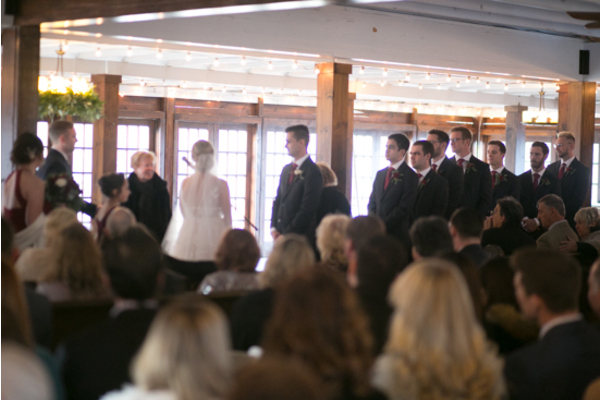 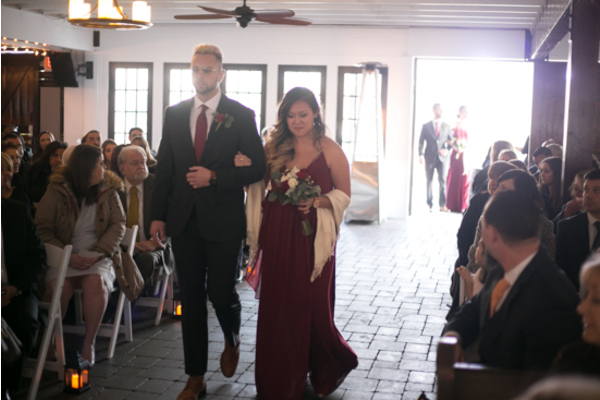 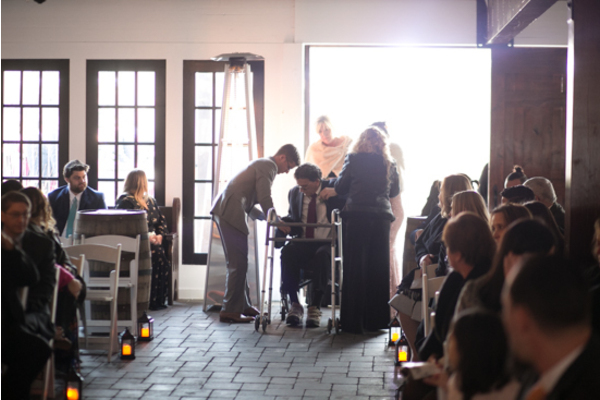 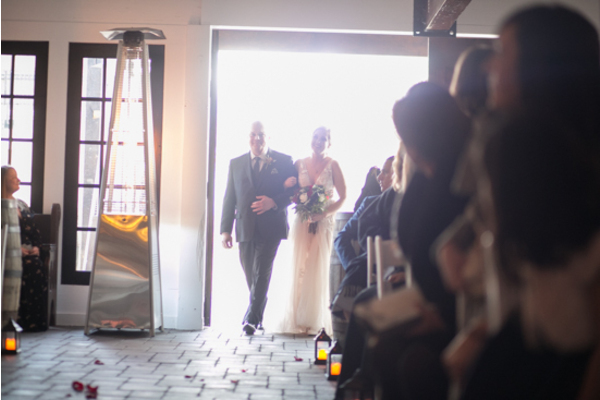 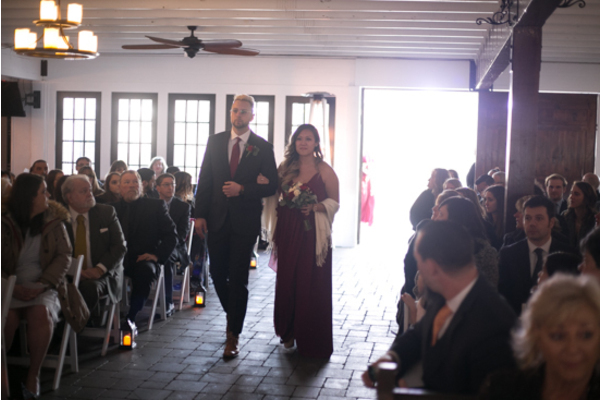 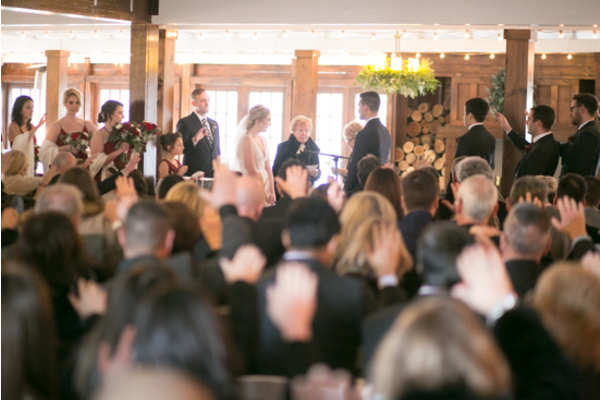 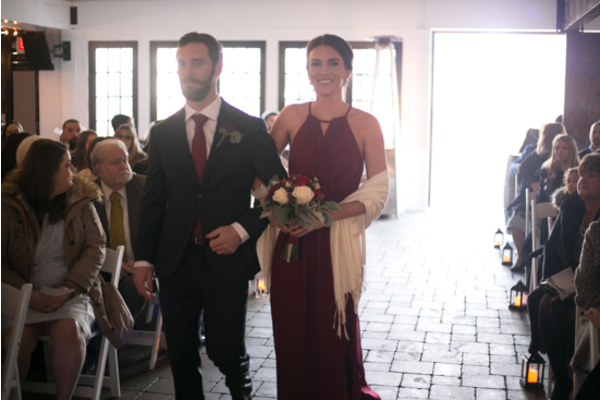 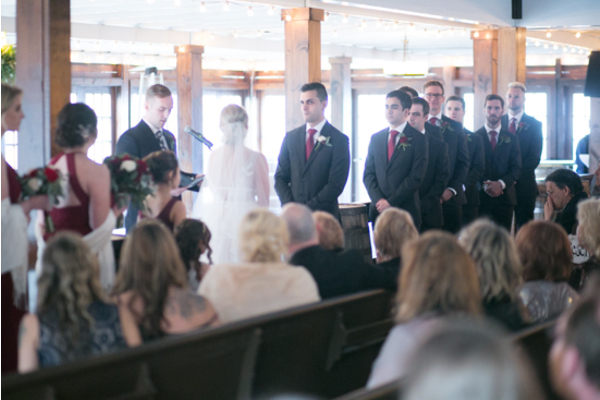 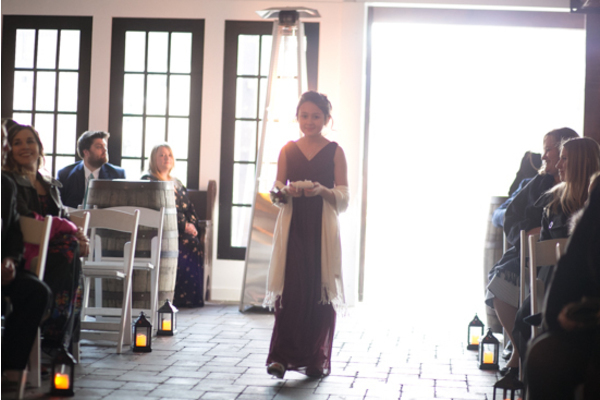 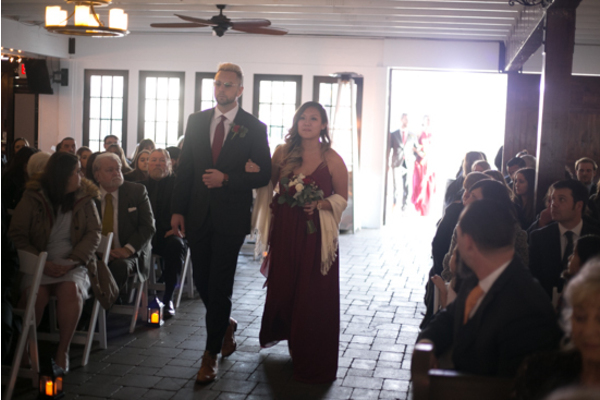 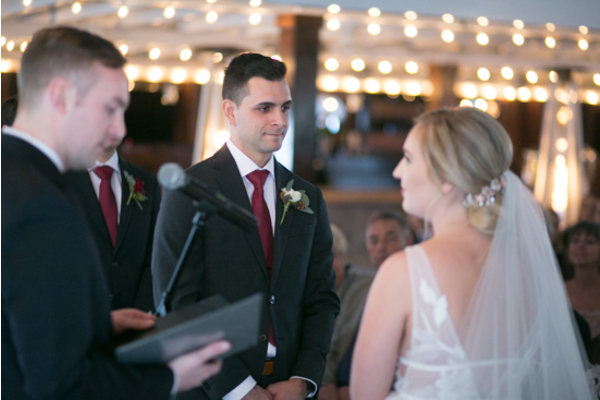 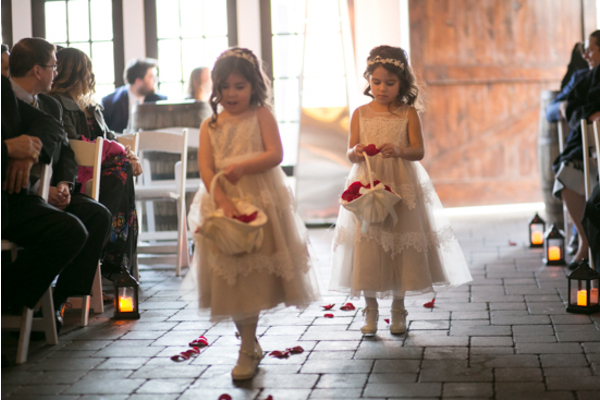 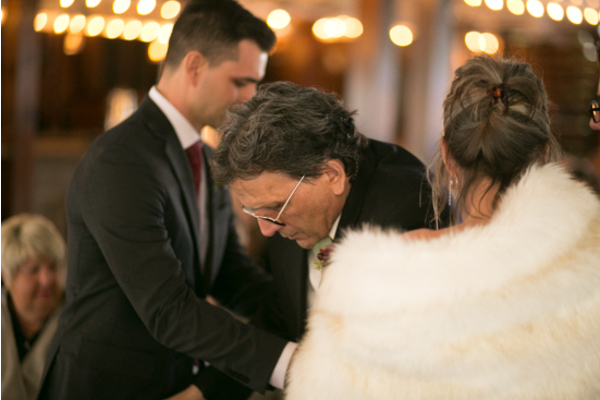 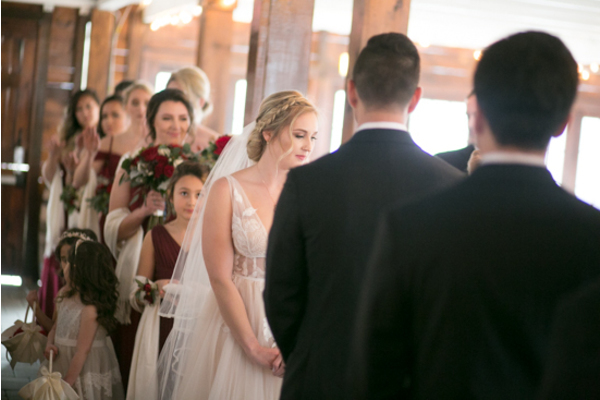 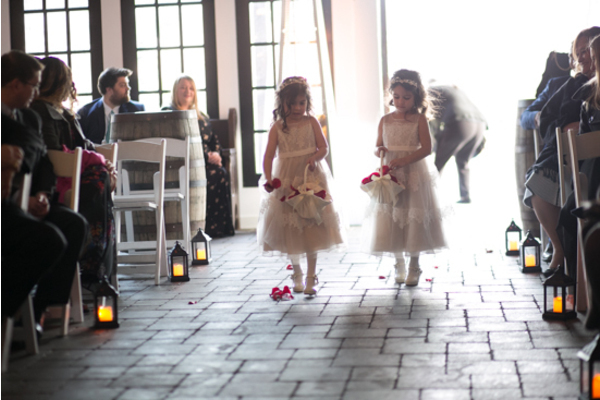 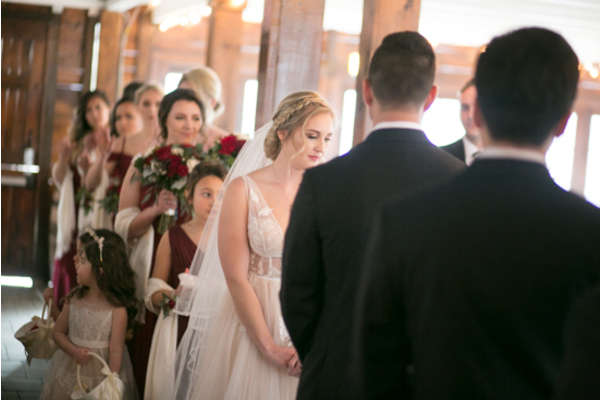 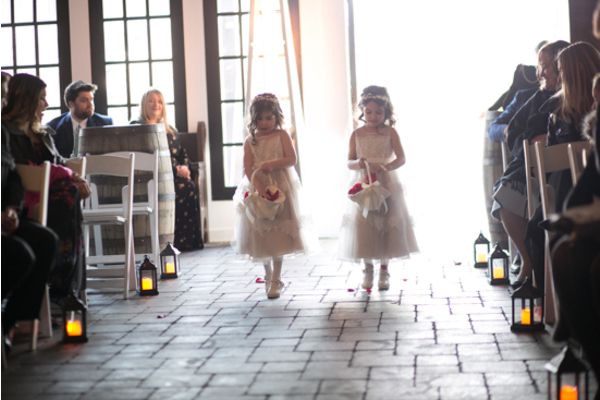 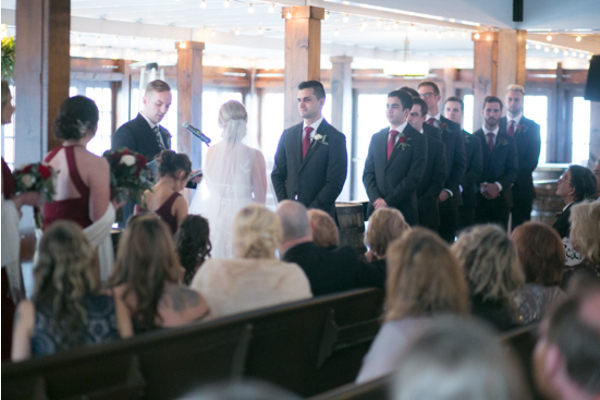 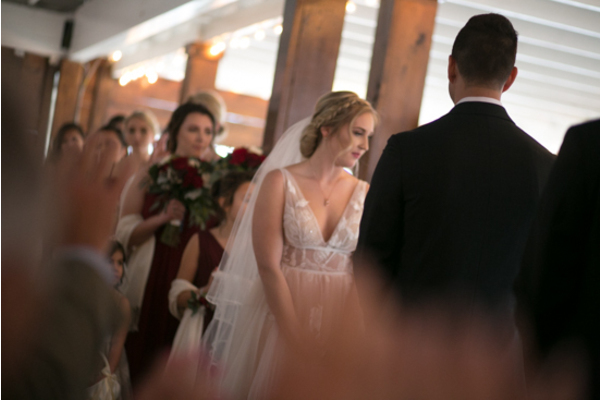 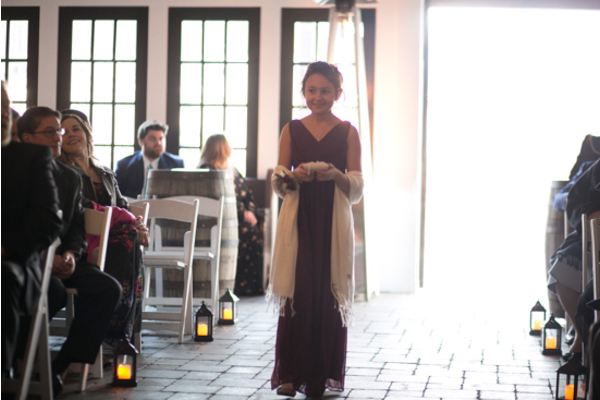 Next, the rustic ceremony took place indoors with gorgeous lanterns and rose petals to line the aisle! 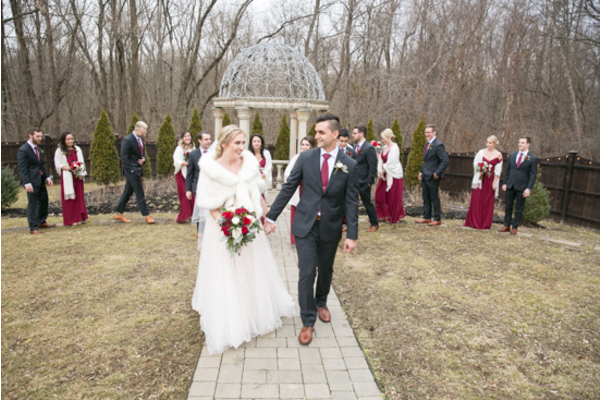 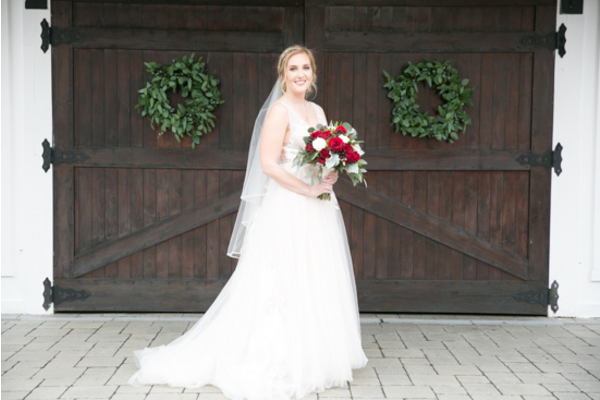 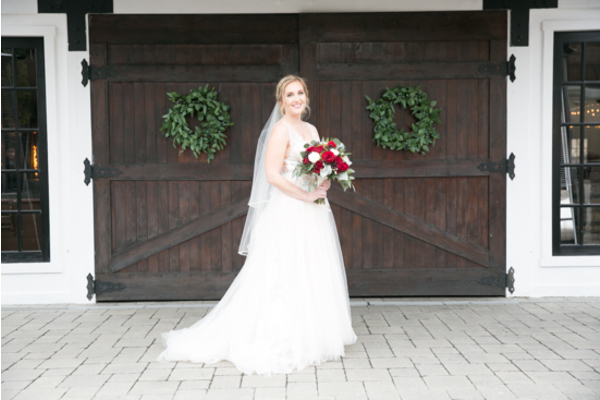 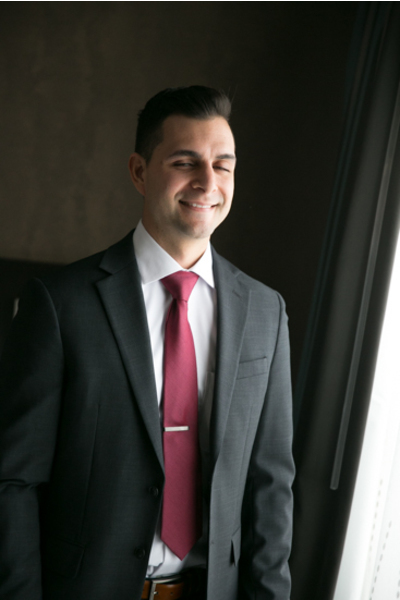 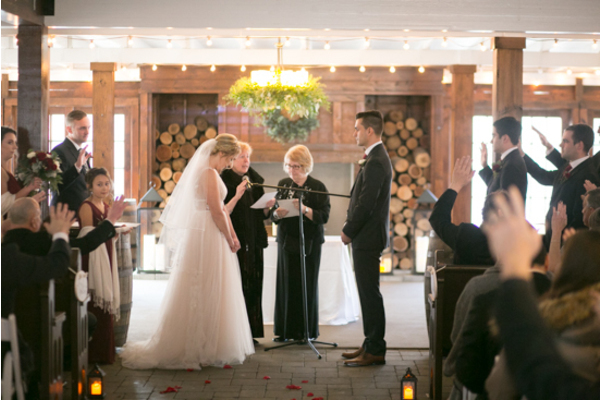 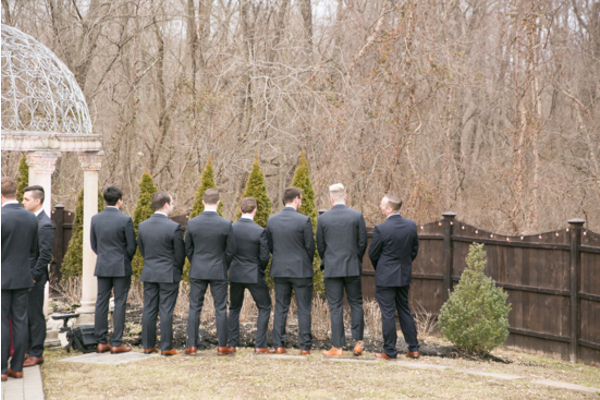 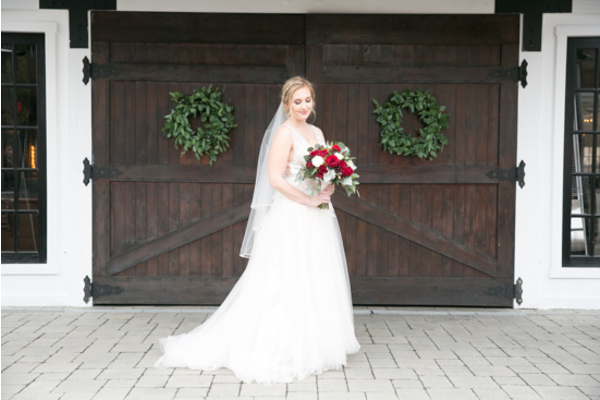 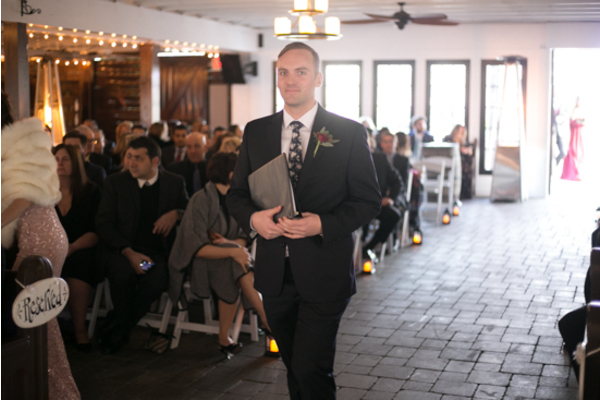 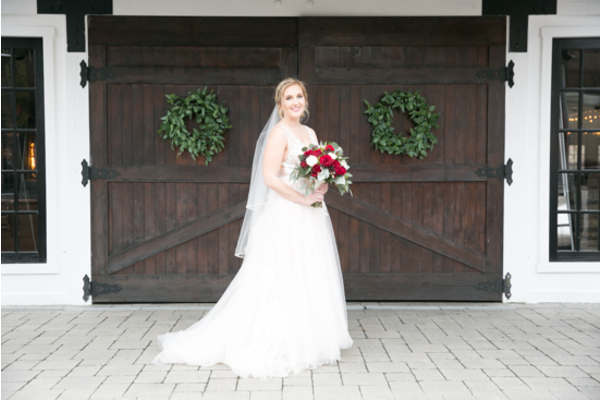 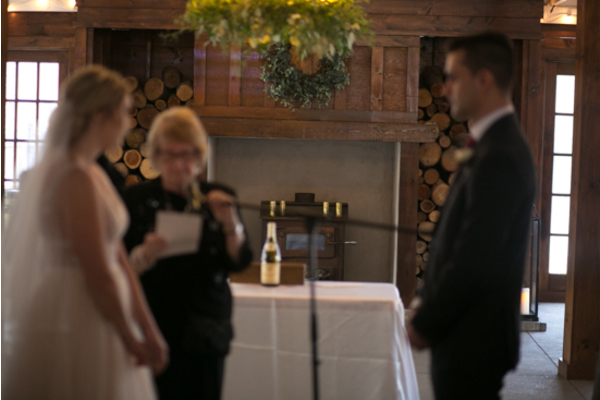 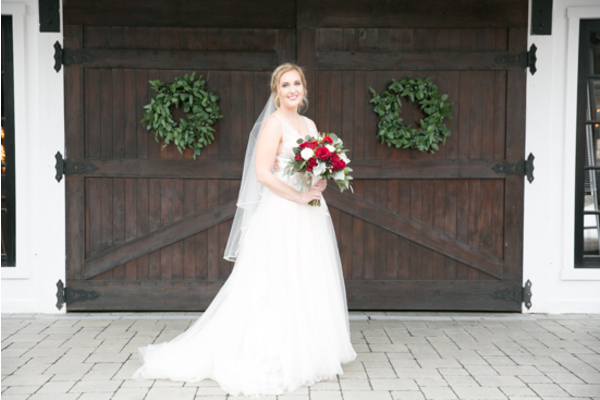 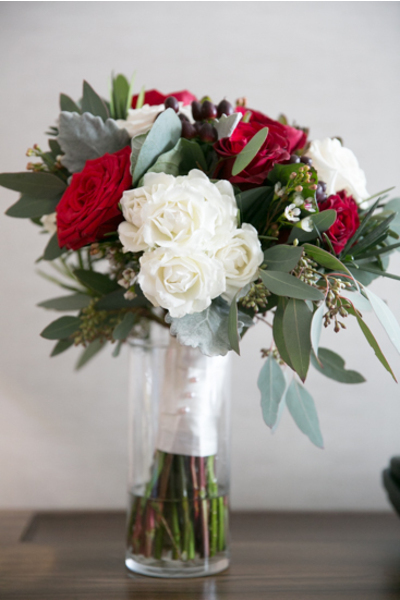 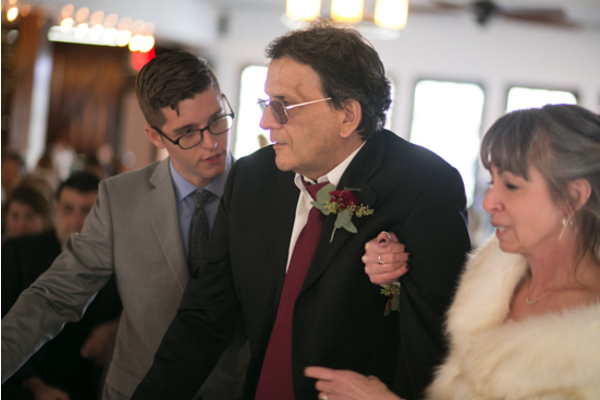 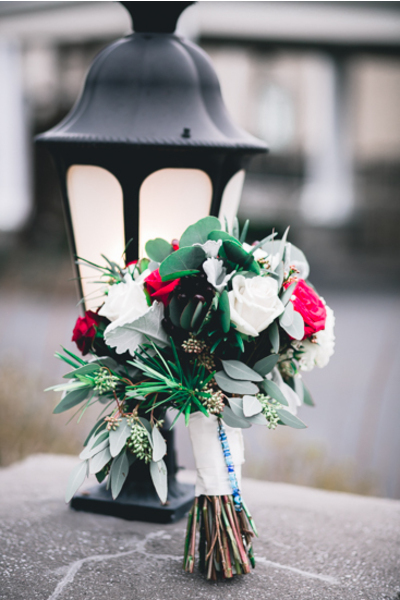 The simple decor was just the right backdrop for this winter wedding. 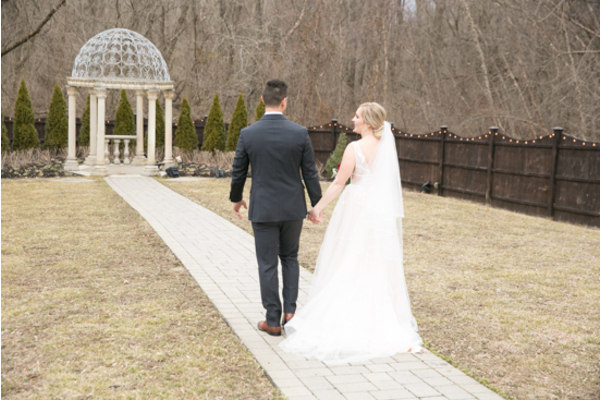 After Lexi and Nick were officially married, they were off to the gazebo outside for a portraits with our NJ Wedding Photographer! 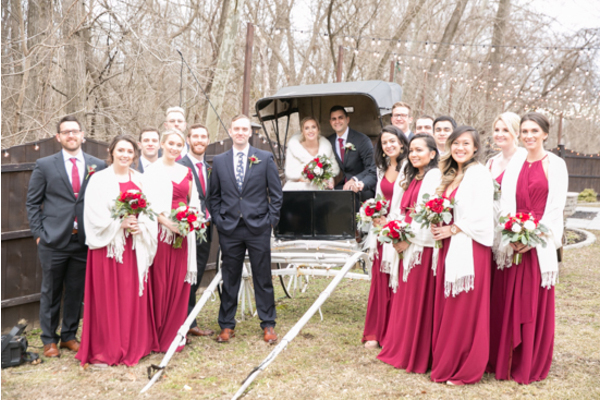 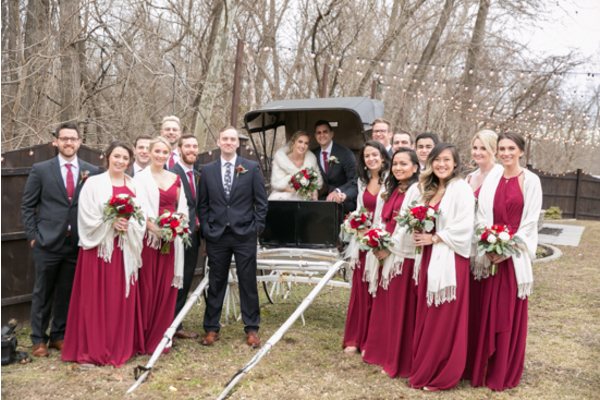 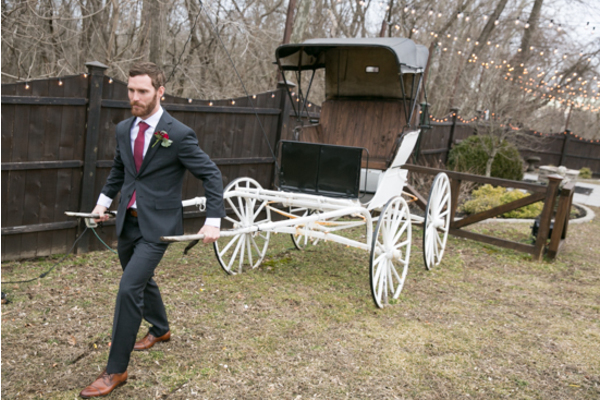 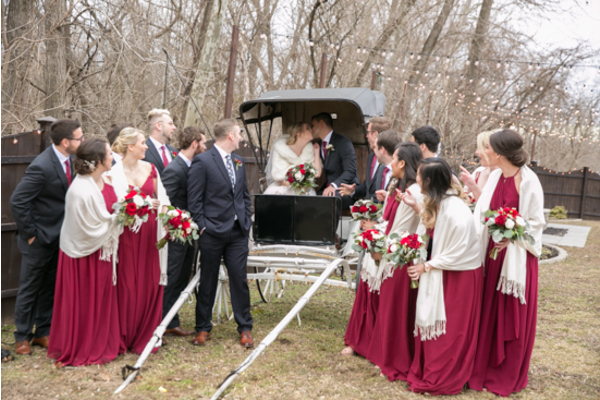 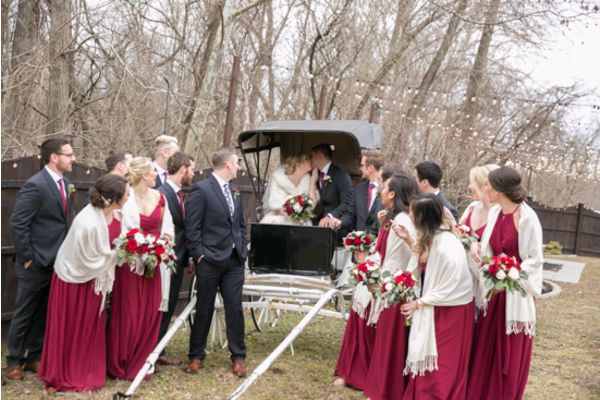 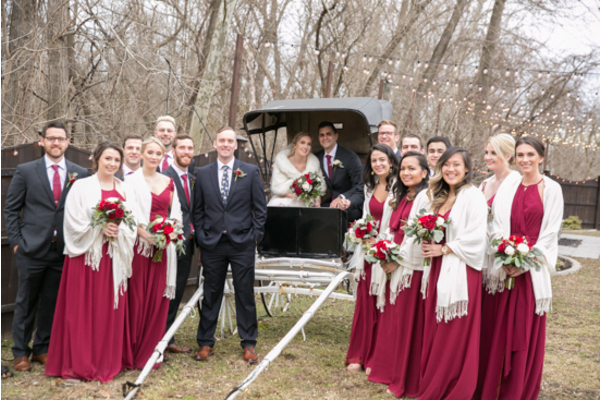 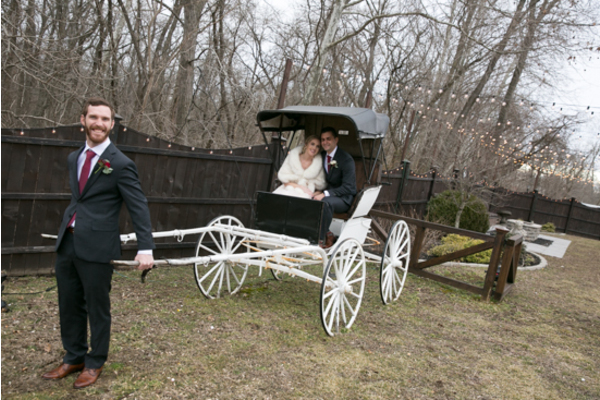 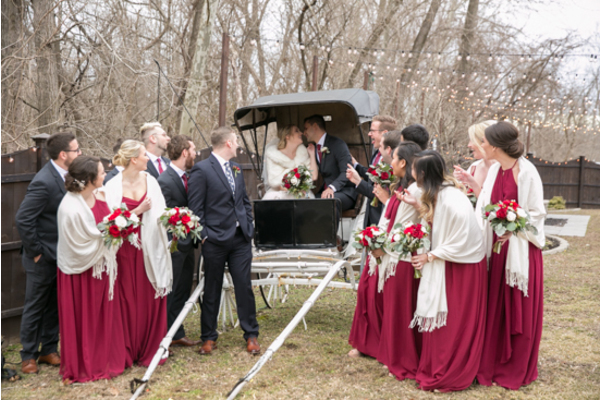 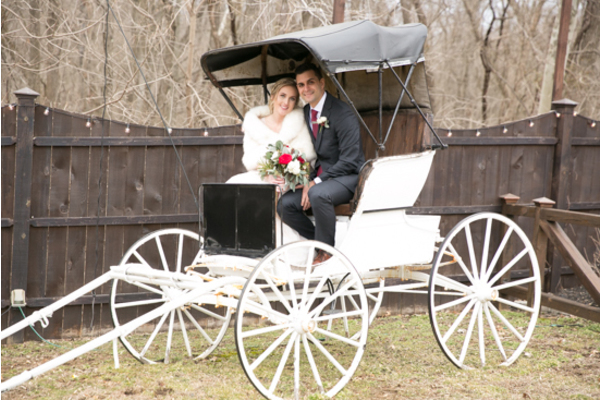 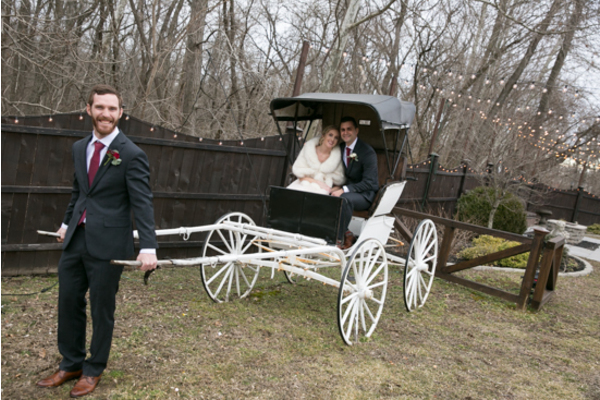 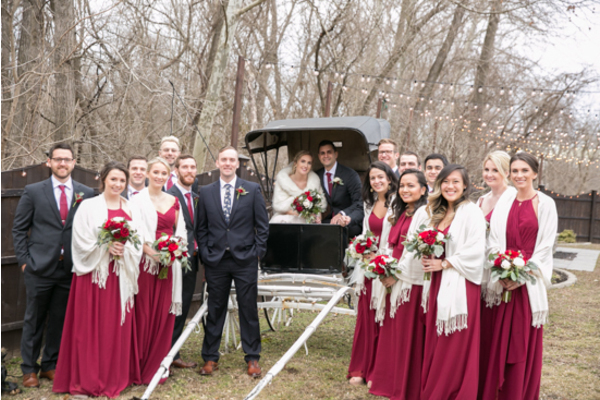 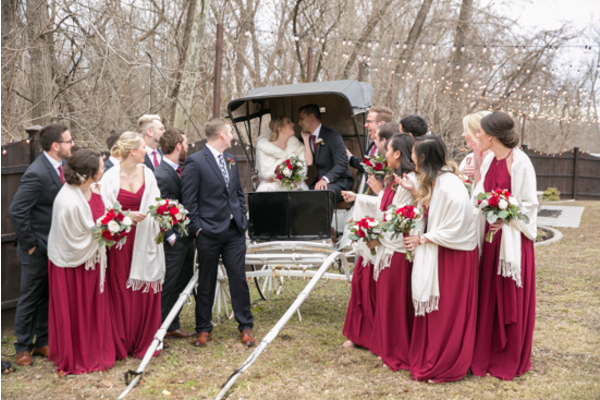 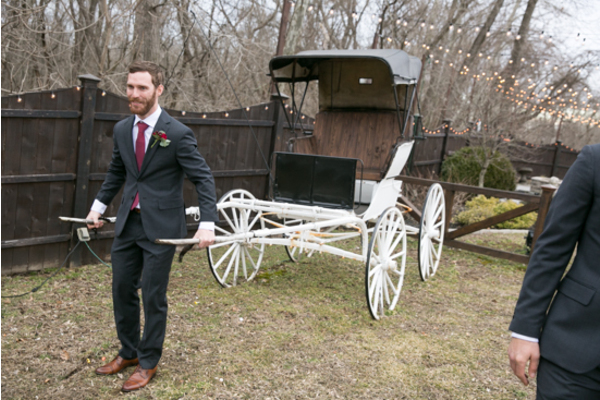 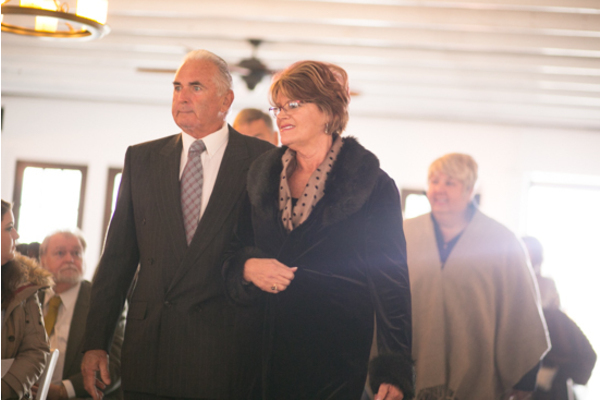 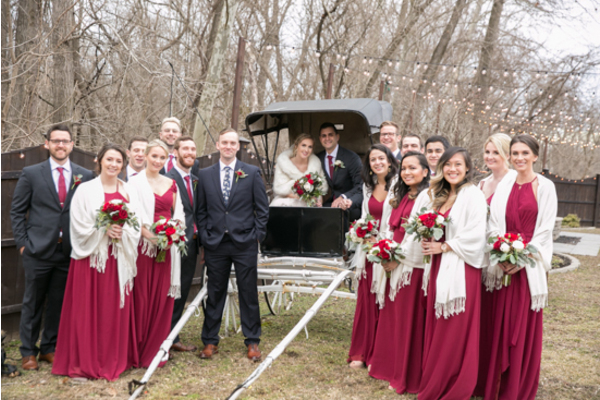 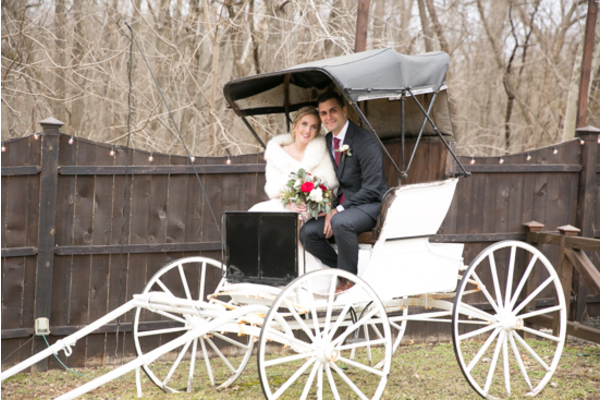 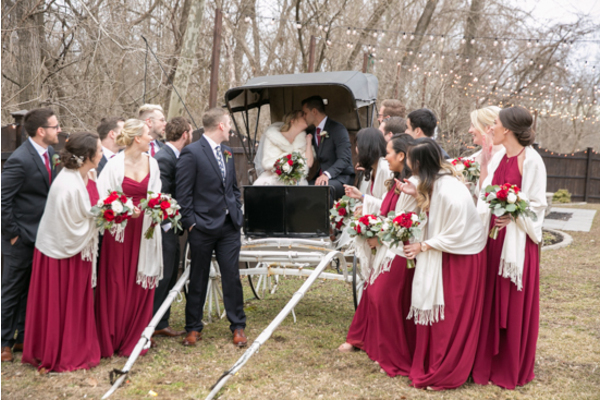 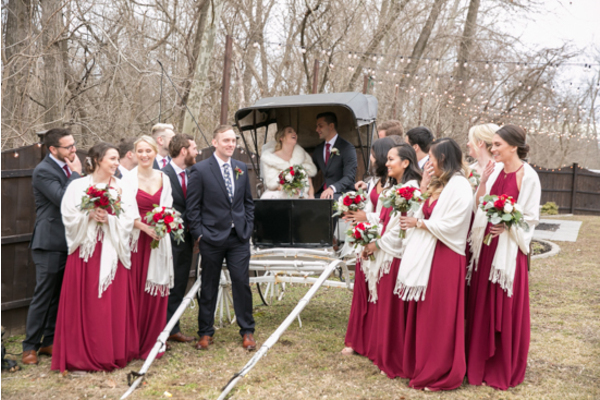 In addition, the couple made their way over to a white carriage and more picture-worthy scenes outside the venue. 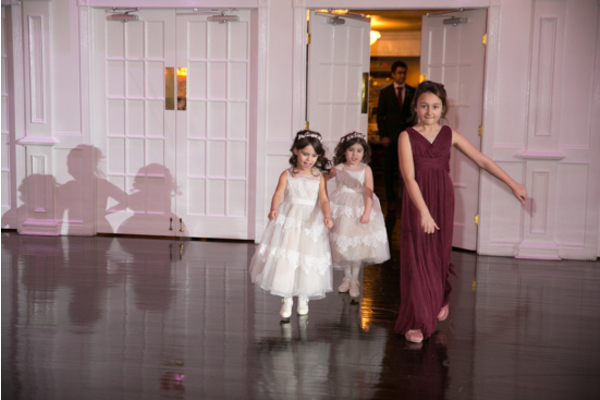 Finally, the party was about to begin! 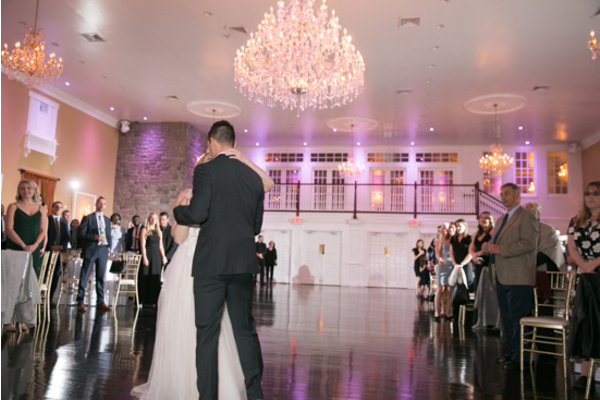 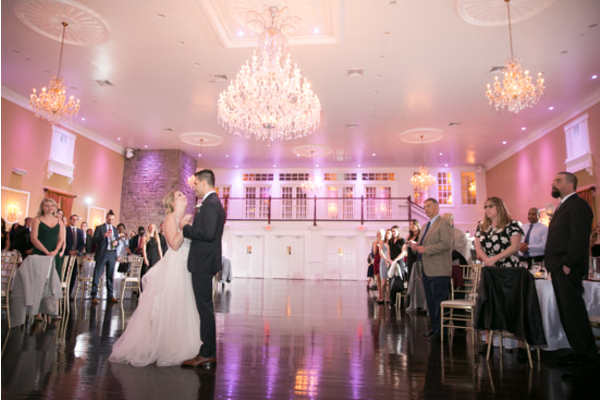 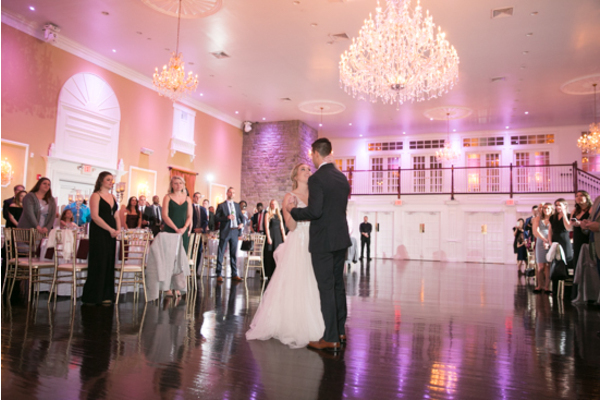 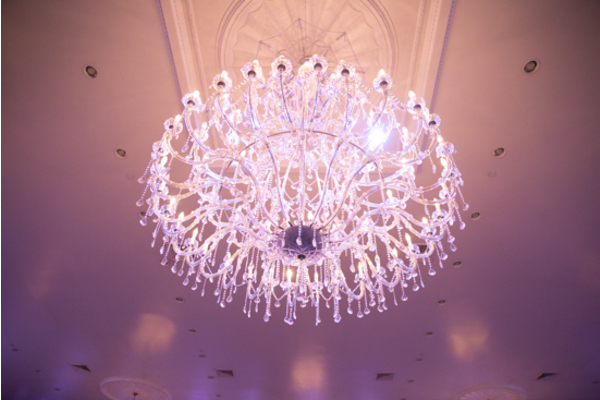 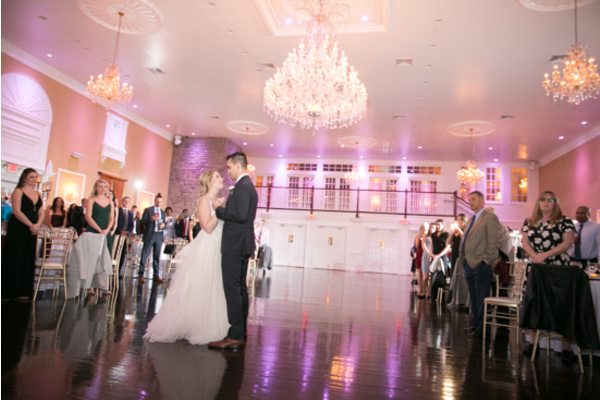 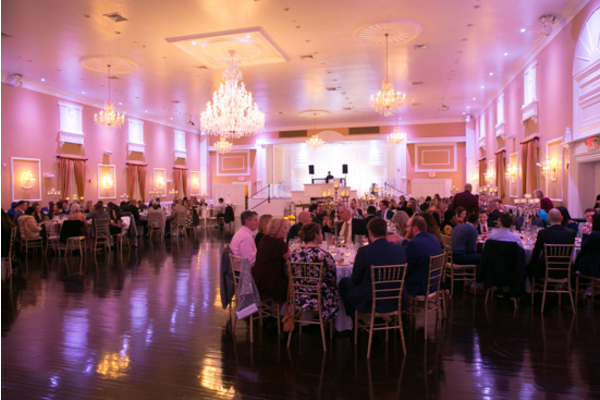 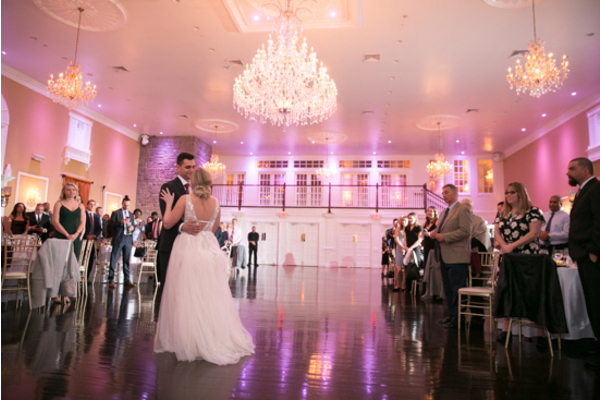 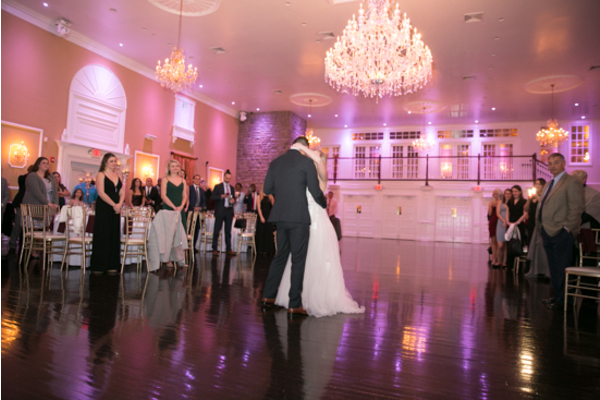 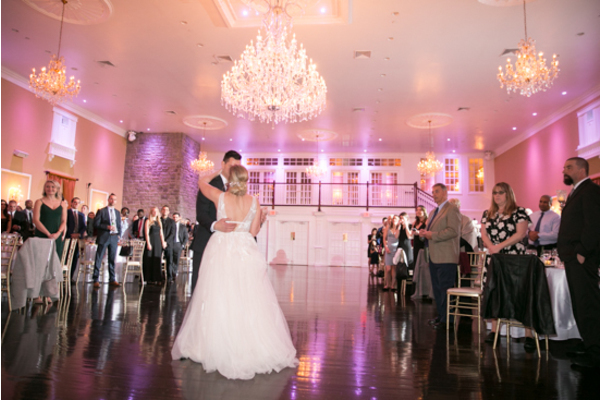 The ballroom at the Hamilton Manor looked incredible with chandeliers, ambient lighting, and touches of greenery. 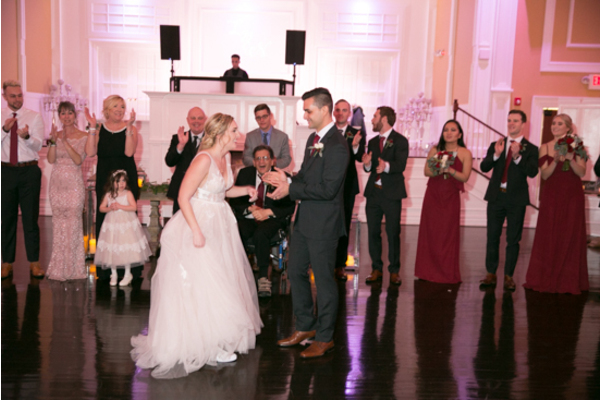 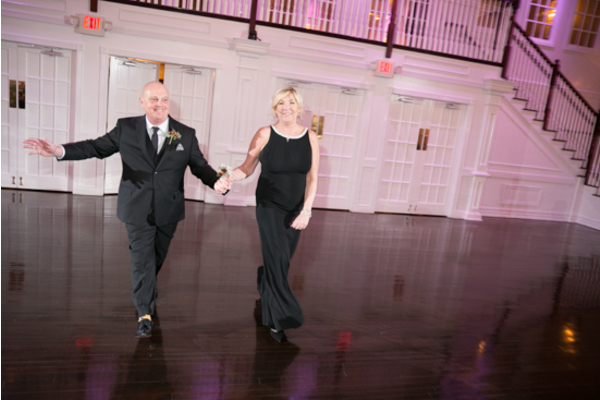 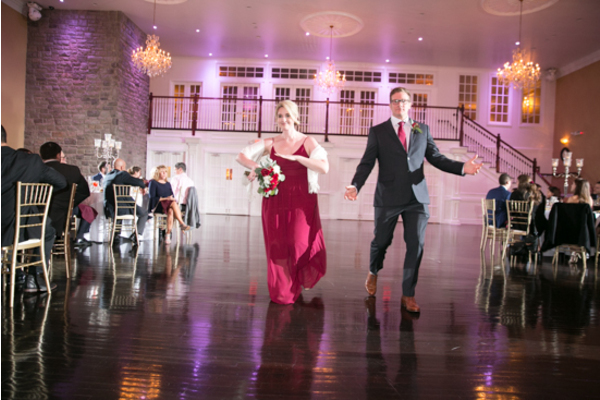 The dance floor was calling, and the happy couple kept the party going for everyone in attendance! 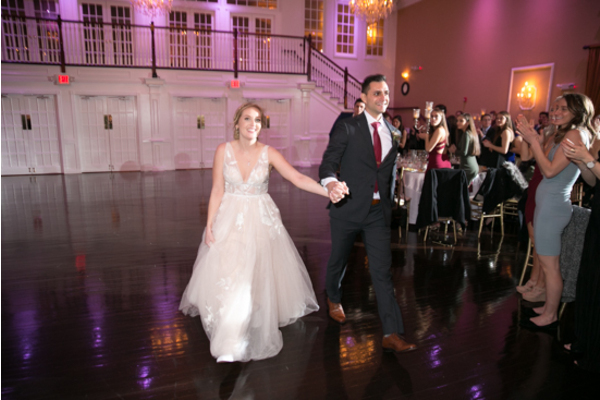 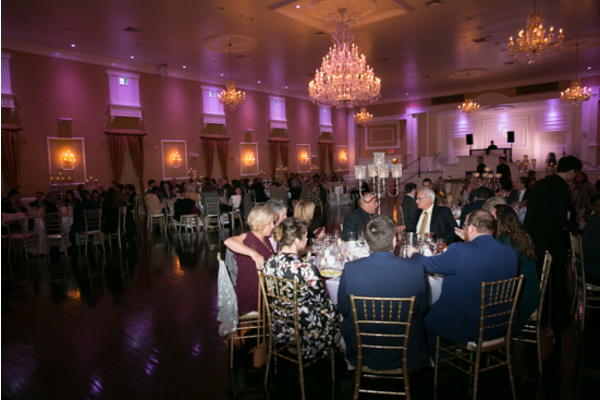 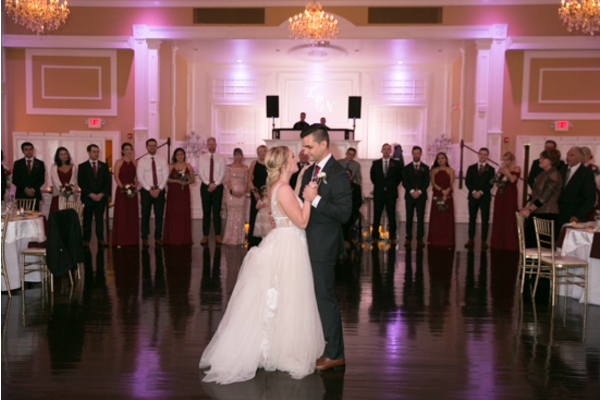 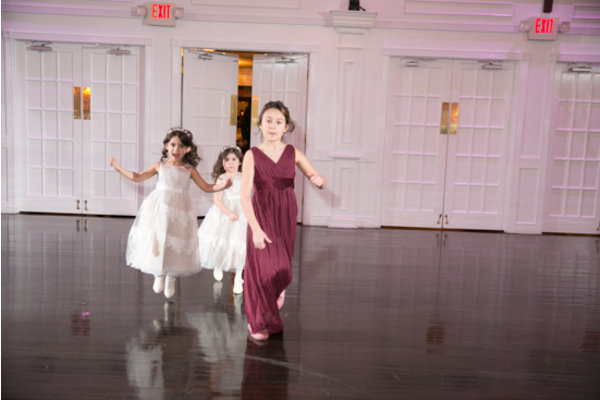 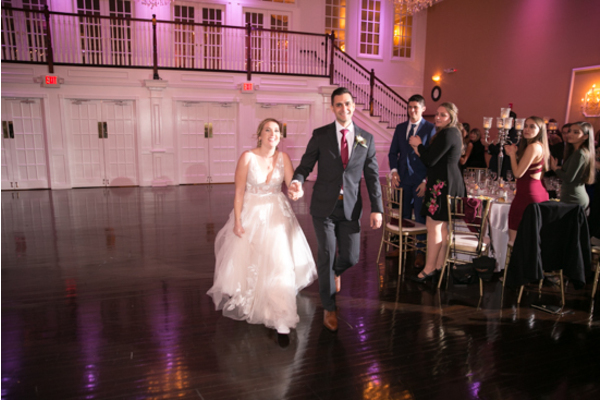 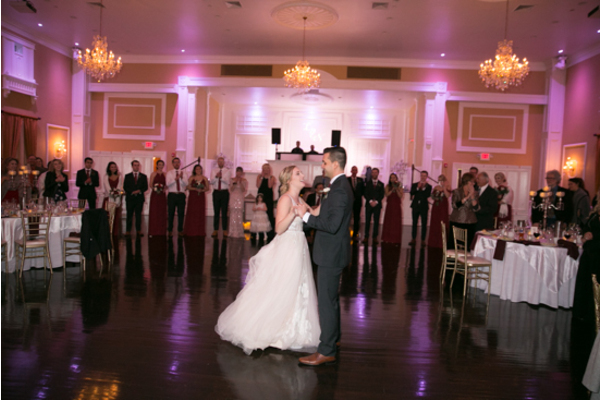 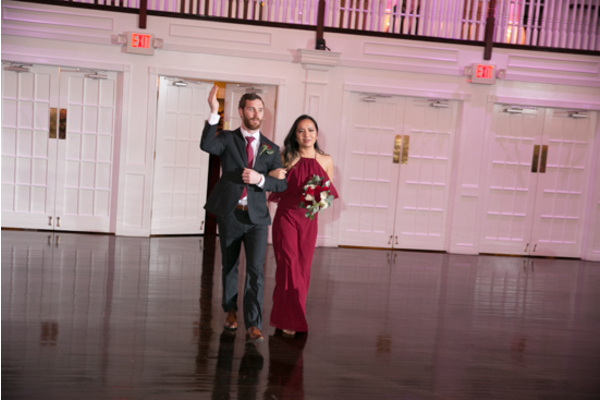 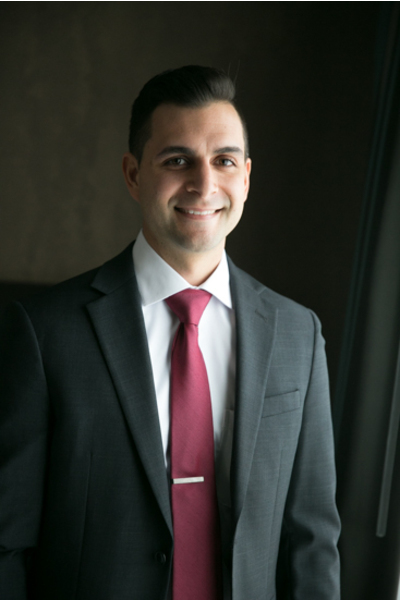 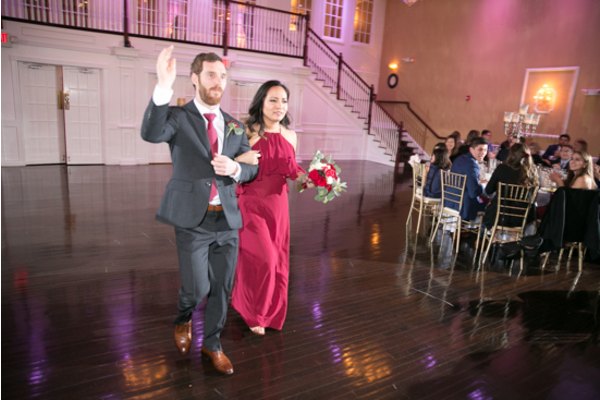 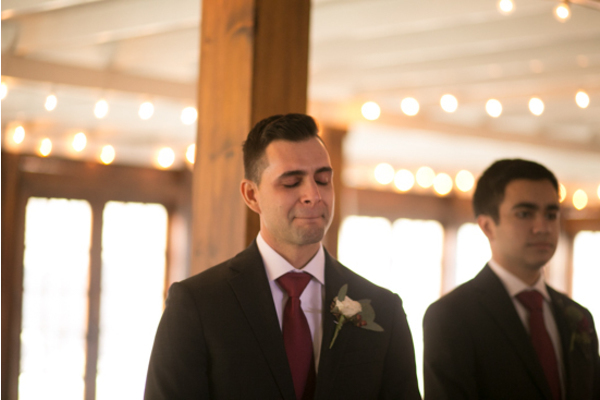 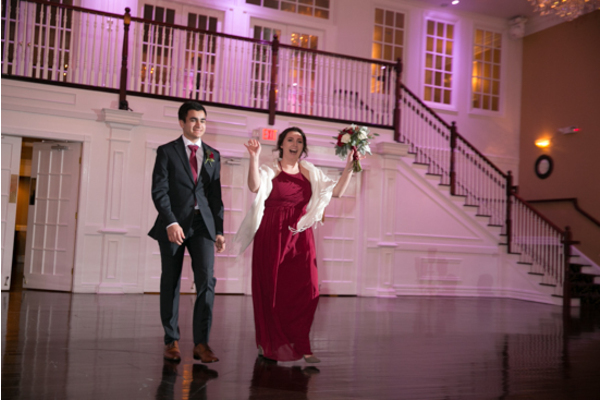 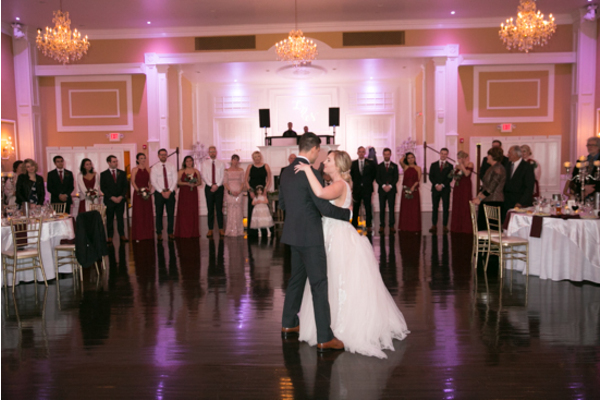 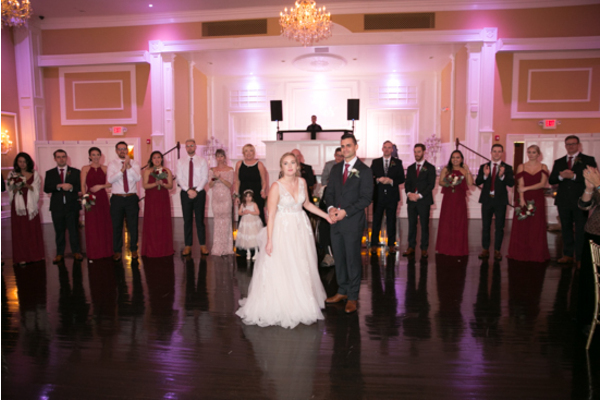 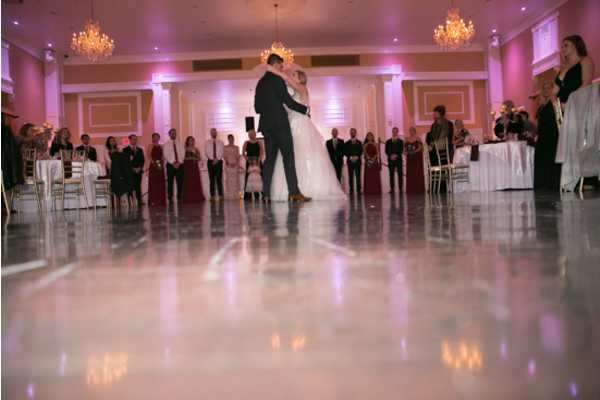 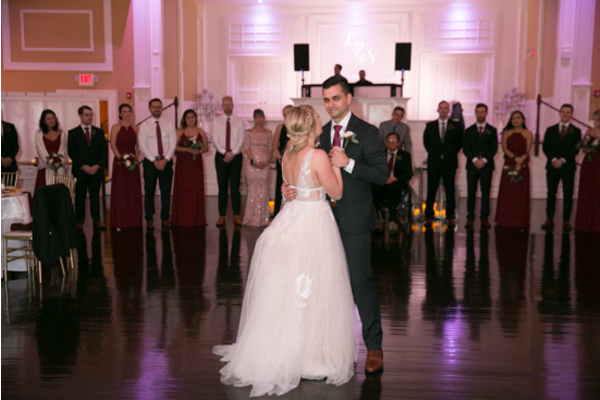 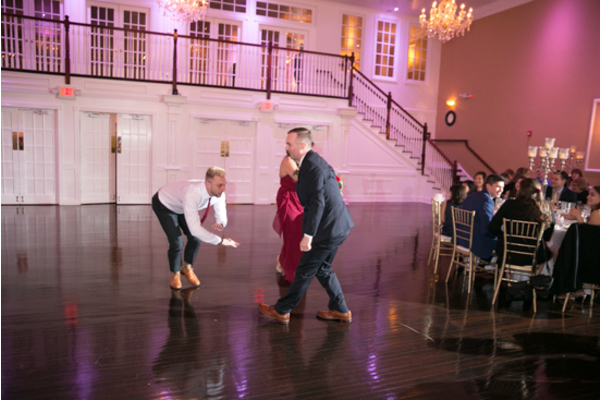 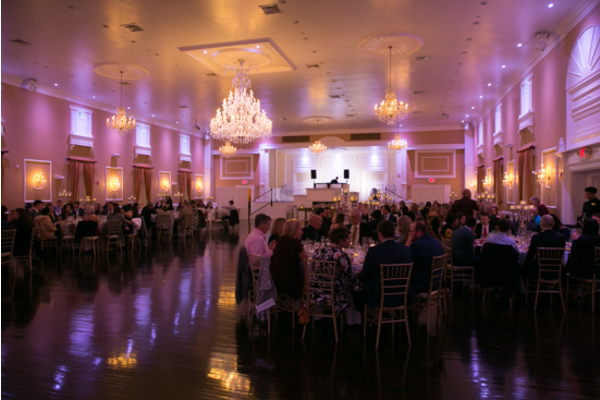 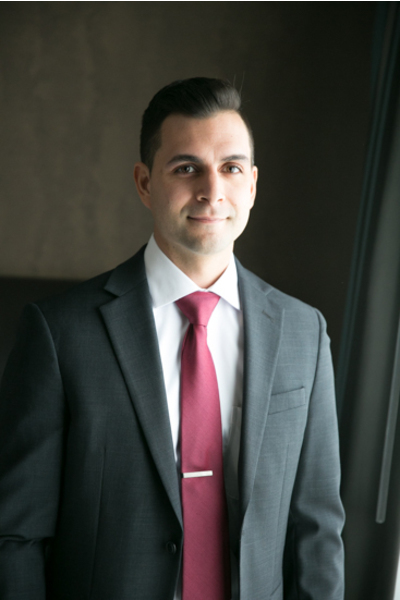 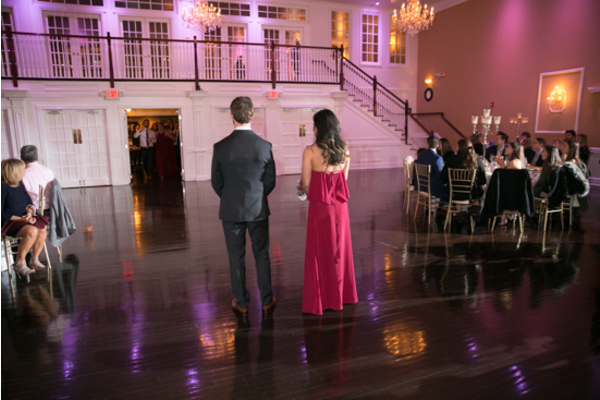 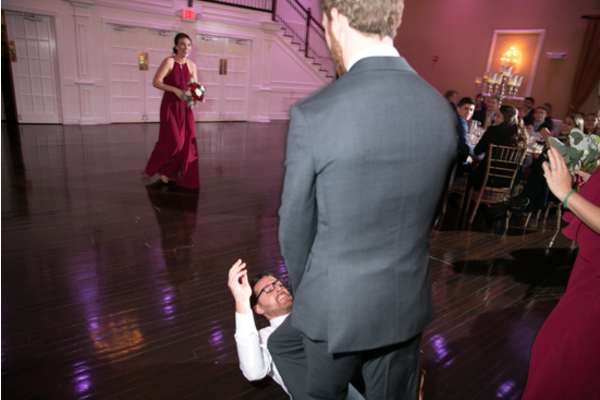 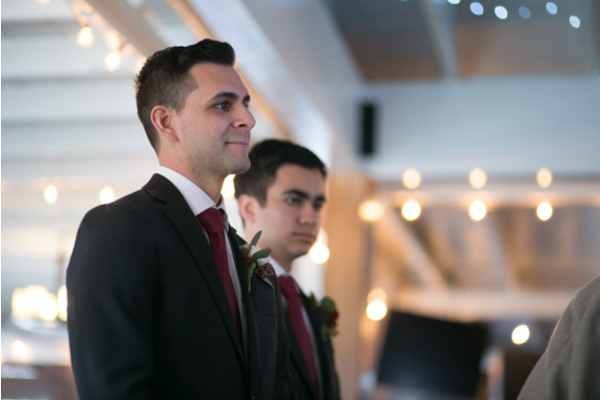 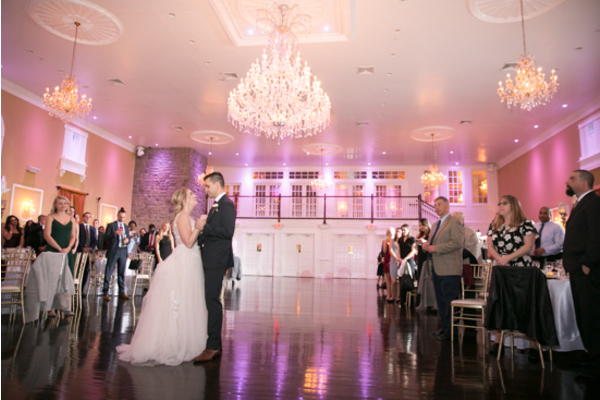 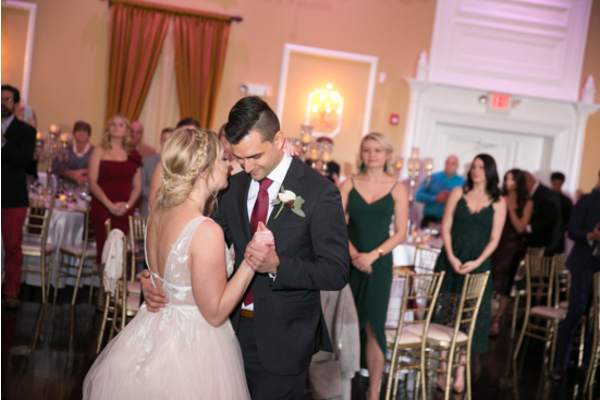 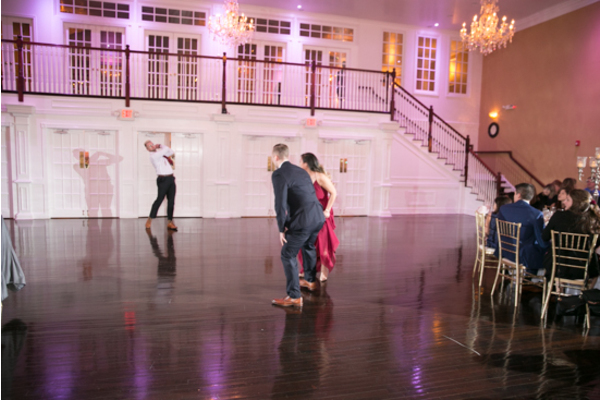 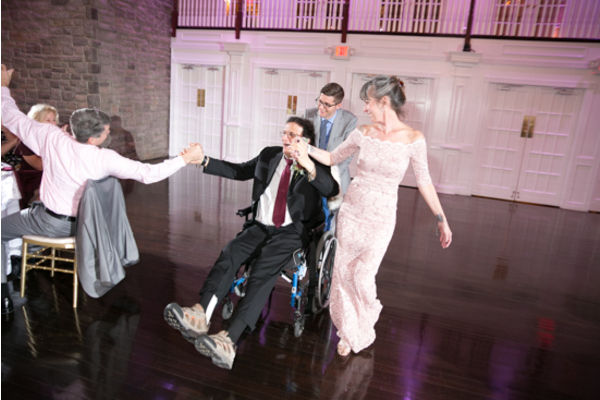 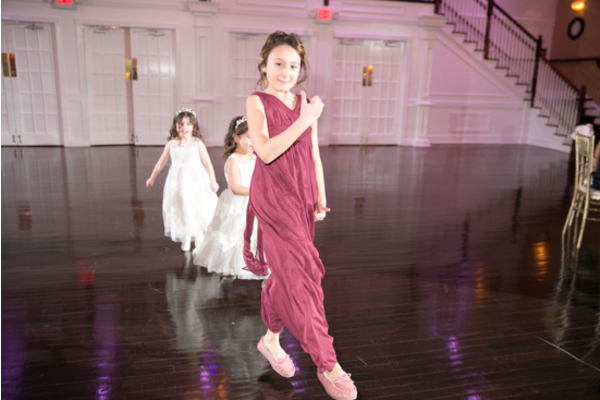 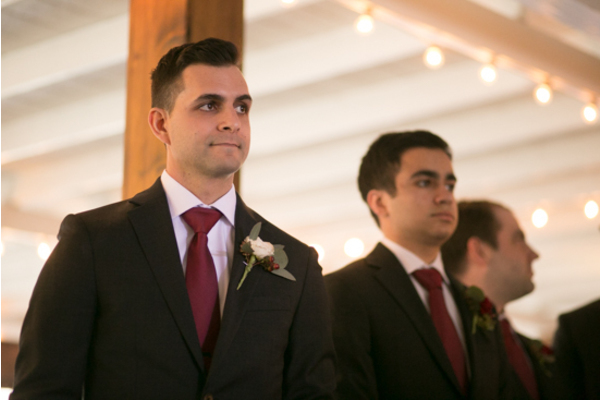 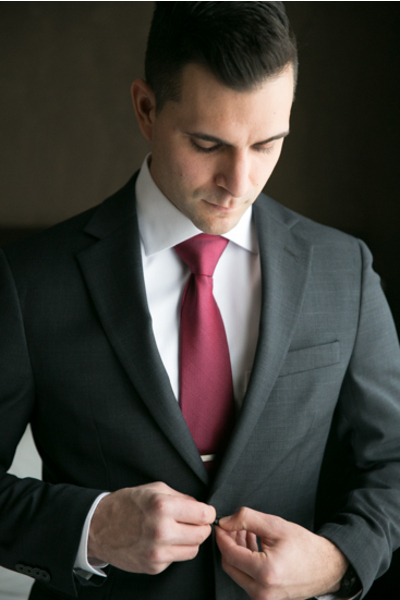 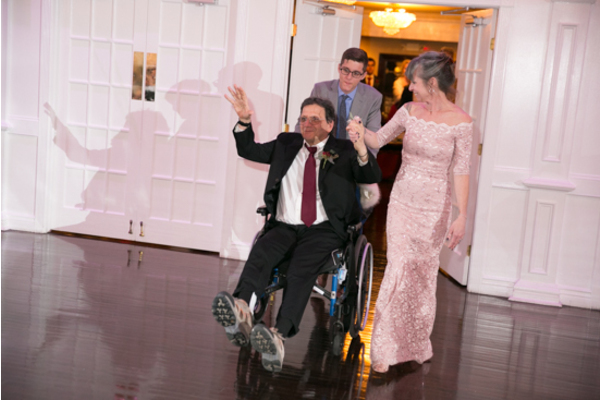 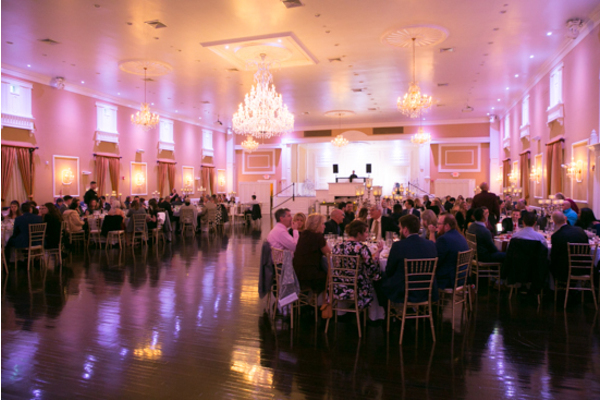 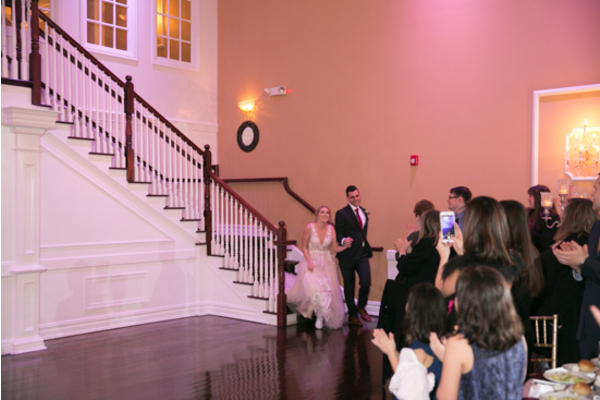 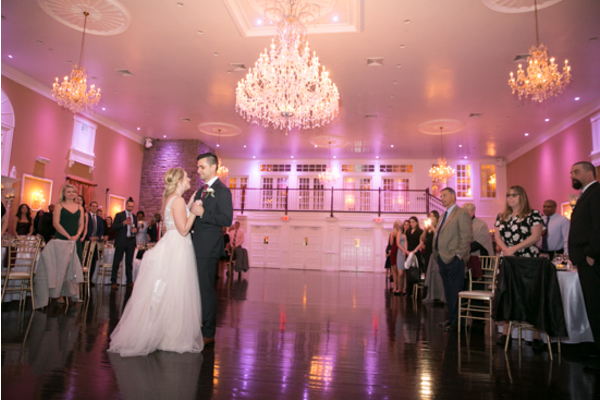 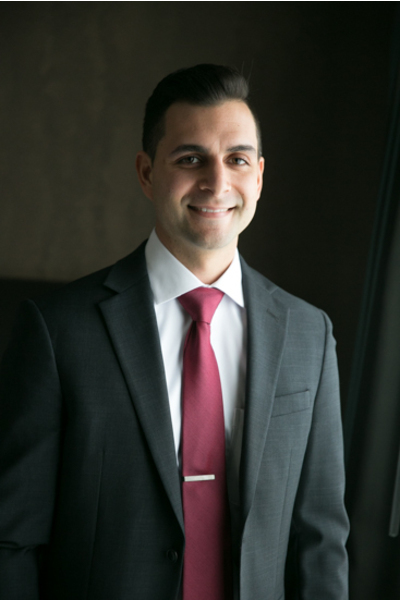 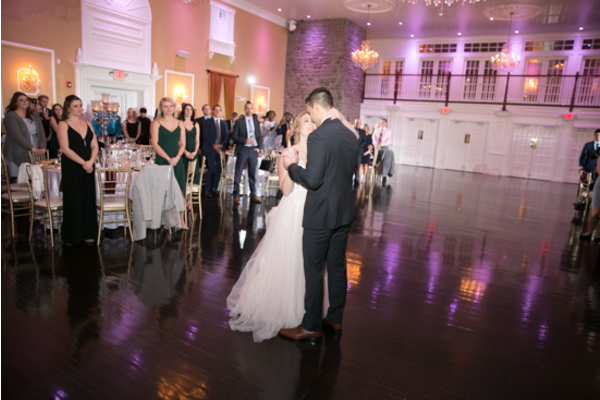 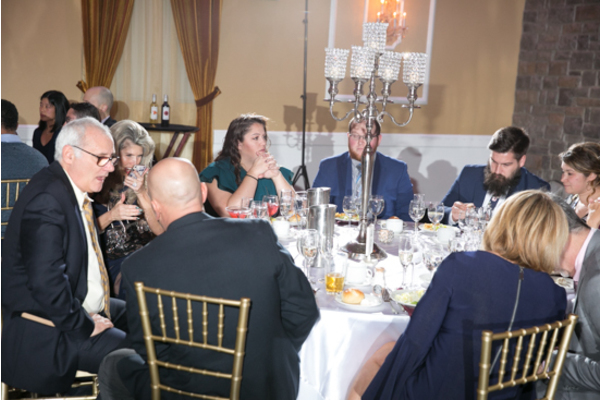 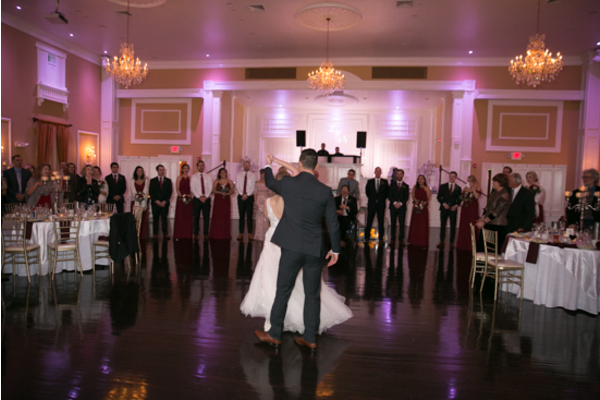 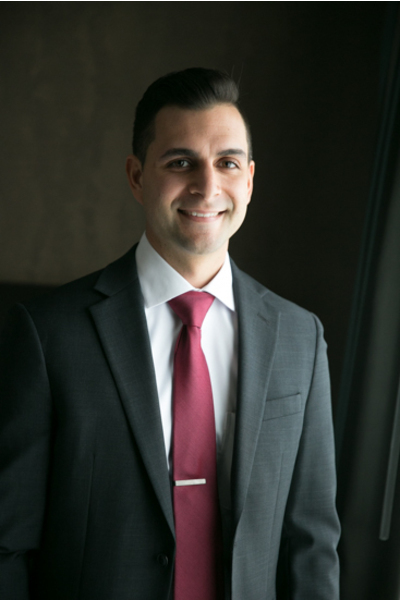 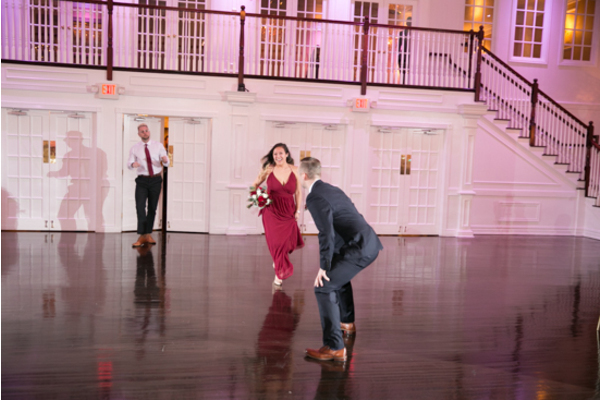 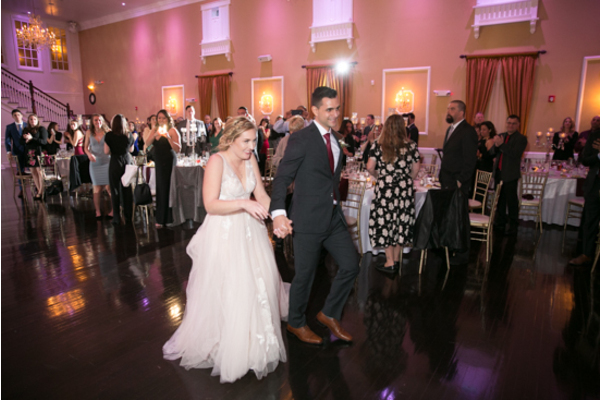 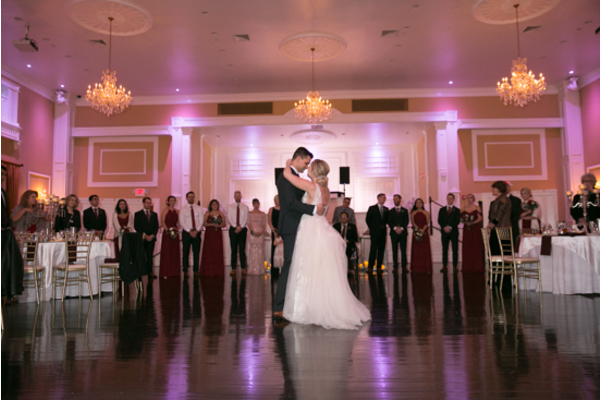 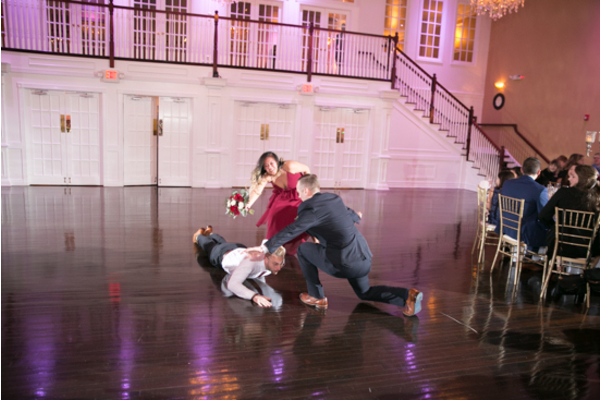 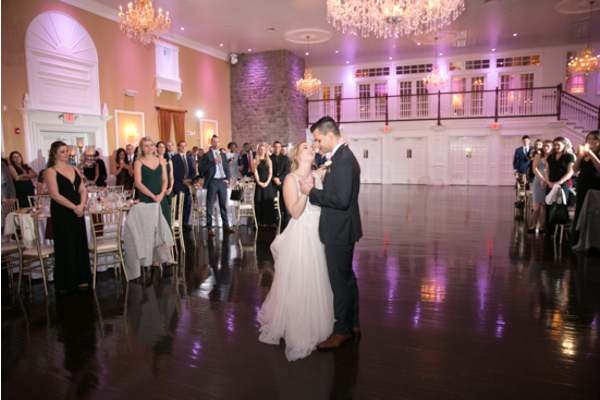 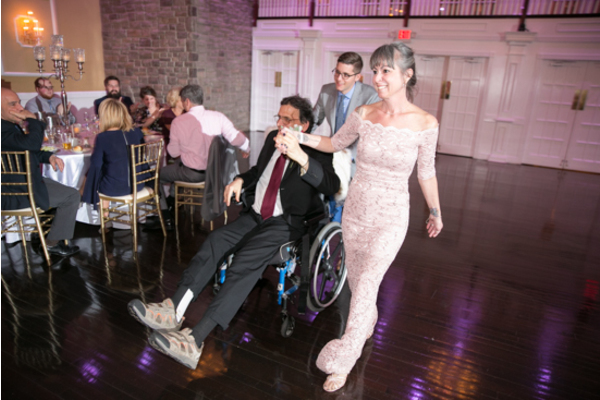 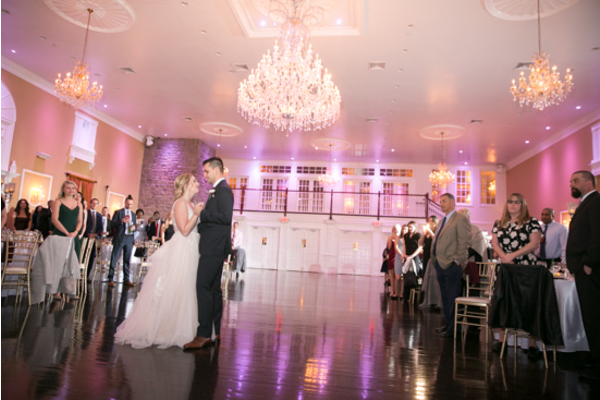 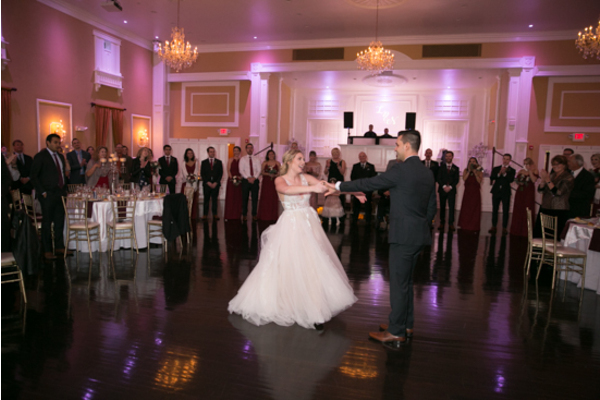 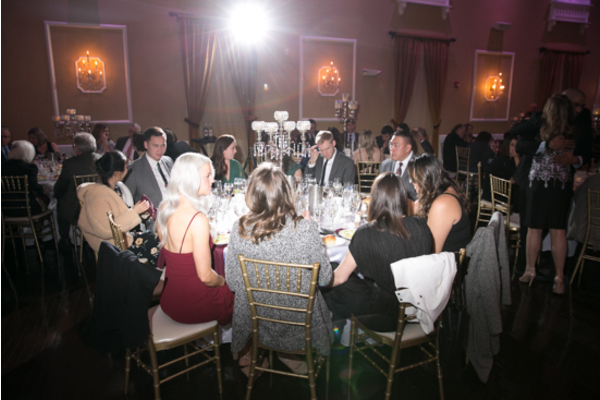 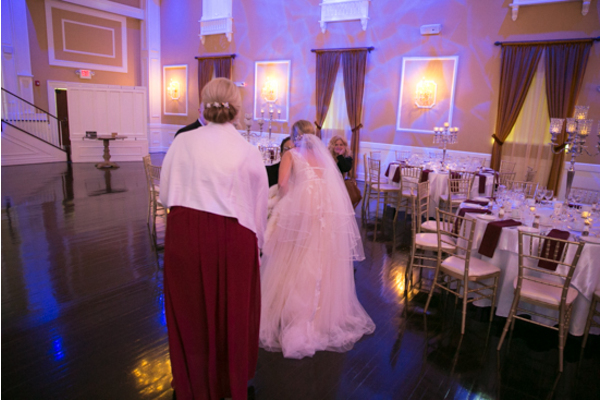 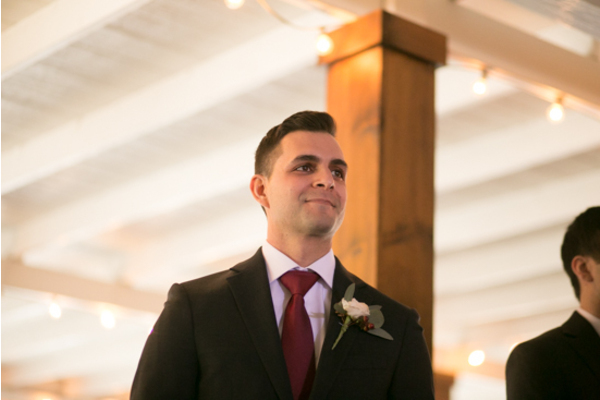 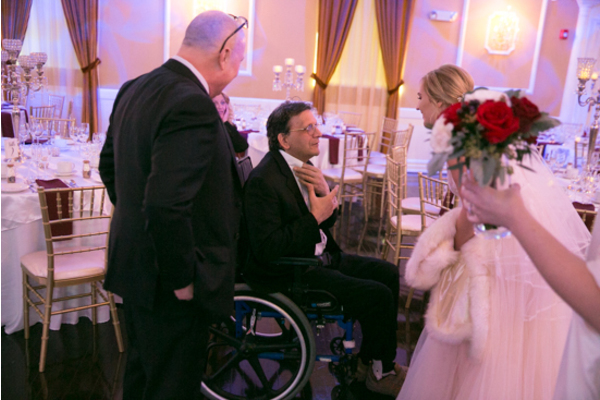 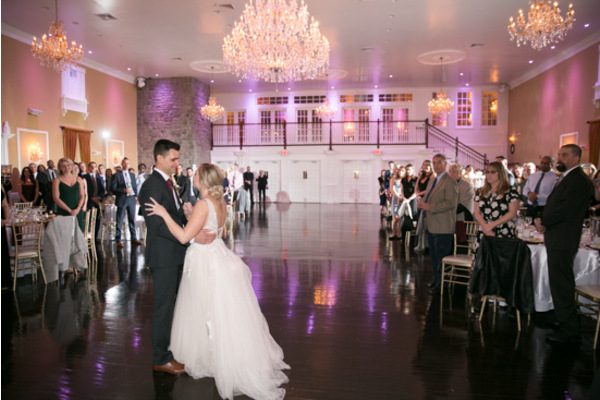 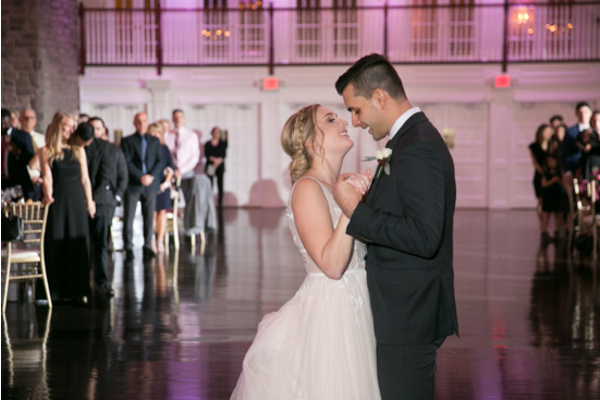 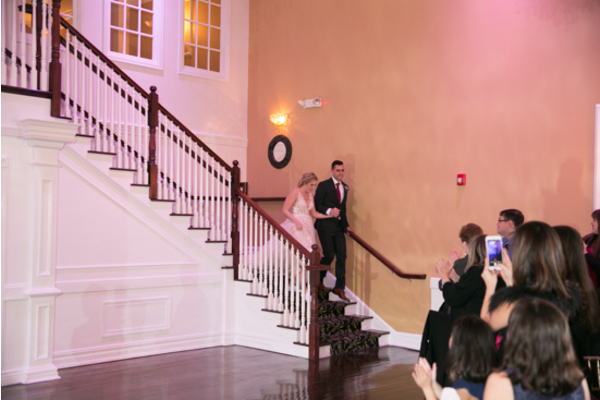 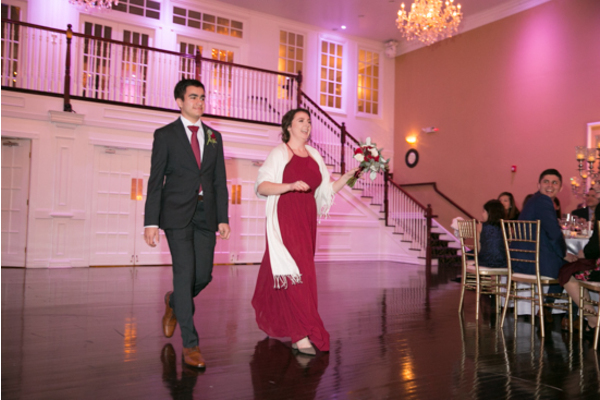 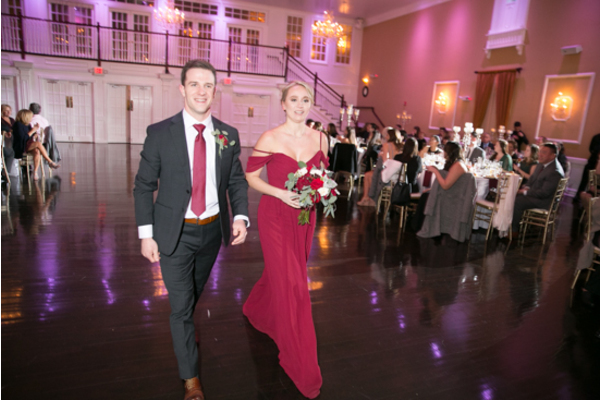 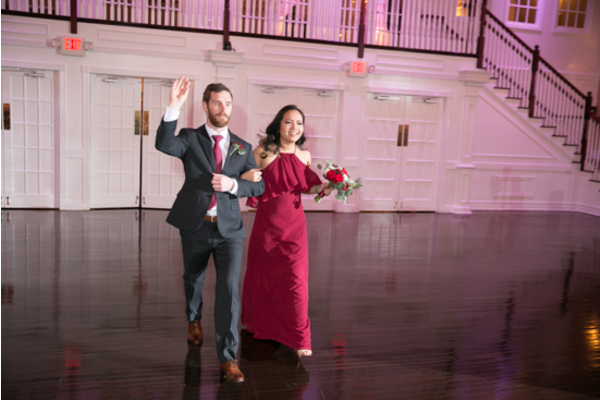 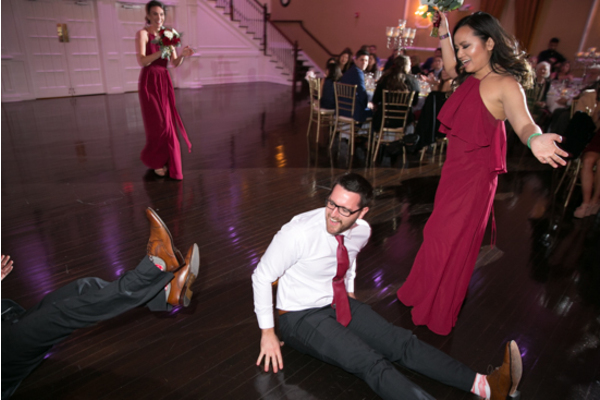 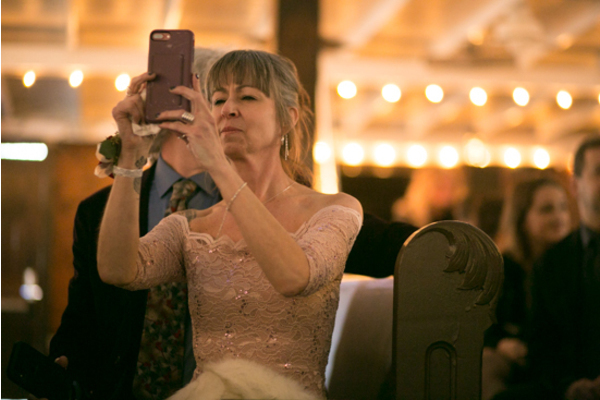 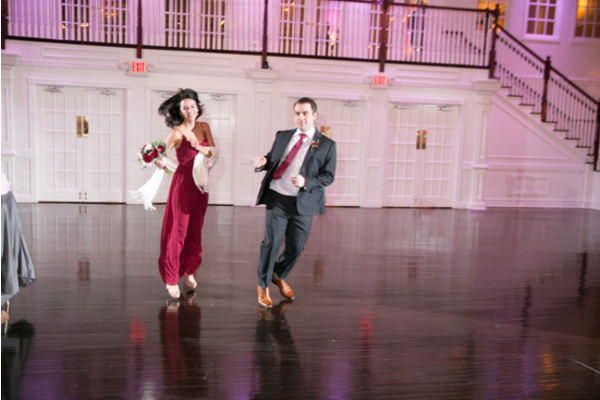 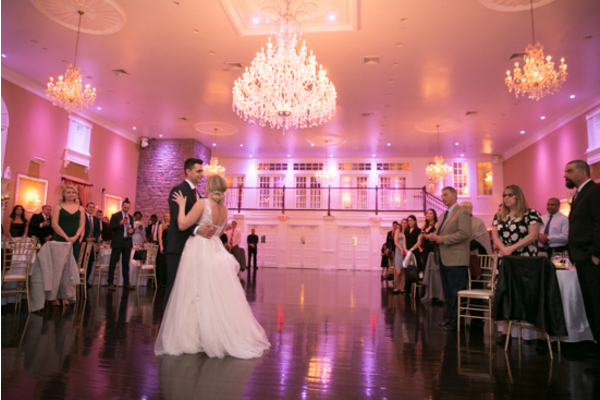 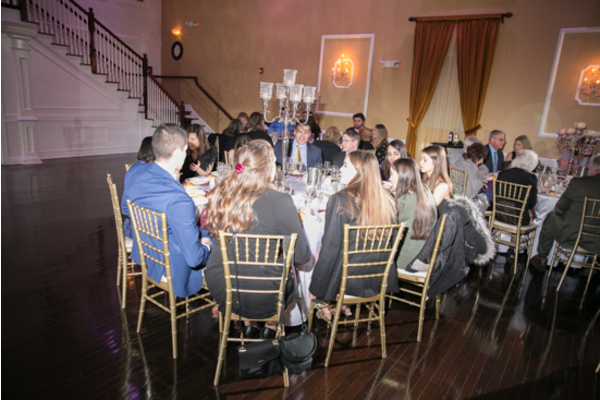 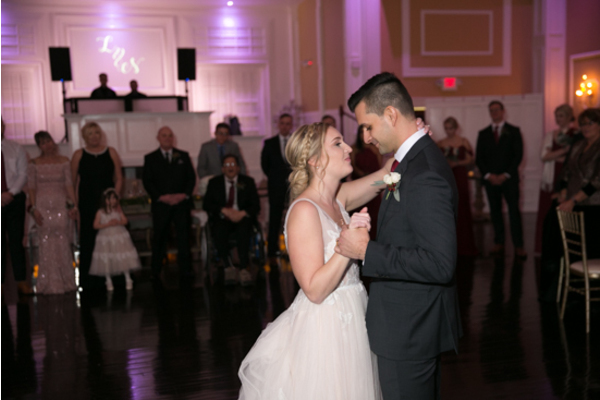 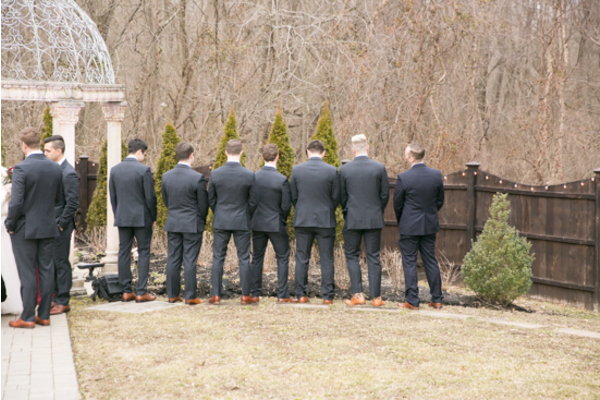 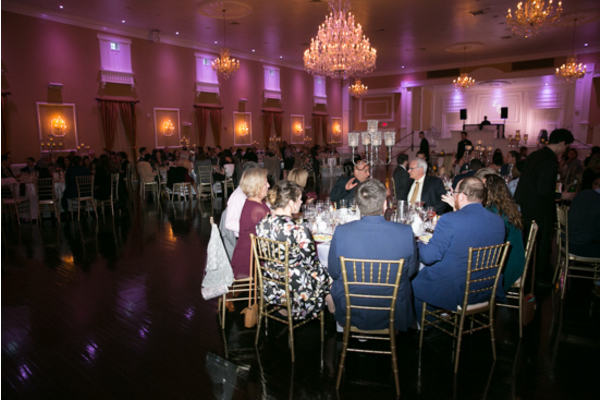 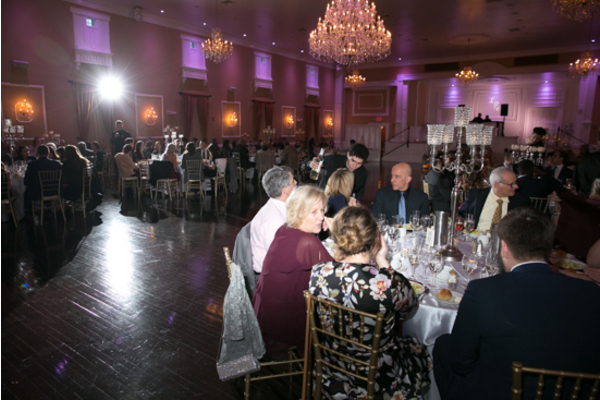 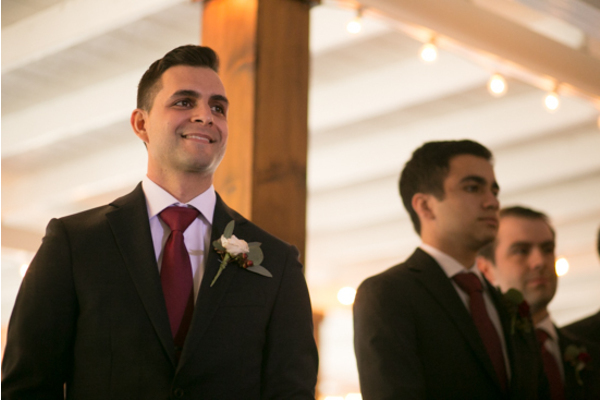 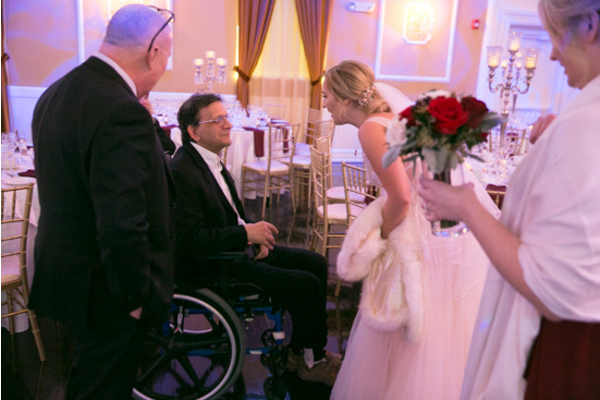 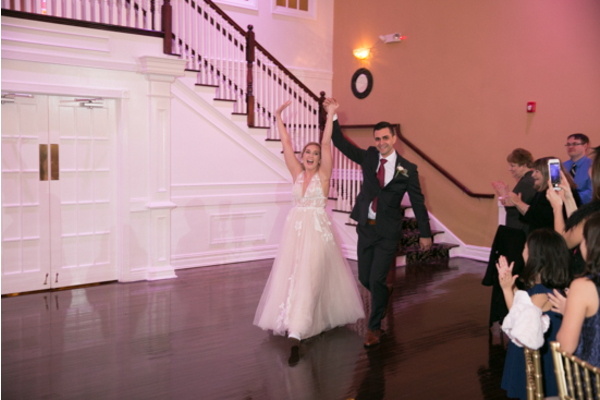 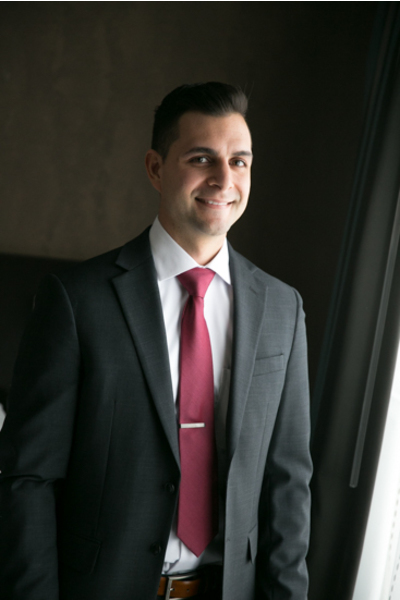 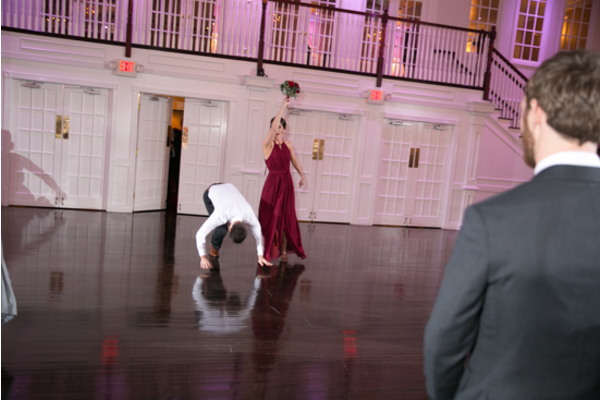 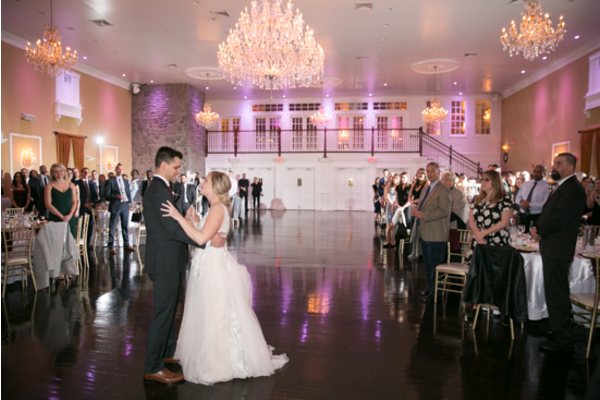 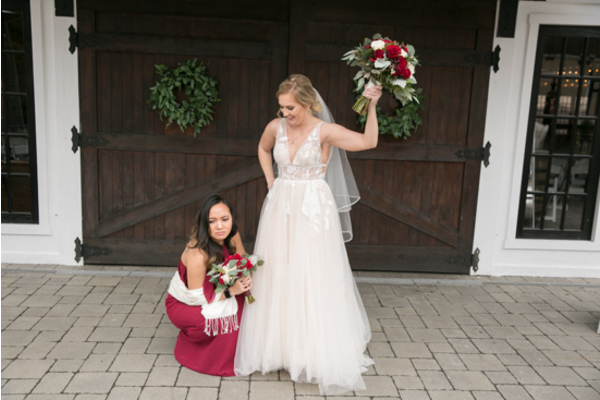 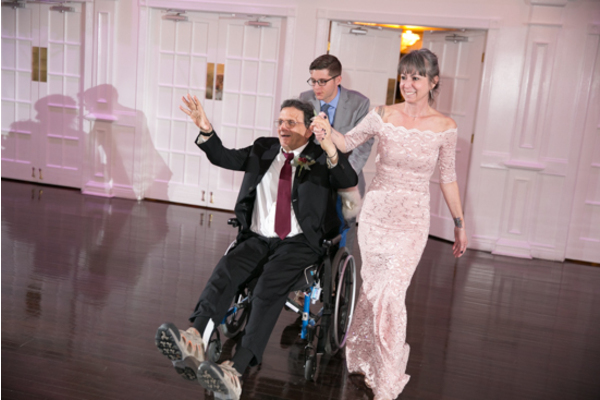 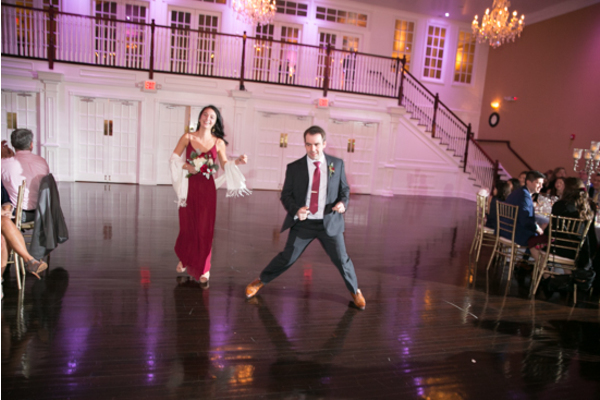 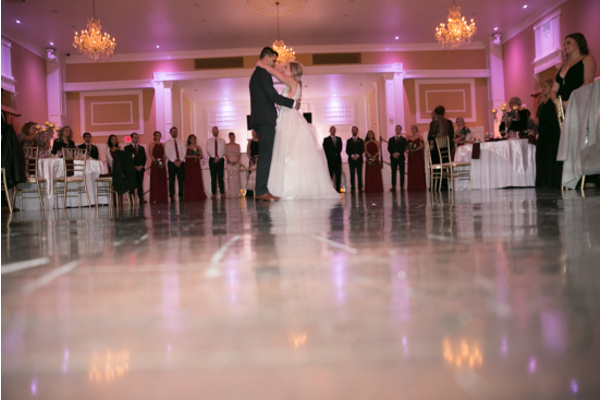 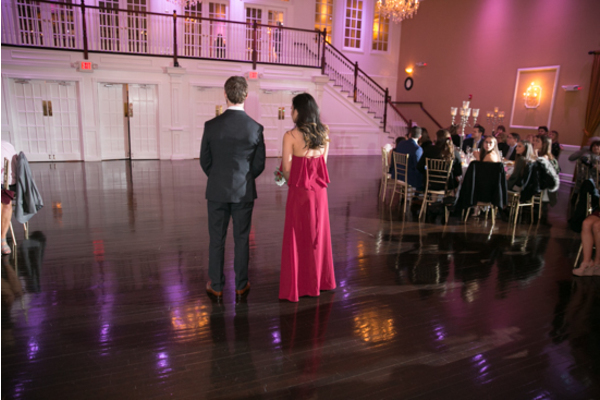 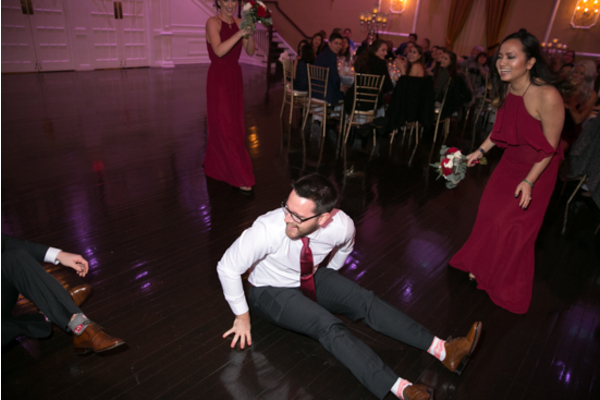 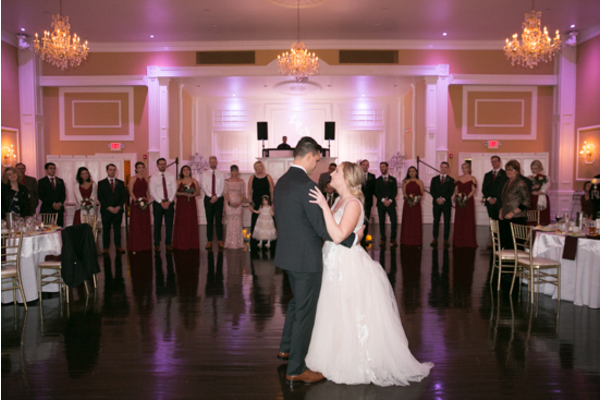 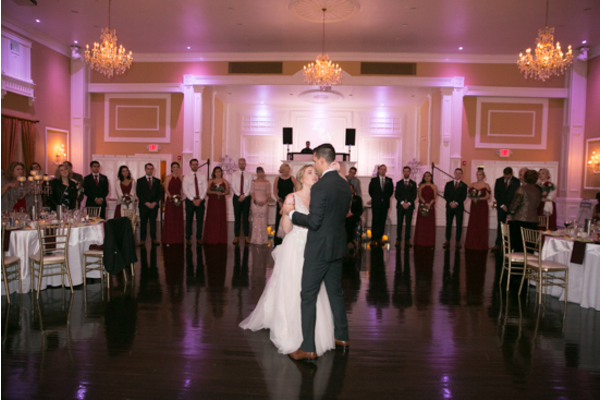 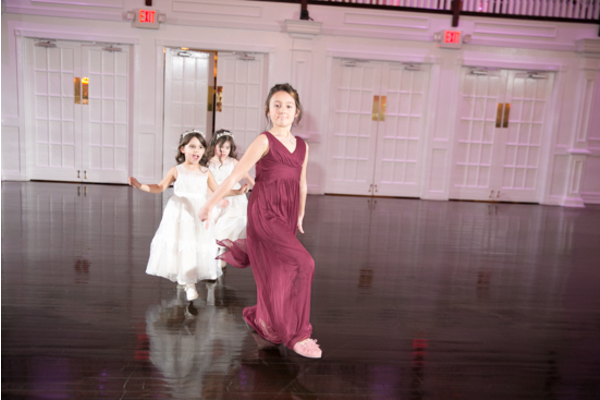 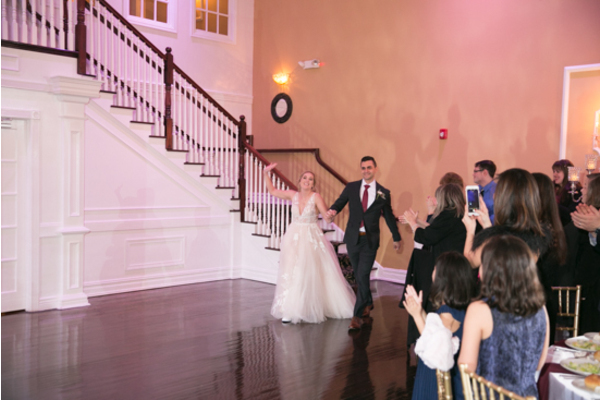 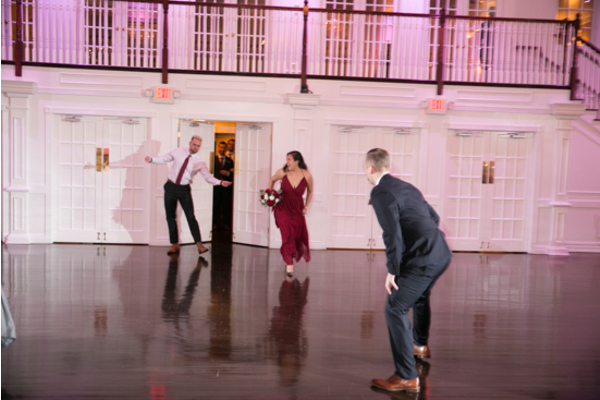 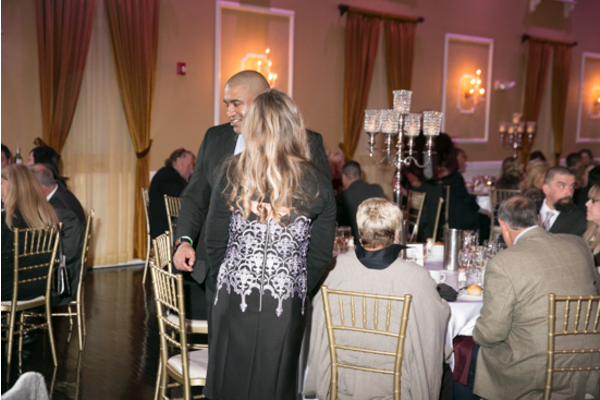 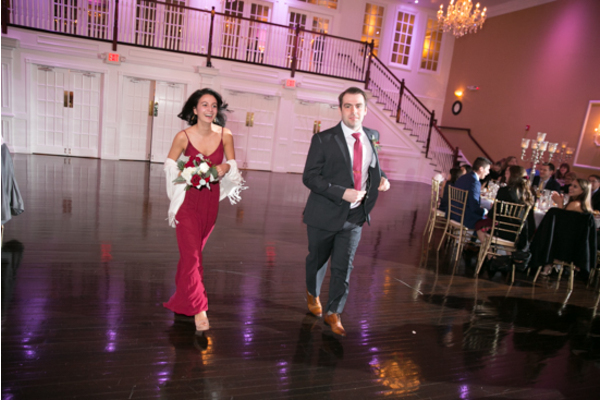 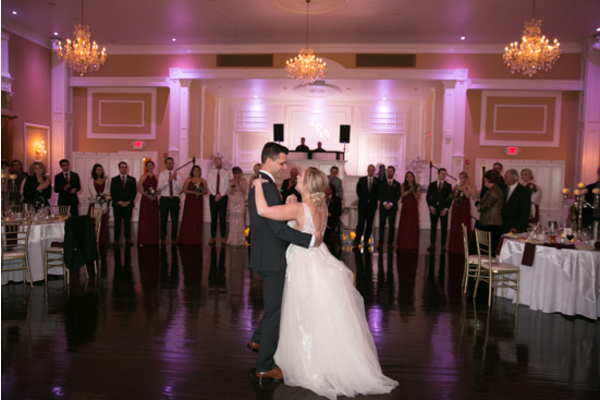 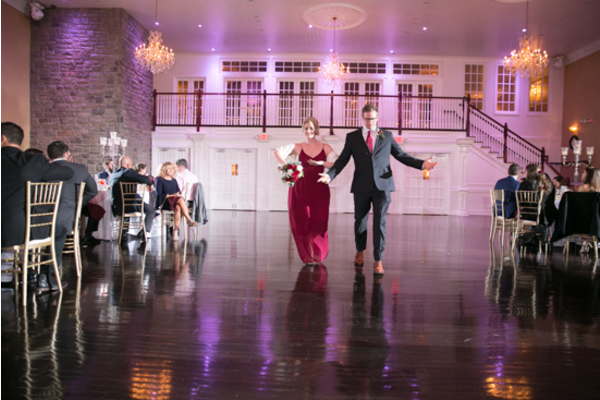 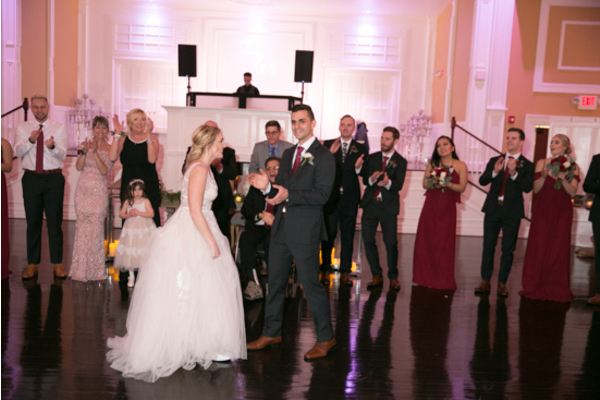 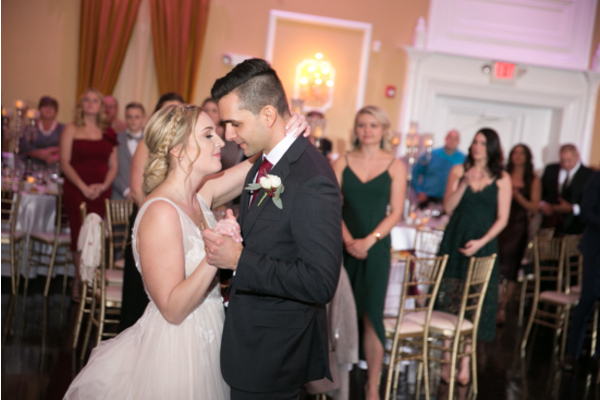 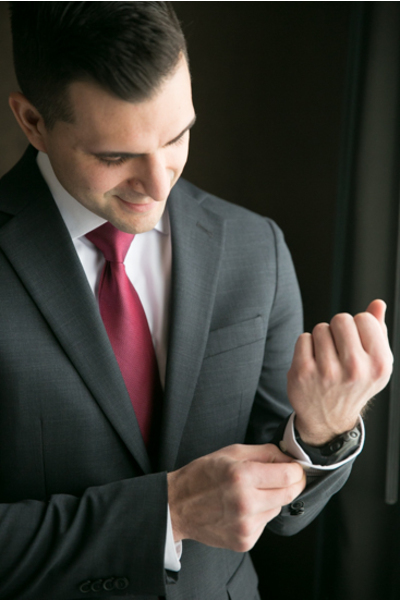 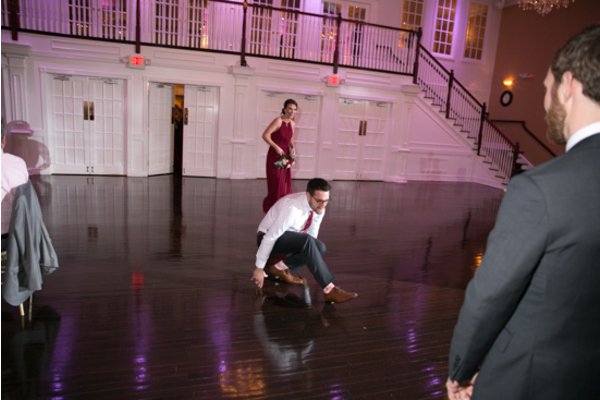 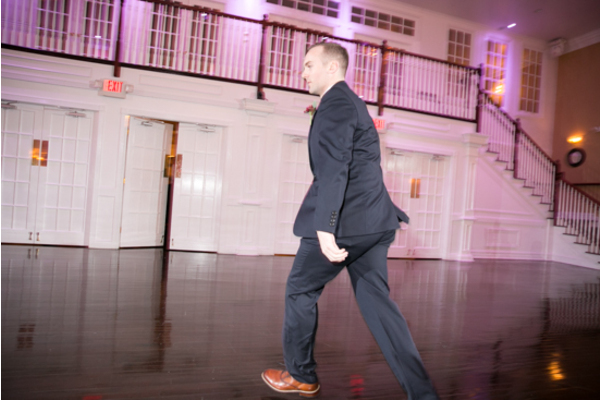 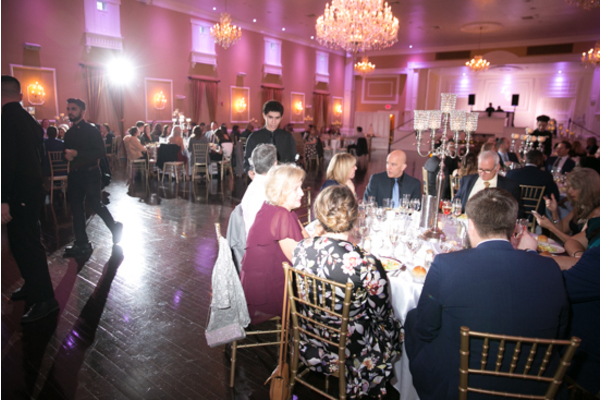 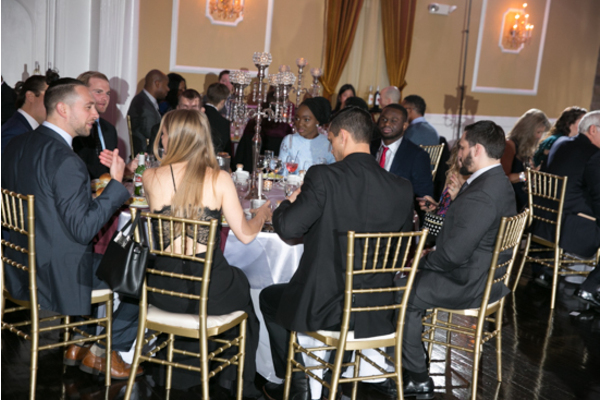 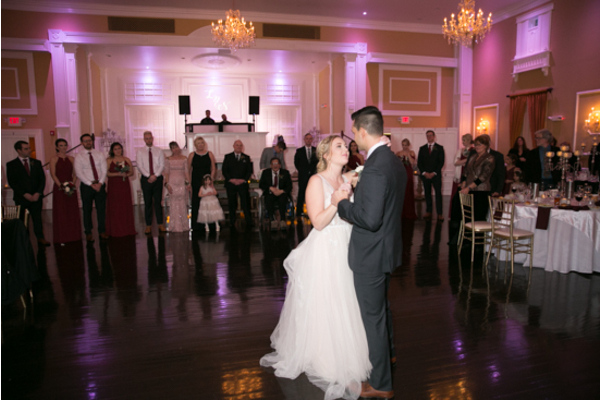 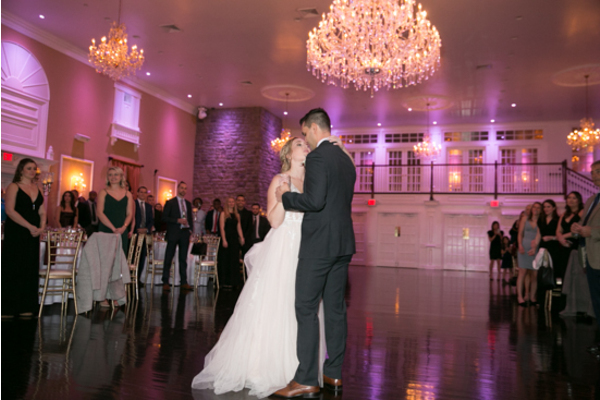 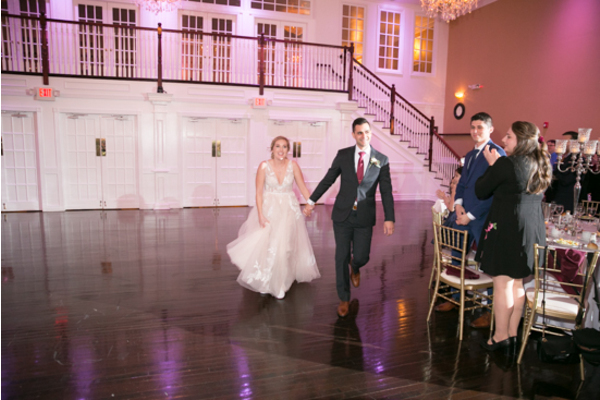 Our NJ Wedding Photographer had such a great time snapping photos all night of the lively guests on the dance floor and enjoying the wedding night treats! 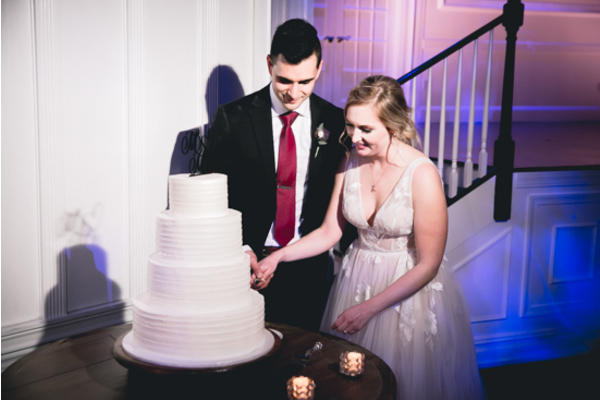 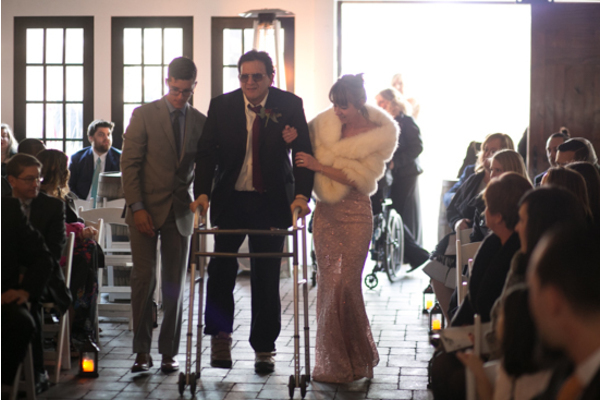 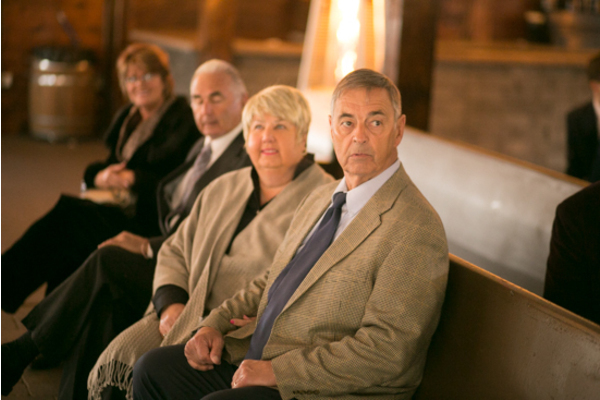 To end the night, the newlyweds shared a slice of their four-tier cake and celebrated the final moments surrounded by loved ones. 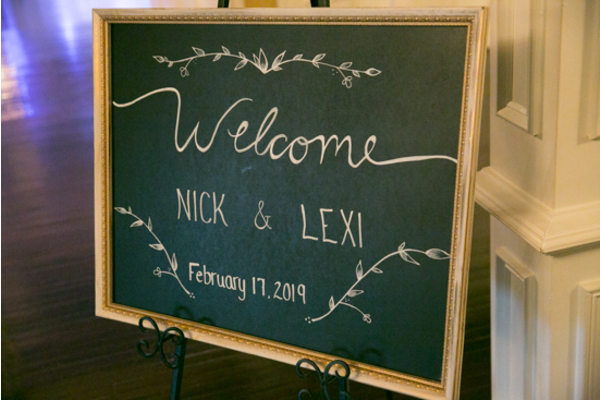 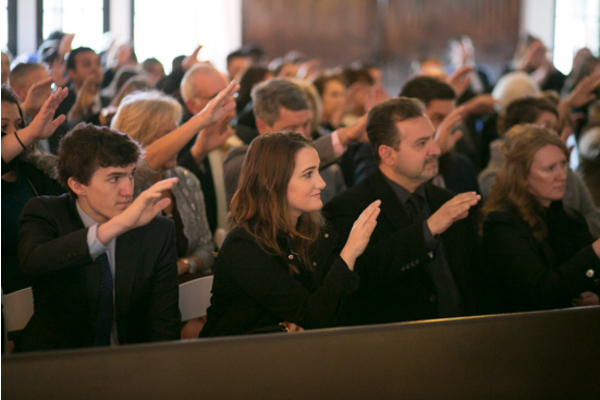 Congratulations, again, to Lexi and Nick. 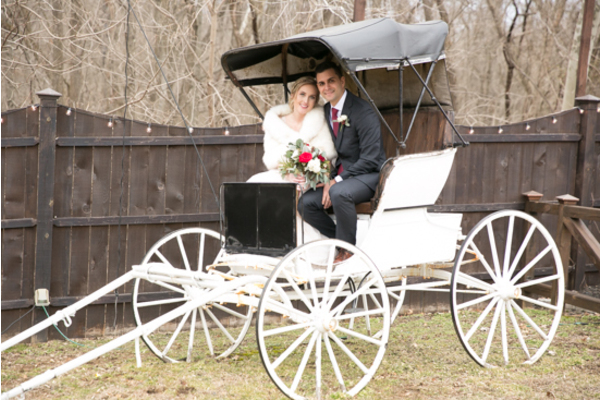 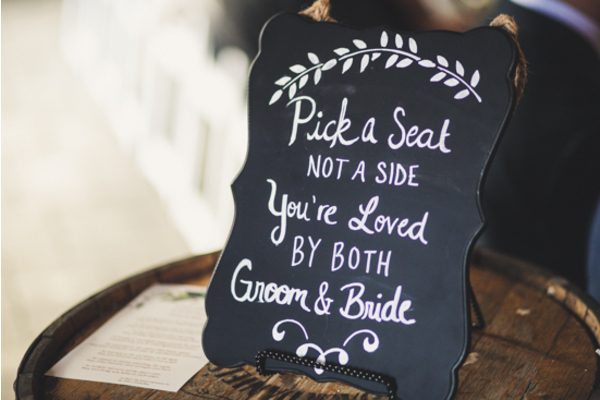 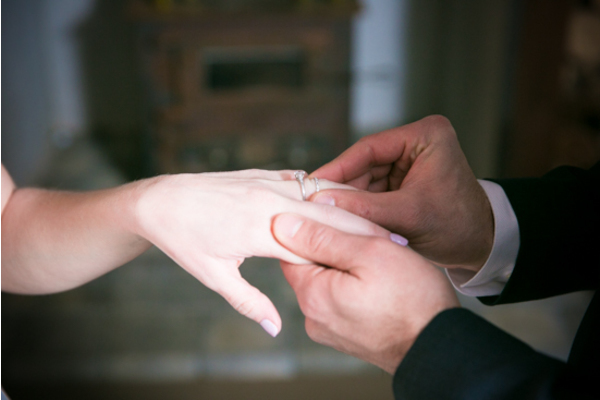 Here’s to happily ever after!